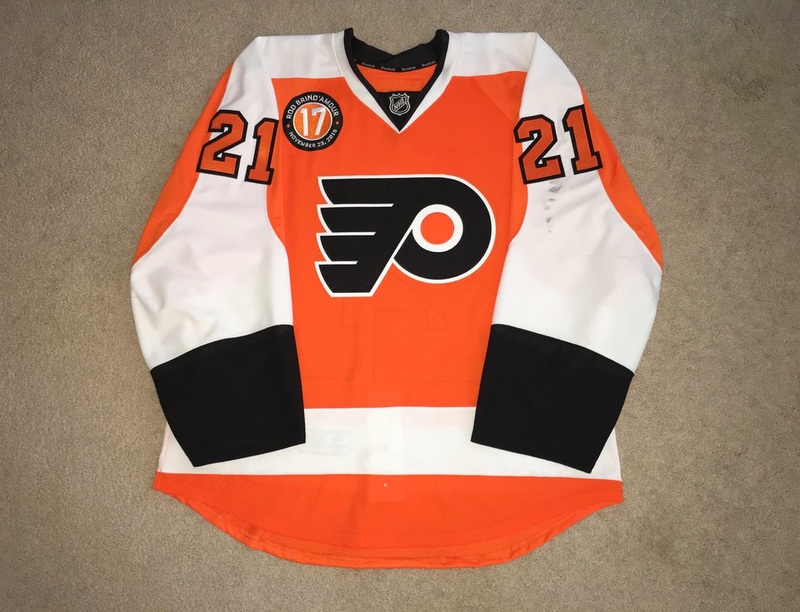 This page is dedicated to some great game-worn jerseys that have moved on from my collection. 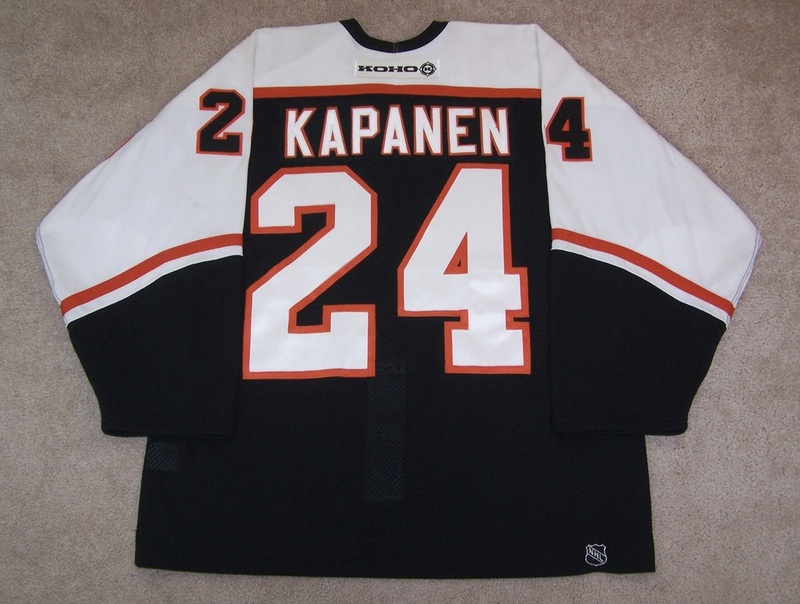 This jersey was worn by Kapanen at the onset of his second season with the Flyers. There are a few stick marks trough the crest and sweat staining around the collar. The lower front hem of the jersey has a few burns as well. The right sleeve features three stick marks and a 1'' burn mark on the elbow area. The left sleeve has a few more stick marks and blue dasher paint next to the #4. The back of the jersey shows even wear with a small stick mark on the #2. Light wear throughout. Stick and puck marks on front. Small un-repaired hole above 37 on the left arm. Some light board burns in the elbow areas. 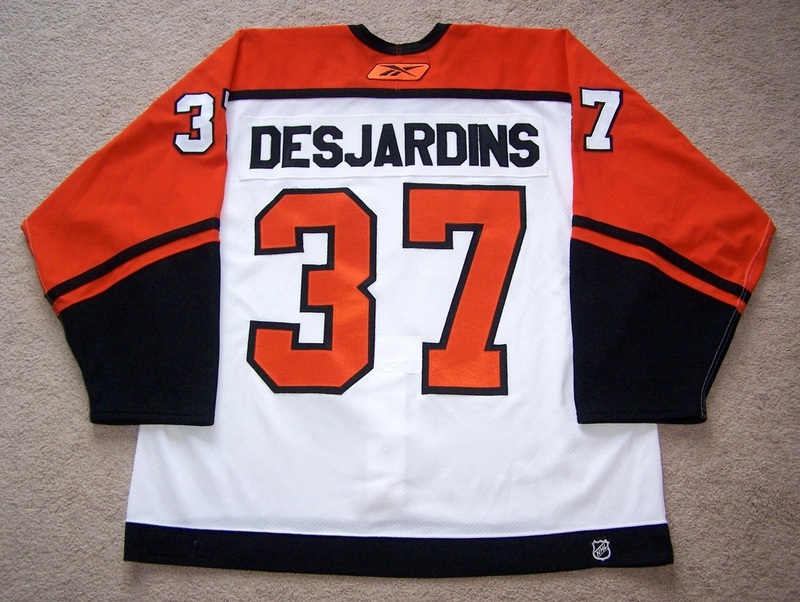 From Desjardins' last season as a Flyer. 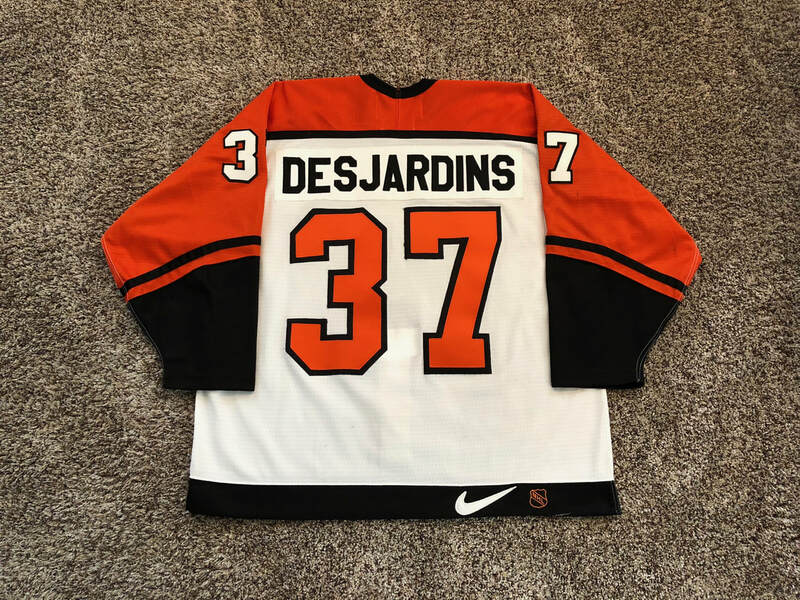 ​Eric Desjardins 1996-1997 Home Jersey w / "A"
The previous owner of this jersey states that he won this one during a Fan Appreciation Night for season ticket holders during the 96-97 season. 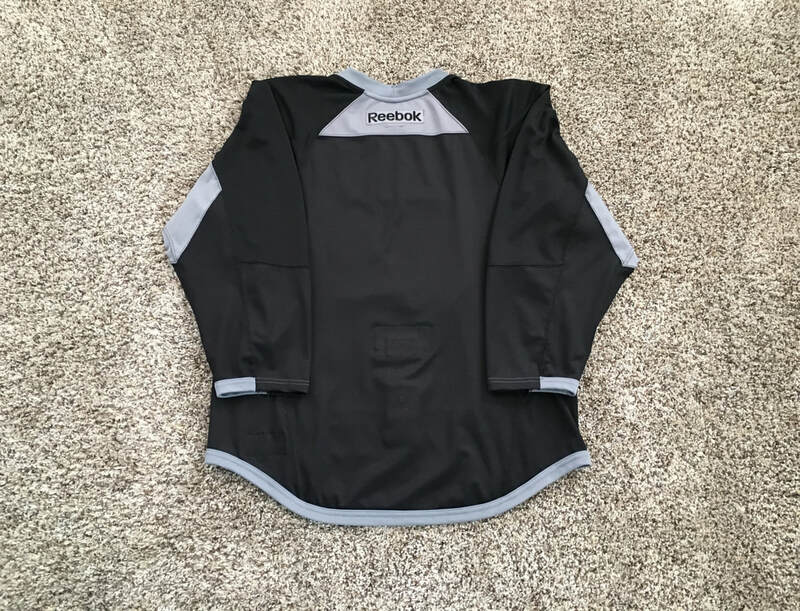 This "shirts off their backs" promotional jersey features decent wear with the front of the jersey exhibiting about fourteen black markings, fabric pulls, and the alternate captains "A" sewn to the upper left chest area. The left arm shows five board burns, two black marks, and some blue paint on the arm #7. The right arm has about six board burns and four black markings. 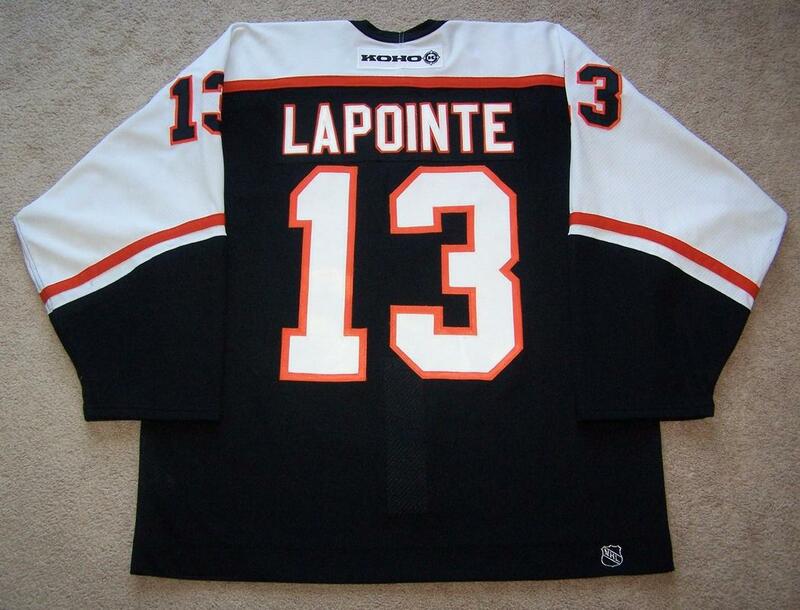 The rear of the jersey shows two black markings and fabric pulls. The inside of the jersey has all of the proper tagging with "37" penned on the Nike size tag in black sharpie. The jersey was signed after the third period by Desjardins on the upper middle chest area above the crest. This jersey shows very light wear with a small 3/4" black stick / puck mark on the from under the Flyers crest. The left sleeve has a few fabric pulls next to the sleeve #1. Additionally, there are a few loose threads on the top of the crest. Chris Pronger 2010 Winter Classic Jersey w/ "A"
​ This jersey was worn on the ice for team pictures and practice on 12-31-09 and again on 1-1-10 during the pre game warm up. 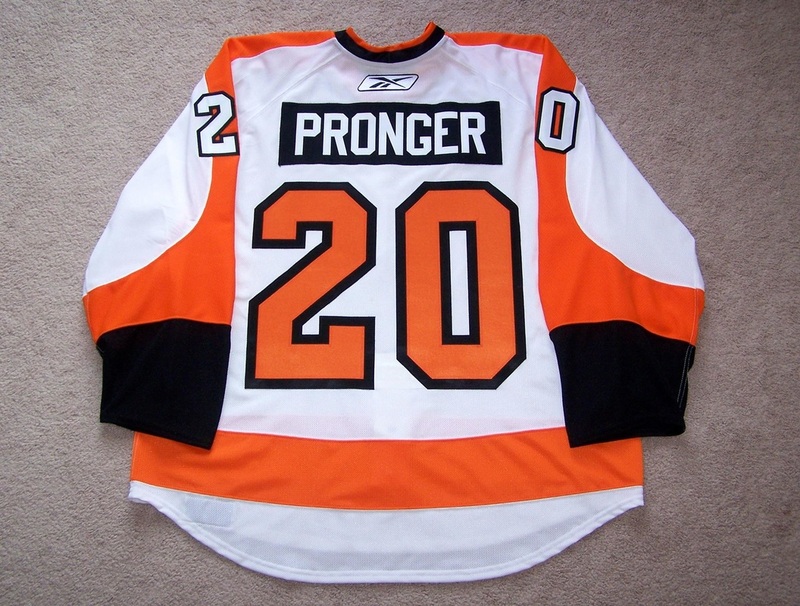 This is the jersey Pronger was wearing when Darren Pang interviewed him before the game. Jersey has minimal wear. 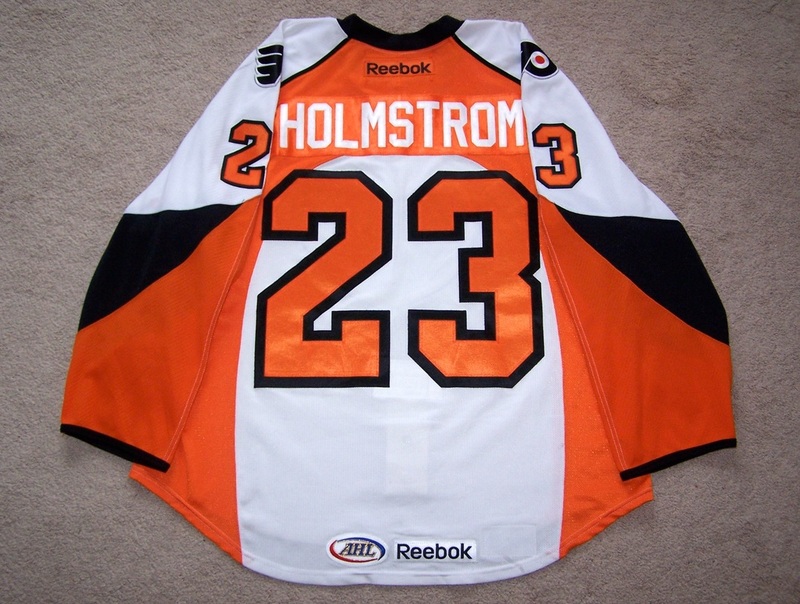 ​ This home promotional set jersey was worn during a 4 to 1 win over the Nashville Predators on 3/7/09. It is signed on the rear #8 as were all of the jerseys after this "Shirt off of their backs" promotional game. Richards netted his 25th goal of the year in the second period on a power play while wearing this jersey. The wear is decent on this one-game wonder. 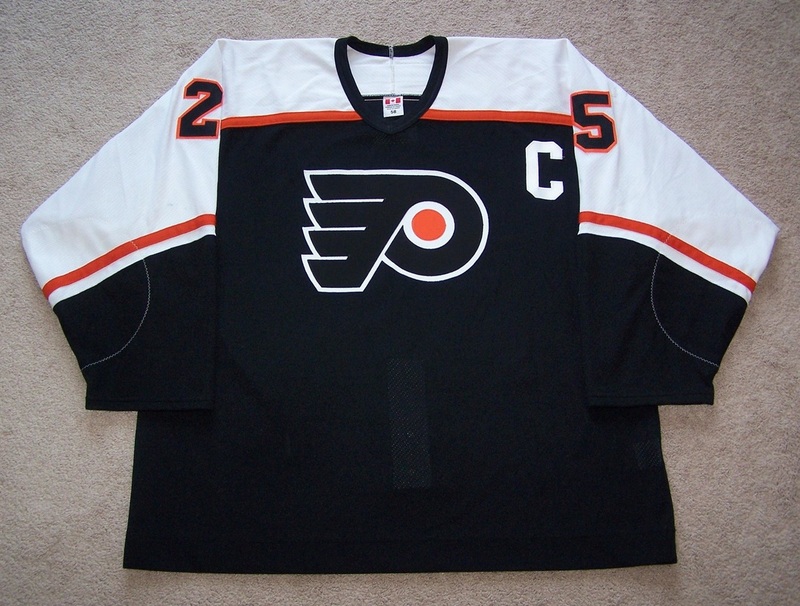 The front of the jersey has some staining on the right lower portion of the captains "C" and some staining on the upper white outline of the crest. The right shoulder features some sweat stains and the right arm has a black mark on the elbow area and loose threads on the sleeve numbers. The left arm has 4 scattered black markings, a 1/2" fabric pull, black marks on the elbow, and some loose threads on the arm numbers. The rear of the jersey shows even wear. 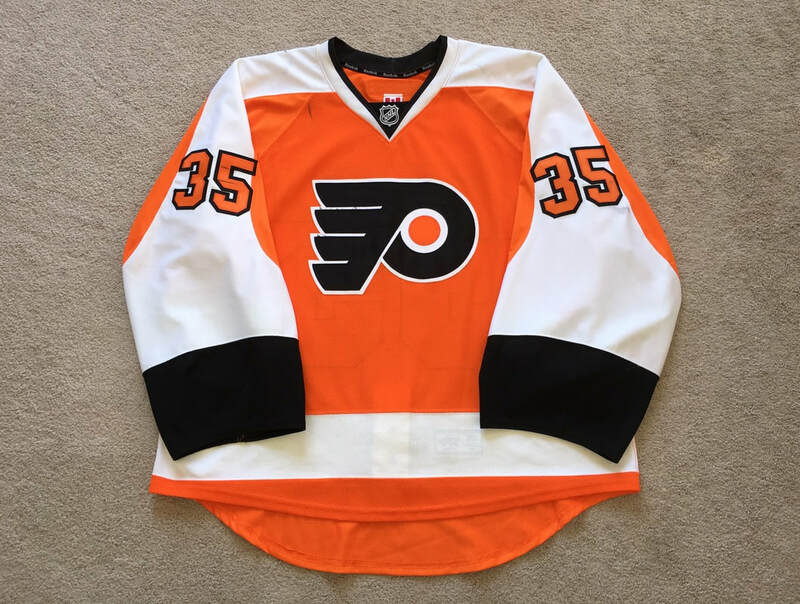 There are a couple alterations to the jersey as both sleeve ends are hemmed about 1" and the tips of the NHL shield on the collar are cut off. 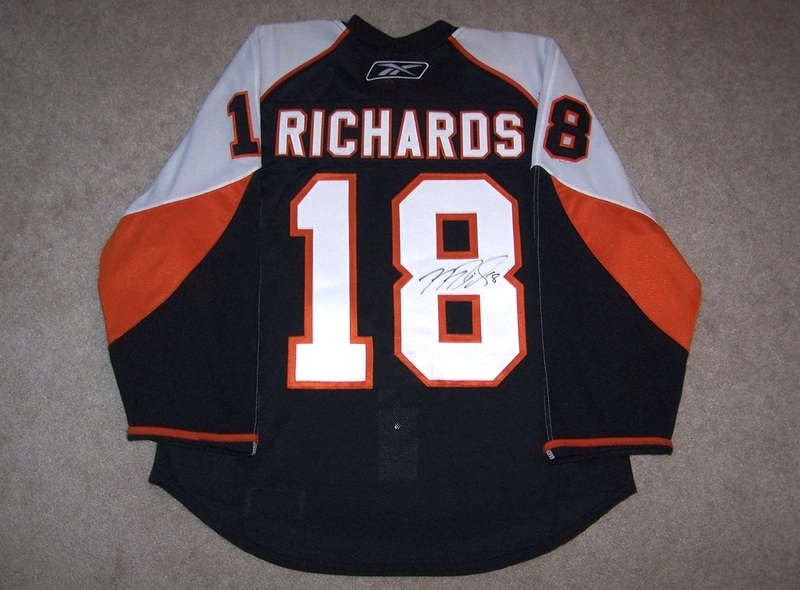 Both alterations are consistent with other Richards gamers from the 08-09 season. Richards would go on to score 30 goals and added 50 assists for 80 points during his first year as a Flyers captain in 08-09. 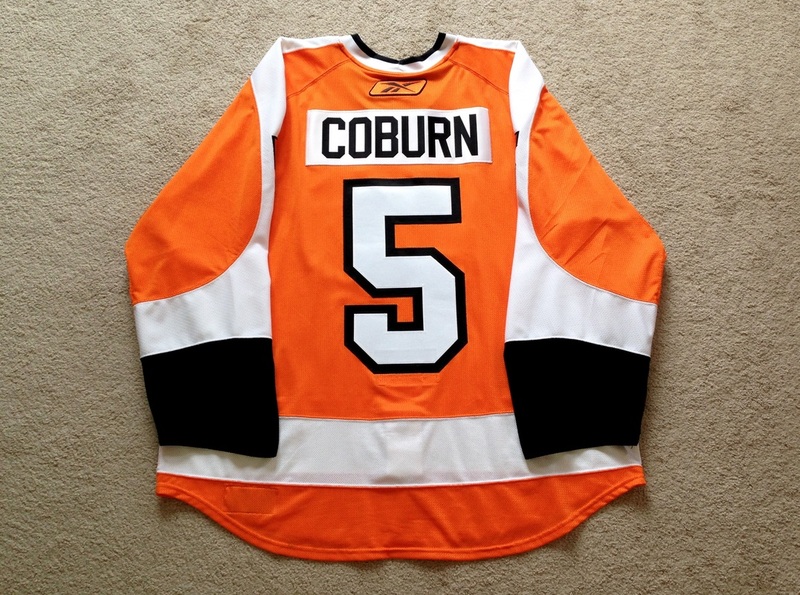 This jersey was worn by Coburn during the 2009 Stanley Cup Playoffs. 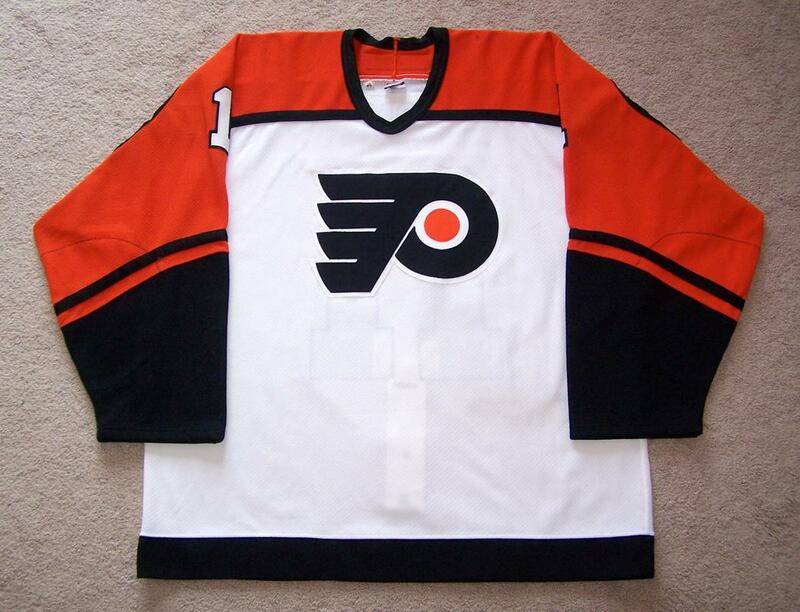 The Flyers would make this alternate jersey their home jersey for the series against Pittsburgh. 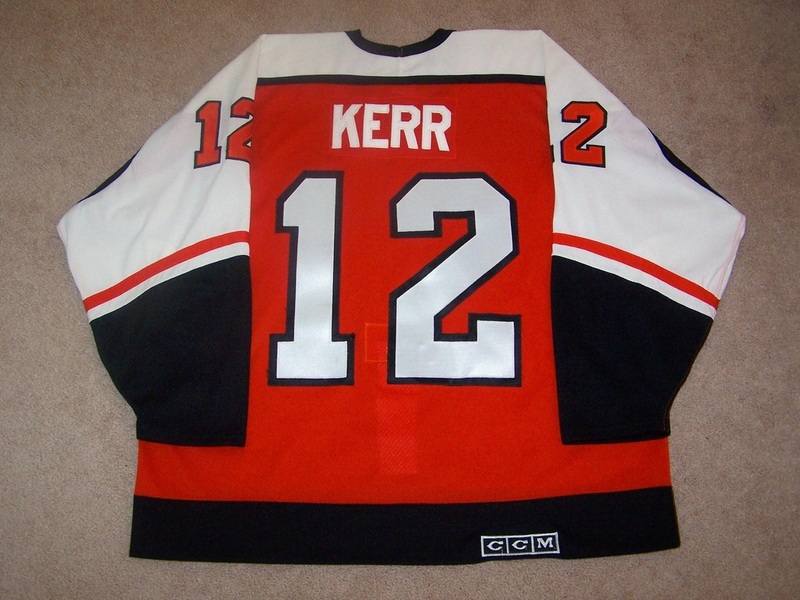 Jersey features light wear with a few light black markings on the left sleeve and some red dasher paint on the right sleeve. The tips of the NHL collar sheild have been cut off by the equipment manager. 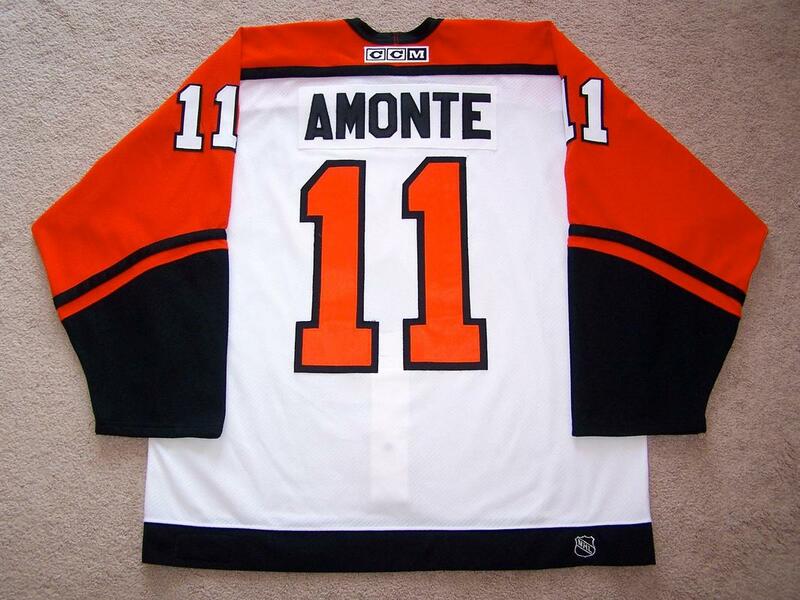 ​ This jersey was worn on 11/1/2003 during the 5th Annual Hockey Hall of Fame game vs. the Toronto Maple Leafs. The Flyers would win the game that day in convincing fashion 7-1. 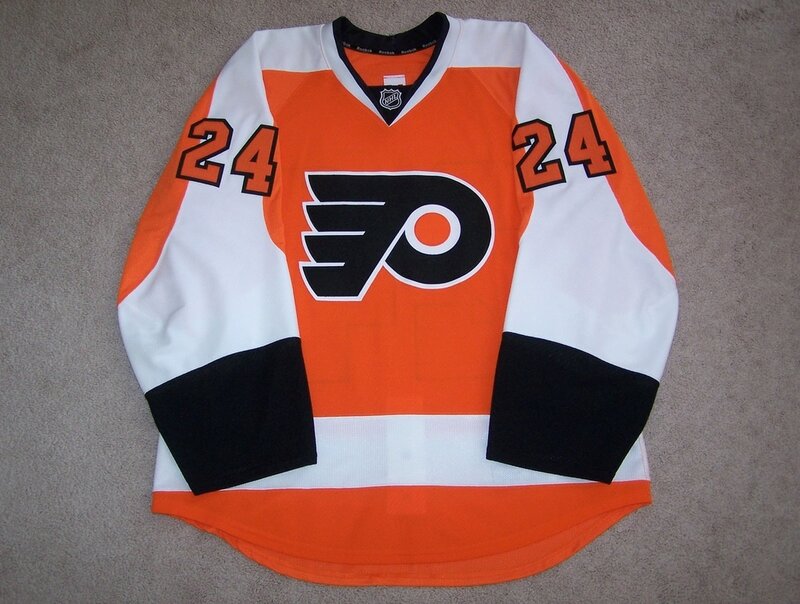 Claude assisted Kim Johnsson on the Flyers second goal of the day while wearing this jersey. A 5th Annual HHOF patch is attached to the upper left chest area. Wear is light as would be expected on a one gamer but some stick/puck marks can be found on the sleeve areas. There is a fabric pull on the front right side of the jersey. Signed by Lapointe on the fight strap. 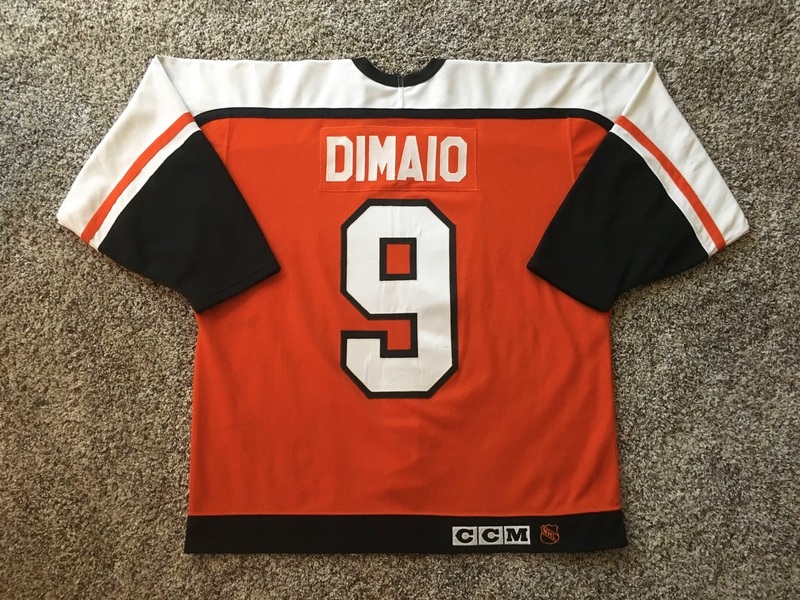 This road jersey was worn by Dimaio during either the 1994-95 or 1995-96 season. The wear consists of un-repaired holes, black markings, board burns, and inner pilling. 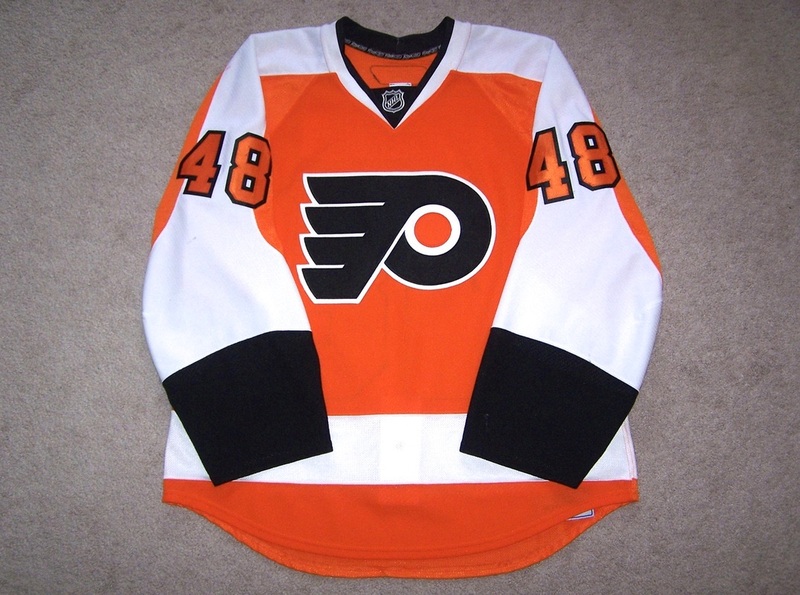 ​ Orange home jersey worn by Briere from 10/3/2009 - 12/10/2009. 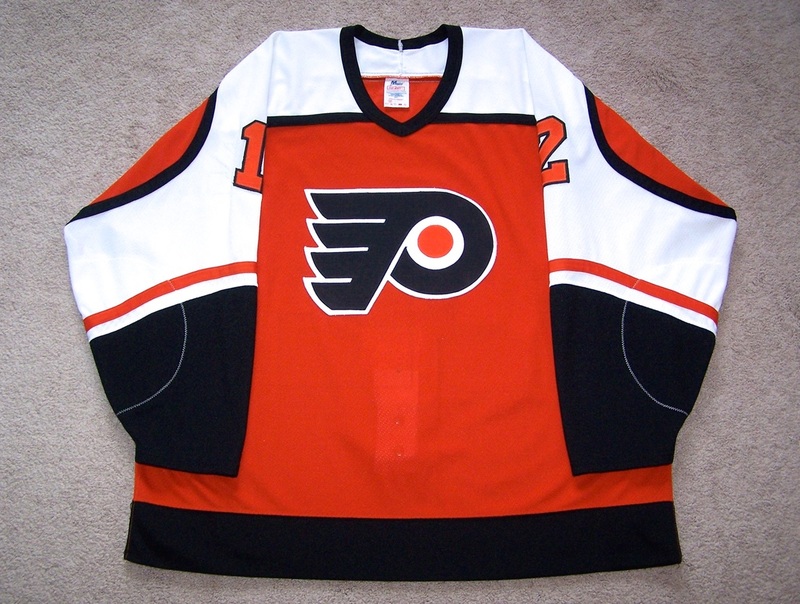 Worn for a total of 13 games, the jersey exhibits lighter wear. The front shows nice even wear with slight puckering to the crest and a black stick mark on the upper left chest area. The right sleeve a a few black markings and a 1" burn on the cuff area. The left sleeve has a small black mark and some red board paint on the upper arm area. The rear of the jersey also shows even wear with some loose threads and some puckering to the rear numbers. 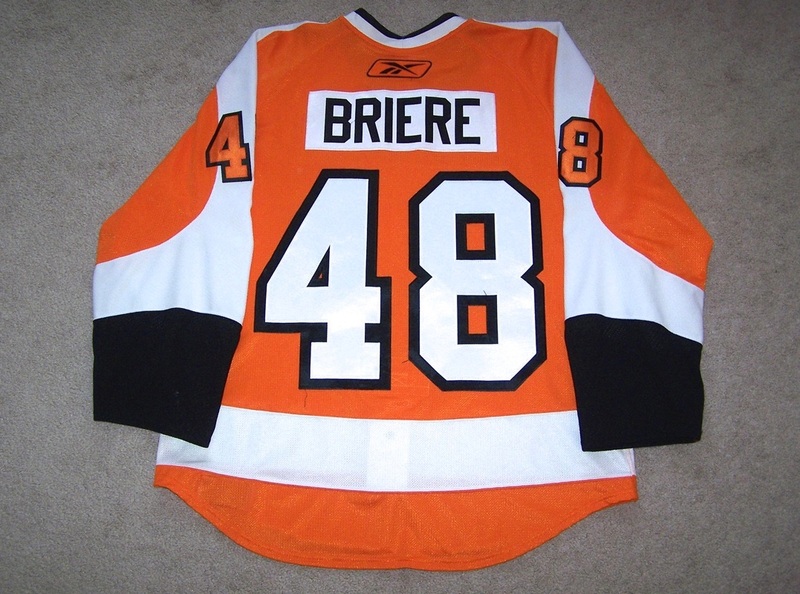 Briere scored 7 goals and added 4 assists for 11 points while wearing this jersey. 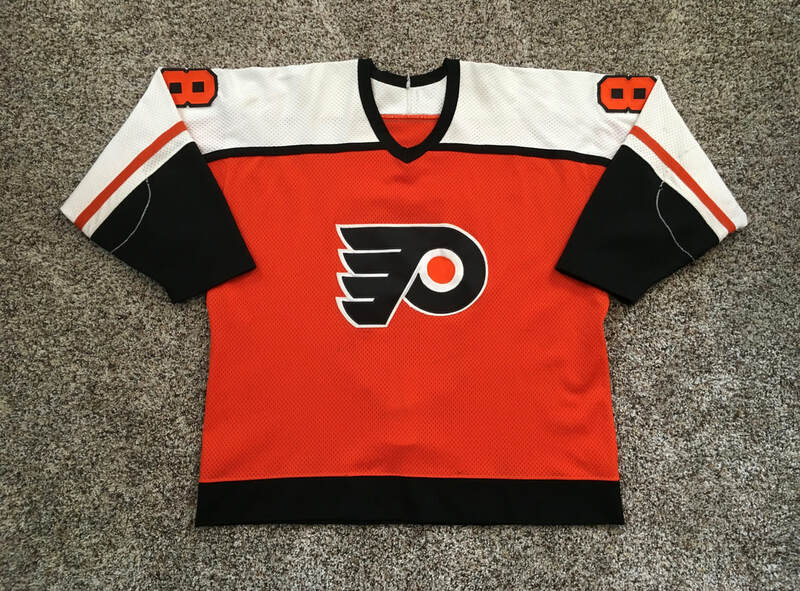 ​ This regular season road jersey was either worn in the beginning or towards the end of the 86-87 season. 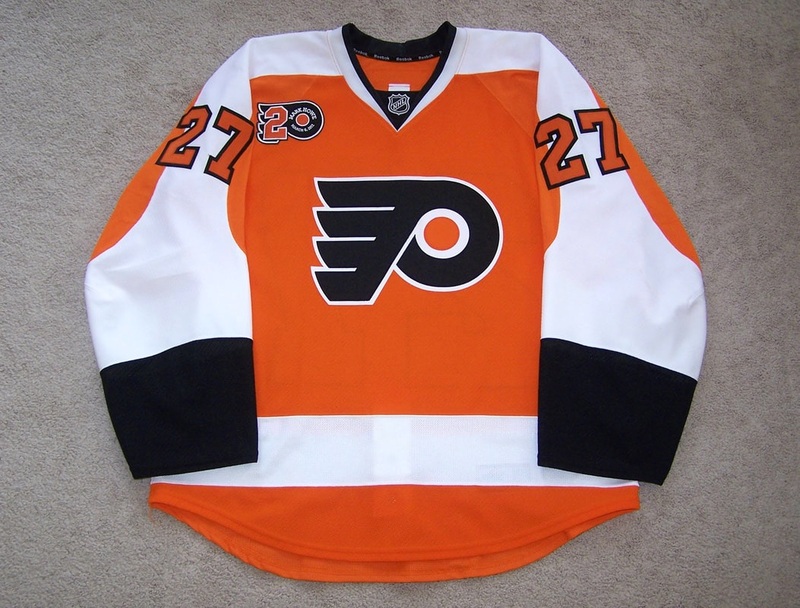 Wear is on the lighter side and the front of the jersey features two black stick marks on the lower right side, a few other black markings on the lower middle, and some staining on the lower left side. There is a small black mark on the white part of the crest and some staining in the white circular area as well. 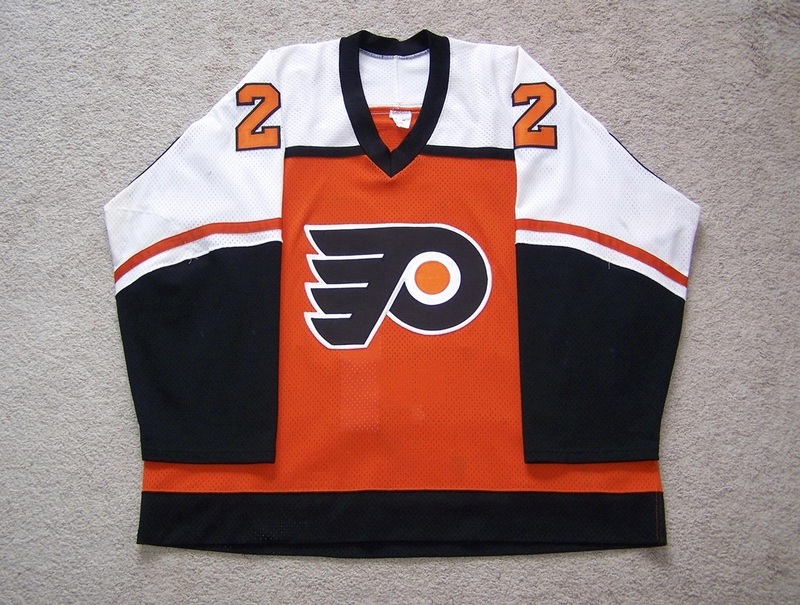 The left sleeve shows a few black markings, a couple of stains near the cuff area, 4 smaller board burns on the black cuff area, and 2 black marks on one of the sleeve #2's. The right sleeve exhibits about 5 black markings and a couple areas of staining/discoloration. The rear of the jersey features even wear with two stick marks on the left #2 and a re-positioned fight strap that has been reinforced by the equipment manager with a heavy thread. 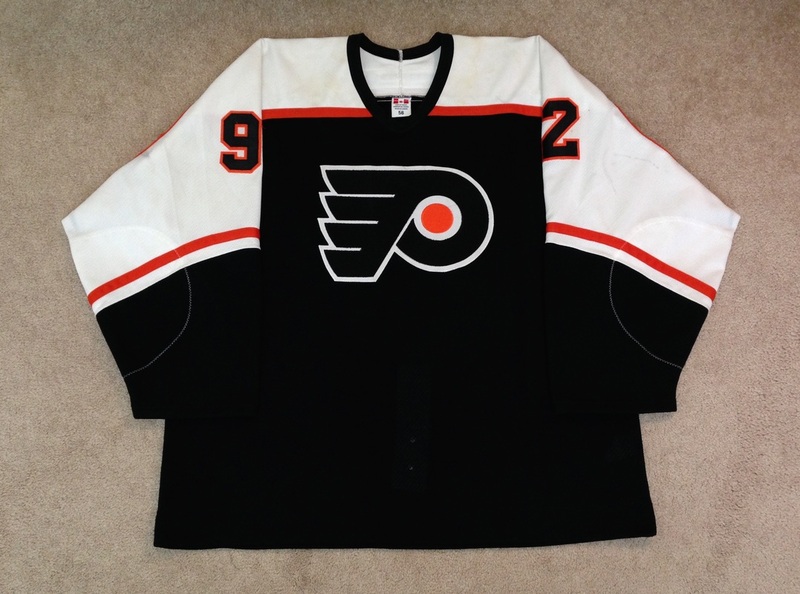 This home white air-knit gamer by CCM was worn by Rick Tocchet during the 2000-01 NHL season. 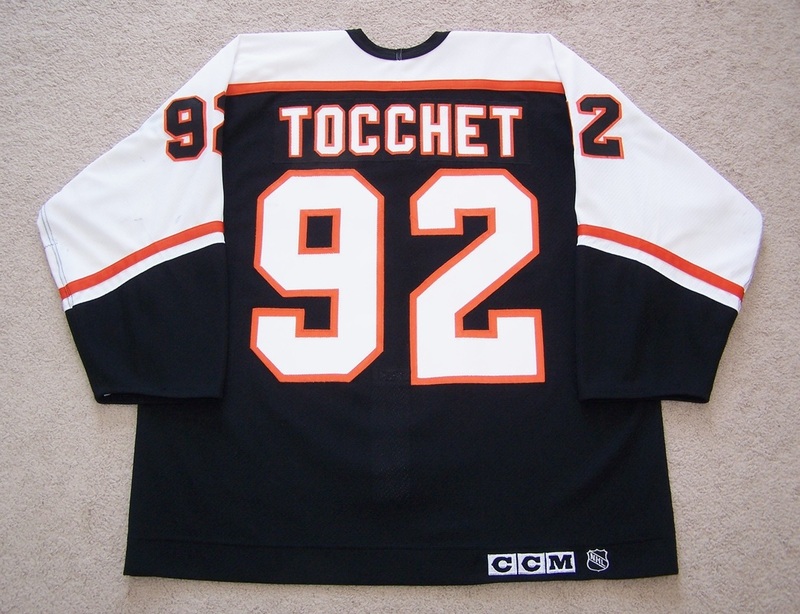 The sleeves on this gamer have been custom shortened for Tocchet. The game wear on this size 56 sweater consists of stick and slash marks, board burns, board paint transfer and inner pilling. Worn during Rick’s final full NHL season. 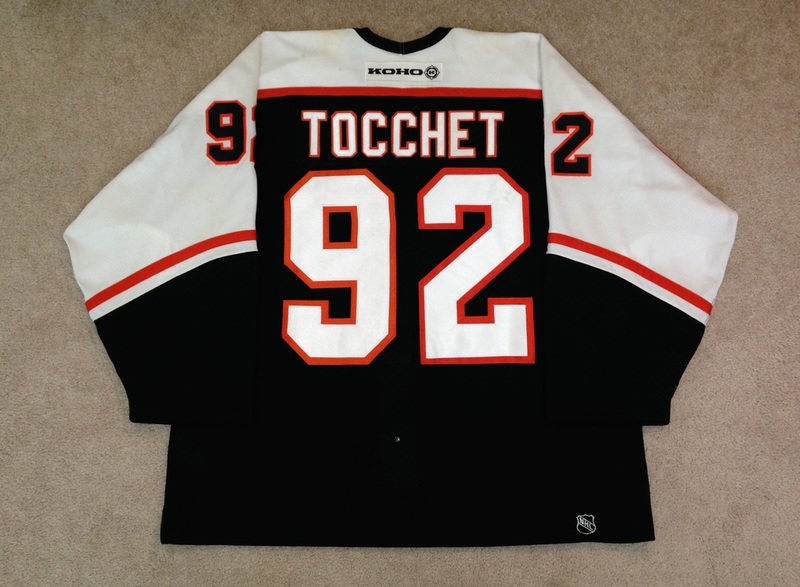 This jersey was worn by Tocchet during the 99-00 season after he was re-aquired by Philadelphia on 3/8/2000. 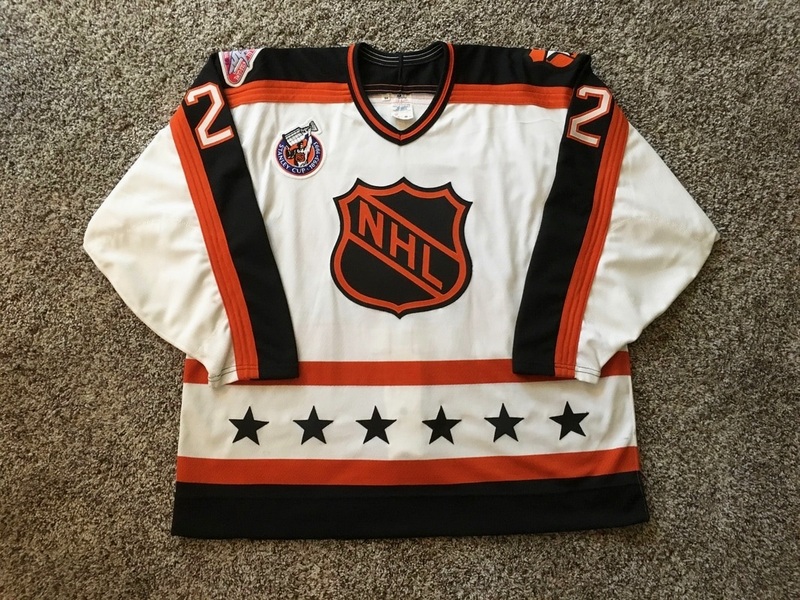 The front of the jersey has 3 tiny holes, 2 slash marks on the lower right side, and features the NHL 2000 patch on the upper right chest. The right sleeve has about 10 black markings on the white area of the sleeve, 2 board burns in the elbow area, and 1 small board burn in the cuff area. The left sleeve has approximately 12 black markings on the white part of the sleeve, and 6 smaller board burns in the elbow area. 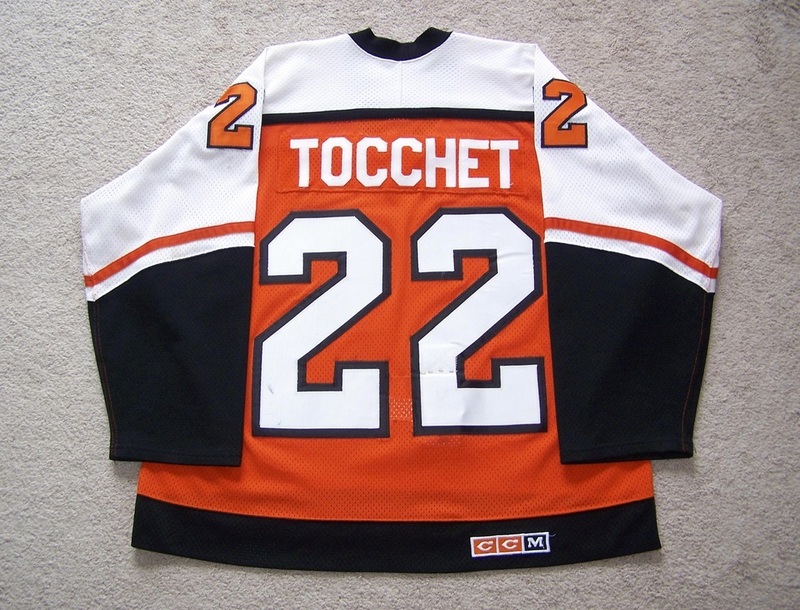 Both sleeves are hemmed/shortened which is a normal alteration for Tocchet in the later years. The rear of the jersey shows 3 black markings on the rear #9 and a slash mark under the #9. The inside of the jersey has very light pilling and a light salting of the fight strap buttons. 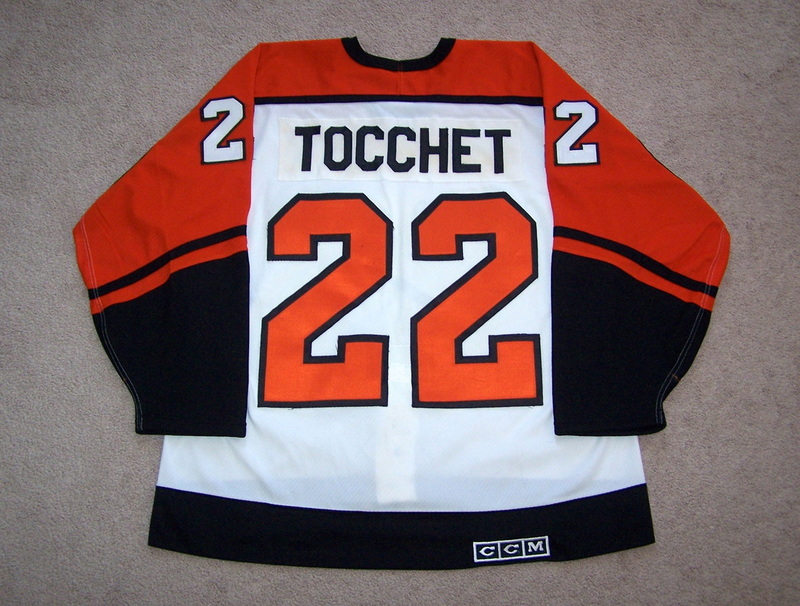 ​ This jersey was worn by Tocchet during an injury shortened 2001-02 season that saw him play in only 14 games. 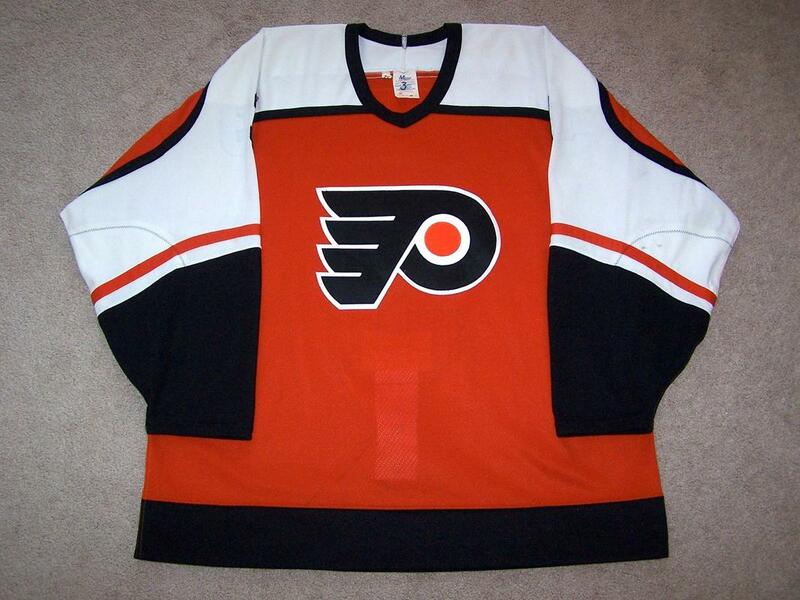 This jersey was worn on the road for 7 of those games and consists of light wear. He would post 2 assists in this jersey before sustaining another season ending injury. 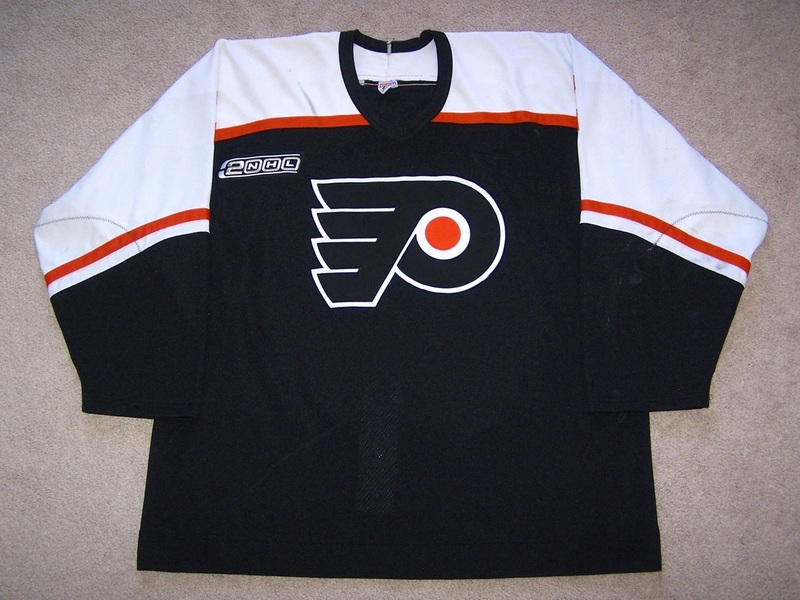 The front of the jersey has two black stick marks on the crest and white tape residue on the right chest area next to the Flyers crest. The right arm shows one black stick/puck mark and some faint red board paint. The left arm exhibits 4 black markings, a slash mark to the sleeve #9, and a small area of red board paint. The collar and shoulder areas have a fair amount of sweat staining throughout. The rear of the jersey shows slight puckering to the rear numbers from washings. The fight strap remains in tact. Iceviolence LOA 2015. 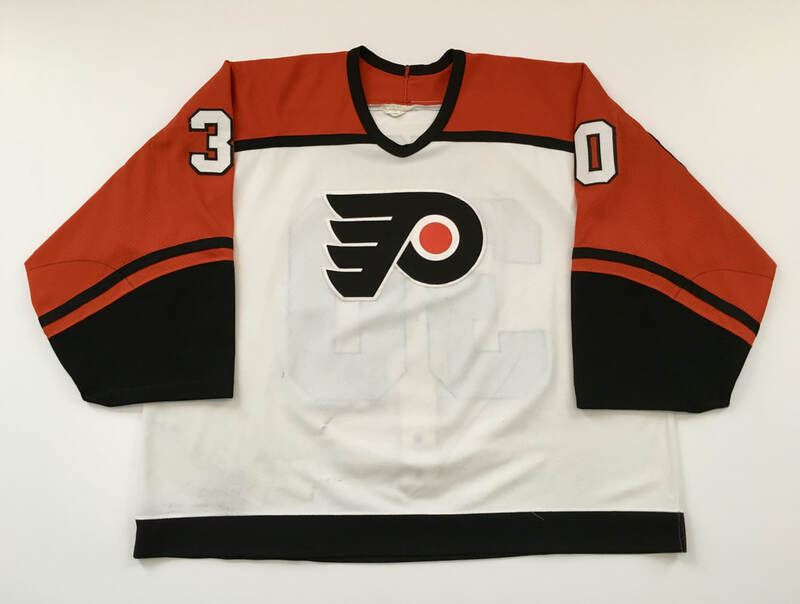 Rick Tocchet 1988-1989 Home Jersey w/ "A"
​ This home jersey was worn by Rick Tocchet during the 1988-89 season and exhibits light overall wear. 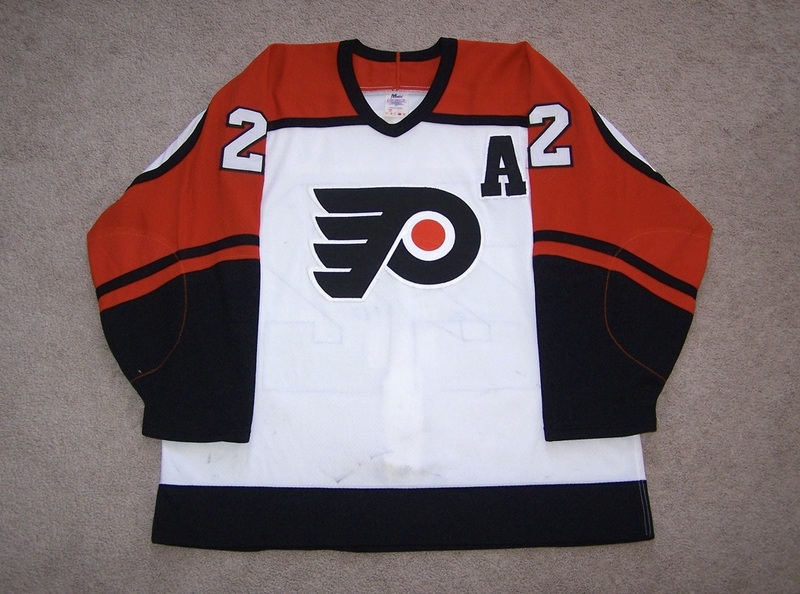 The front of the jersey has approximately 12 black markings, a slash mark through the Flyers crest, and features a hand-sewn "A" on the upper left chest area. The right sleeve has three black markings, one white mark under the sleeve #2, a 1/4" burn in the elbow area, and one additional light burn in the cuff area. The left sleeve shows less wear with one black mark, and one small burn in the cuff area. 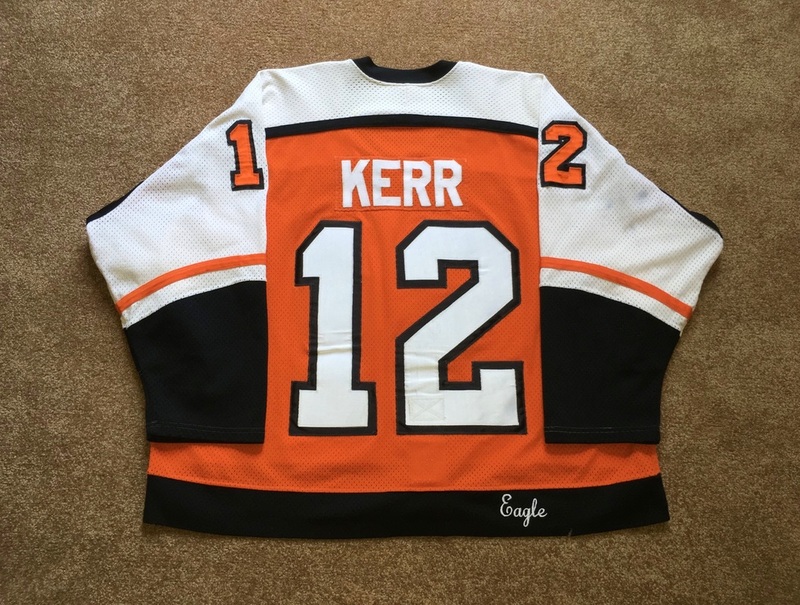 The rear of the jersey has a few black markings on the left #2, a few other scattered black markings throughout, a few loose threads on the letters, and a fair amount of yellowing to the nameplate. 50 is penned on the Maska neck tag. MeiGray LOA December 1, 2009. 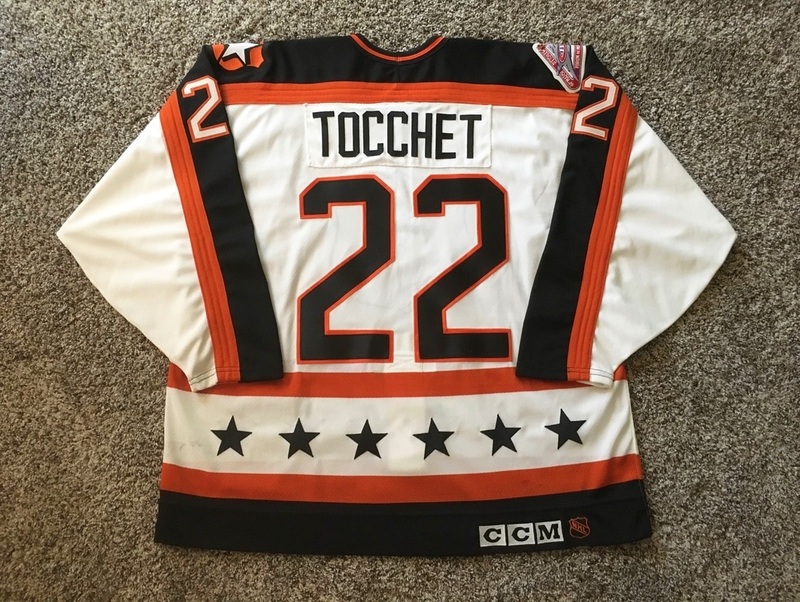 ​ This jersey was worn by Rick Tocchet during the 44th National Hockey League All-Star Game that took place in Montreal, Quebec on 2/6/1993. 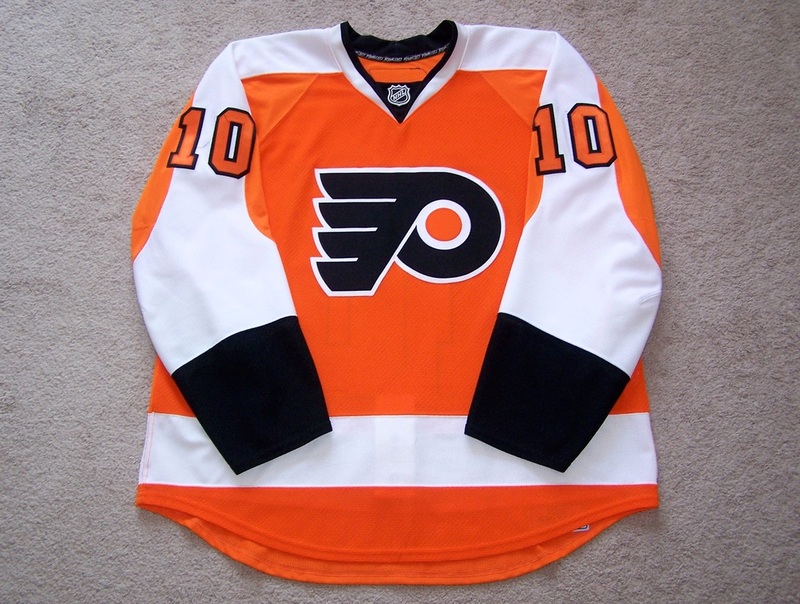 The jersey features light wear with only a few markings. 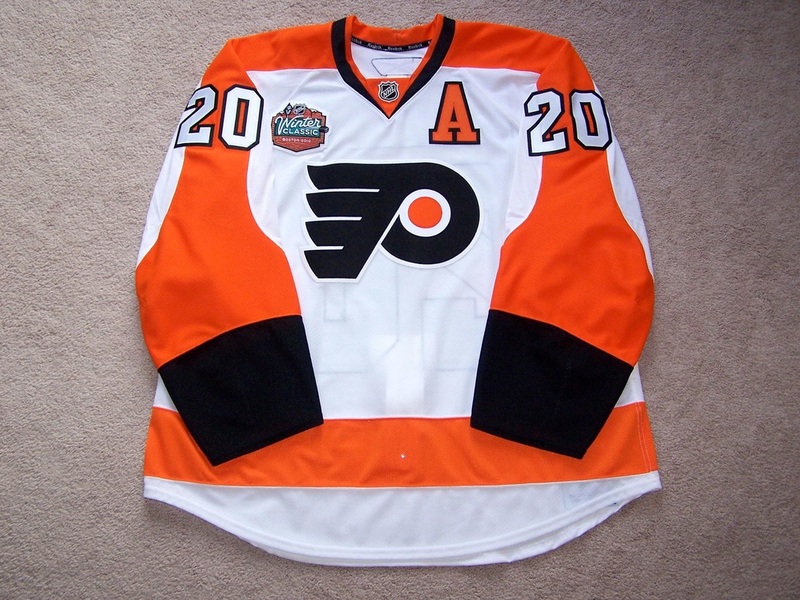 The front of the jersey has the Stanley Cup 100th Anniversary patch sewn to the upper right breast, a light mark on the bottom right hand side, and a small scrape through the crest. The right sleeve has the 44th All-Star game patch sewn above the sleeve numbers and a small red board burn in the elbow area. The left sleeve has a few fabric pulls and another shield/star patch sewn above the arm numbers. The rear of the jersey shows two markings. The bottom left of the jersey has a 4" black scuff and some blue paint transfer. 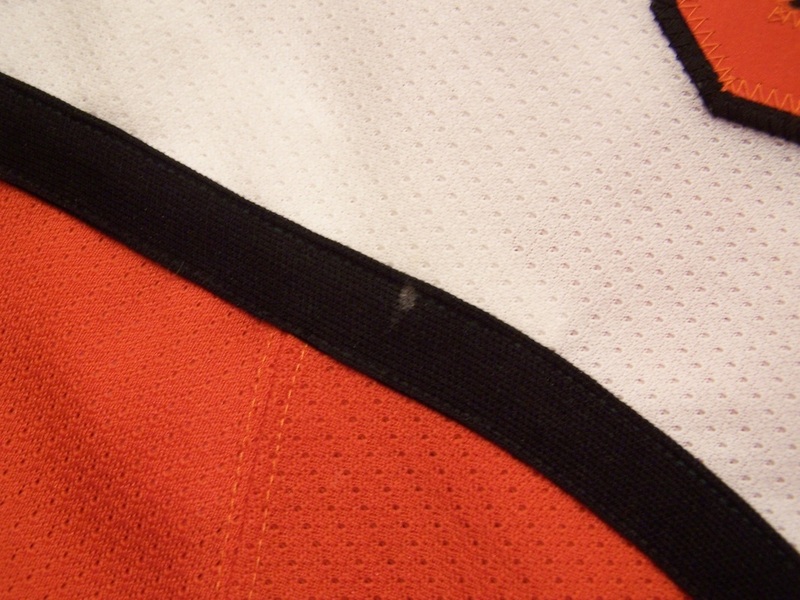 The bottom right of the jersey exhibits wear markings in the lower orange stripe. 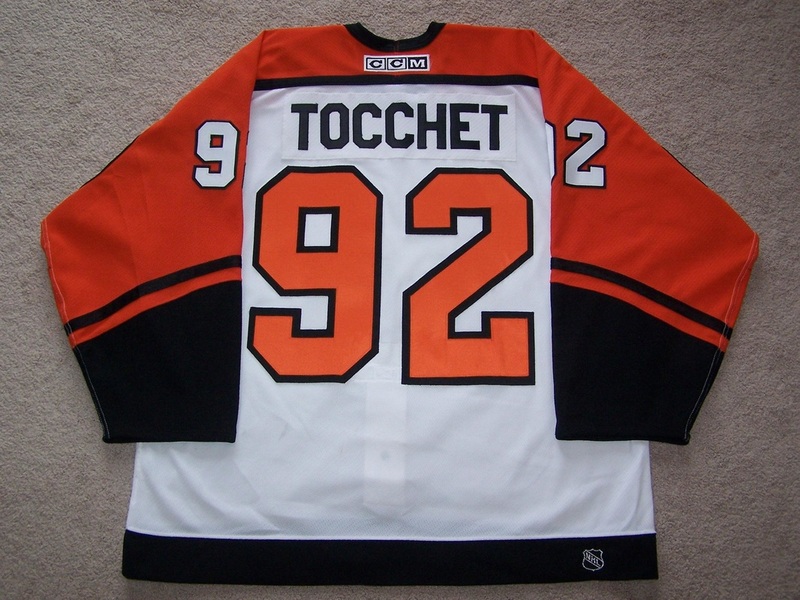 The inside of the jersey has Maska neck tagging, a size 54 fly tag, intact fight strap, and Tocchet's signature behind the crest. Tocchet scored two goals that day as the Wales Conference cruised to a 16-6 victory. 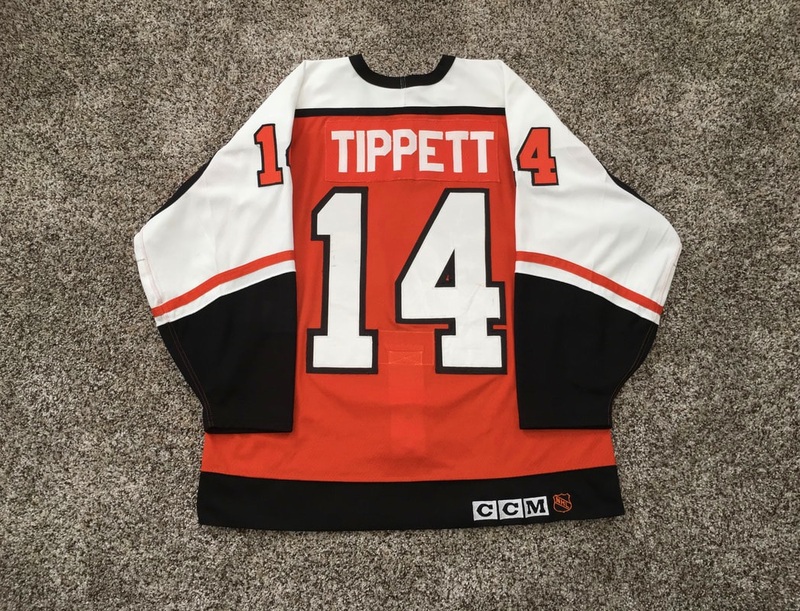 ​ This jersey was worn by Dave Tippett for road games during the 1993-94 season. It shows lighter wear with the front showing four black markings and couple fabric pulls. The left sleeve exhibits three black markings, five board burns in the elbow area, and a 1/2" un-repaired hole in the elbow area. The right sleeve has two black markings, blue and red board paint in the elbow area, and three board burns in the elbow area. The rear of the jersey has a black mark on the #1, and black and red markings on the #4. The inside of the jersey has proper tagging with a size 50 fly tag and #14 penned on the masks tag in black sharpie. There is salting in the fight strap buttons and some pilling is present in the right elbow area. 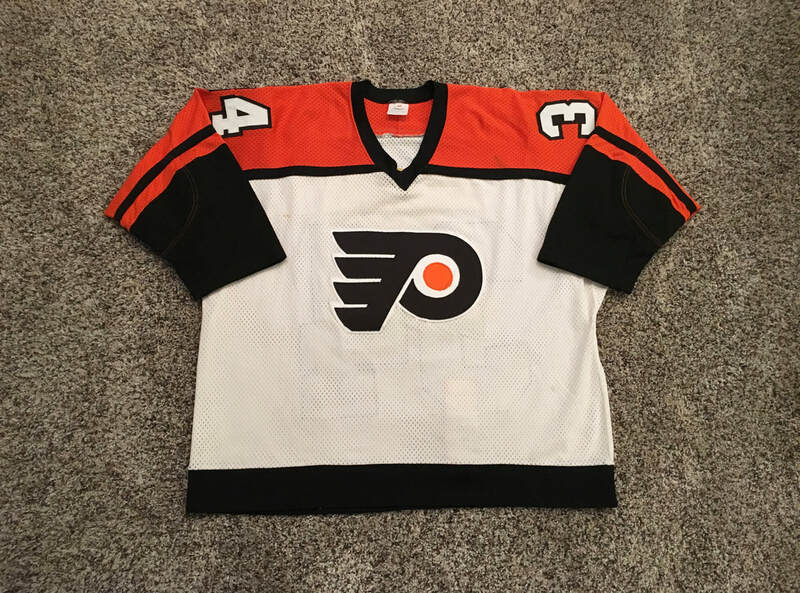 This home jersey was worn by Flyers D-man Kerry Huffman during either the 1989-90 or 1990-91 season or possibly both as there is moderate wear throughout. 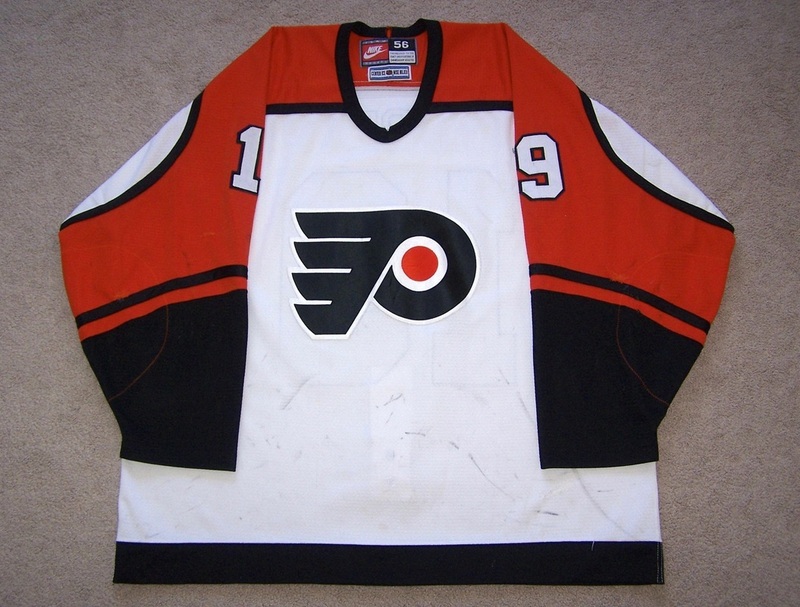 The front of the jersey shows scattered black markings, blood staining on the upper left chest area, and more blood stains on the left side near the hem. The right arm has some white markings next to the #5 and a nice board burn on the elbow area. 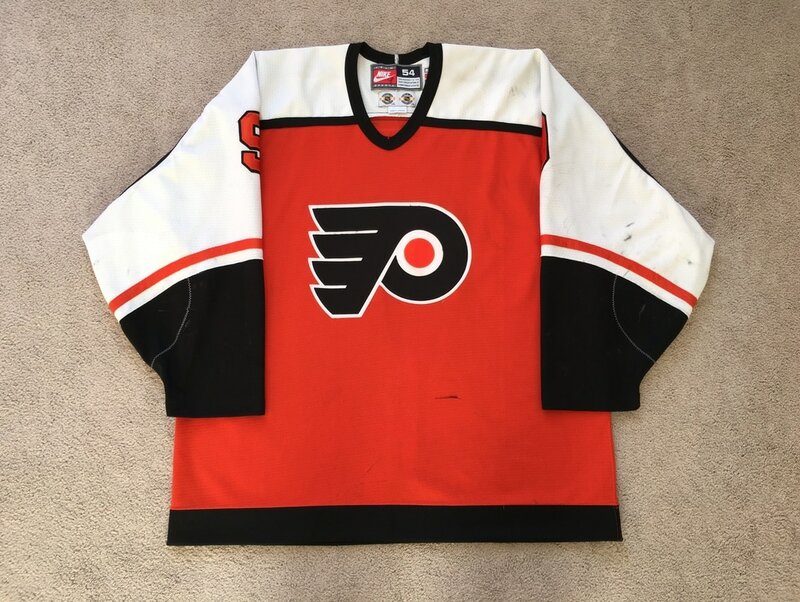 The left arm shows nice wear with a black mark on the #5, two burn marks on the orange part of the sleeve, three un-repaired holes in the elbow area, five board burns in the elbow area, and a 2'' loop style repair (typical Flyers equipment manager style repair during those years) near the cuff. The back of the jersey shows even wear with a few black markings and fraying threads on the nameplate letters. The fight strap shows light salting. Fun fact about Kerry Huffman: On June 30, 1992, he was involved in the blockbuster trade involving 1991's first overall pick Eric Lindros. The deal saw Huffman traded from Philadelphia to the Quebec Nordiques, along with Peter Forsberg, Mike Ricci, Ron Hextall, Chris Simon, Steve Duchesne, a first-round pick in the 1993 and 1994 Drafts and $15,000,000 for Lindros. 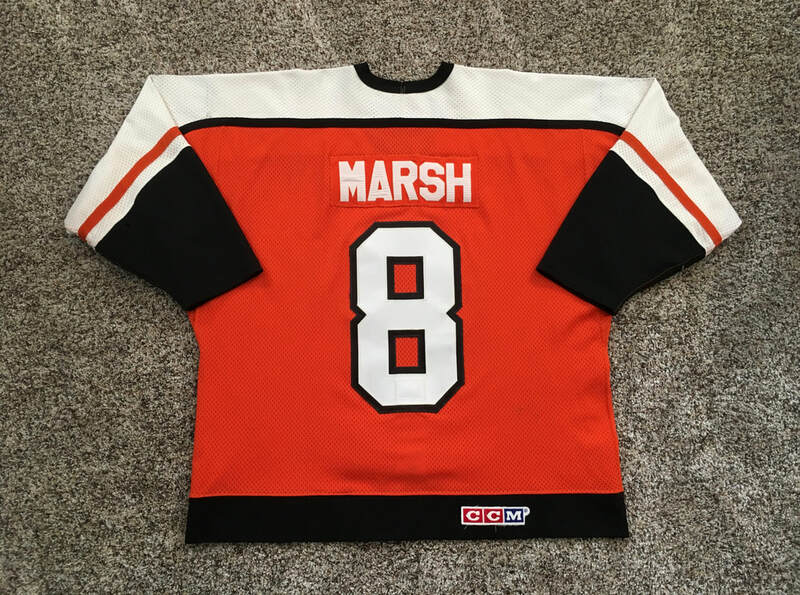 ​ This orange road CCM mesh jersey was worn by Mr. Marsh during the 83-84 season. 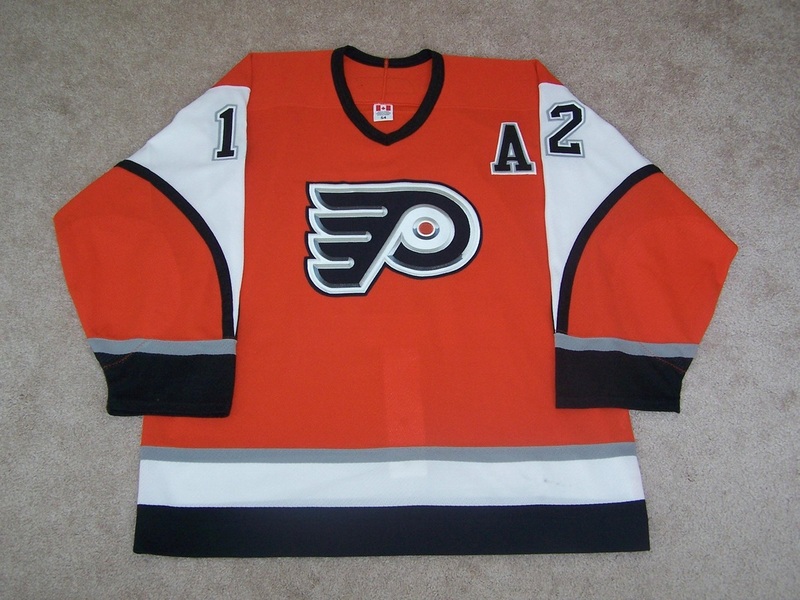 It features lighter wear with the front showing a scrape on the Flyers crest, some washed out black markings, a 3" white slash mark on the lower left side, and an un-repaired tear in the mesh towards the lower middle of the jersey near the black hem mesh. The right arm features yellow stains and a light board burn in the cuff area. The left arm has four black marks, a 1/4" un-repaired tear in the cuff, and a small black mark on the sleeve number 8. The rear shows even wear with a 1" scrape and two black markings to the rear number 8. The nameplate letter show some puckering and a applied to a matching ccm mesh nameplate. The inside of the jersey has the original fight strap which has some minor pilling which is sewn through the bottom of the rear number 8 for reinforcement. 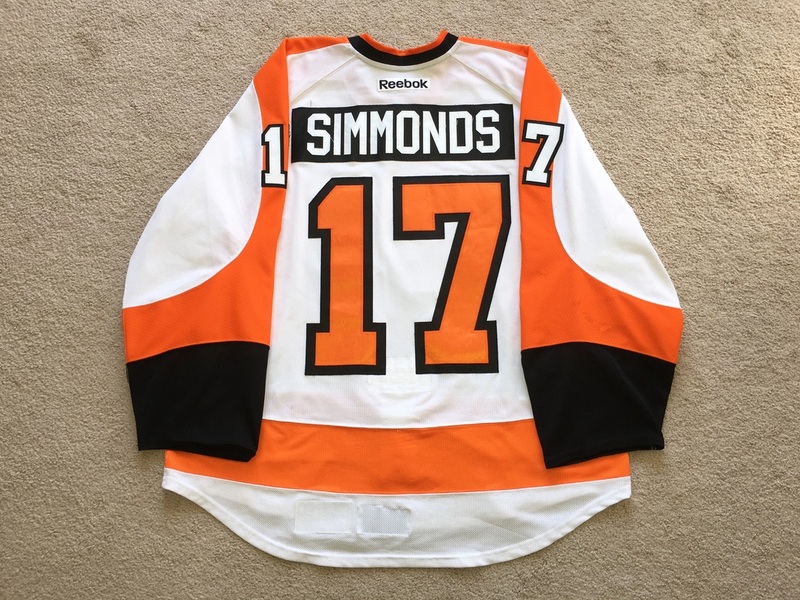 ​ This jersey was worn by Simmonds during the 13-14 pre-season and during the regular season on the road for 17 games from 10-5-2013 through 12-11-2015. He would post 3 goals and add 7 assists for 10 points while wearing this jersey. 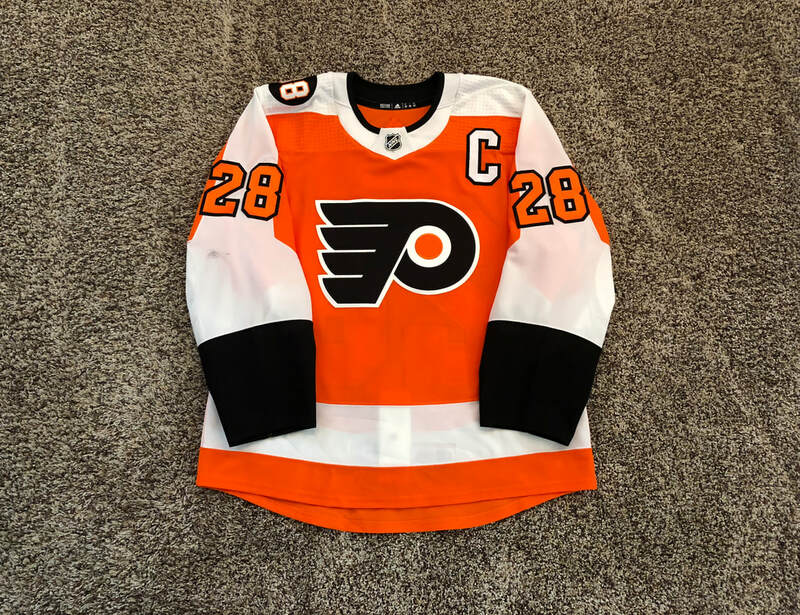 Simmonds was an alternate captain during the pre-season and the front of the jersey has some light residue and outline of the "A" patch which was removed before the start of the regular season. Also, the front features loose threads on the upper right chest area, a light 3" slash to the right of the crest, and five black markings throughout. The right arm shows black markings throughout, a black mark on the bottom of the sleeve #1, a small un-repaired hole under the #1, two small board burns in the elbow area, and on board burn in the elbow area. The left arm has two board burns in the elbow area, a 1/2" un-repaired hole in the elbow area, four board burns in the cuff area, and a 3" repair in the cuff area. 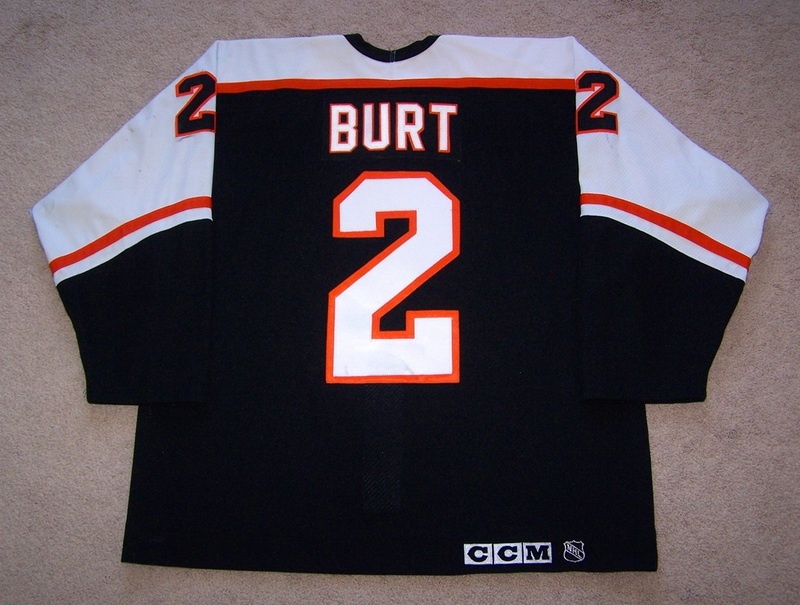 The rear of the jersey exhibits five black markings, many loose threads on the nameplate letters, and a 2" slash to the rear #2. The inside of the jersey has a good amount of pilling behind the crest and chest area. 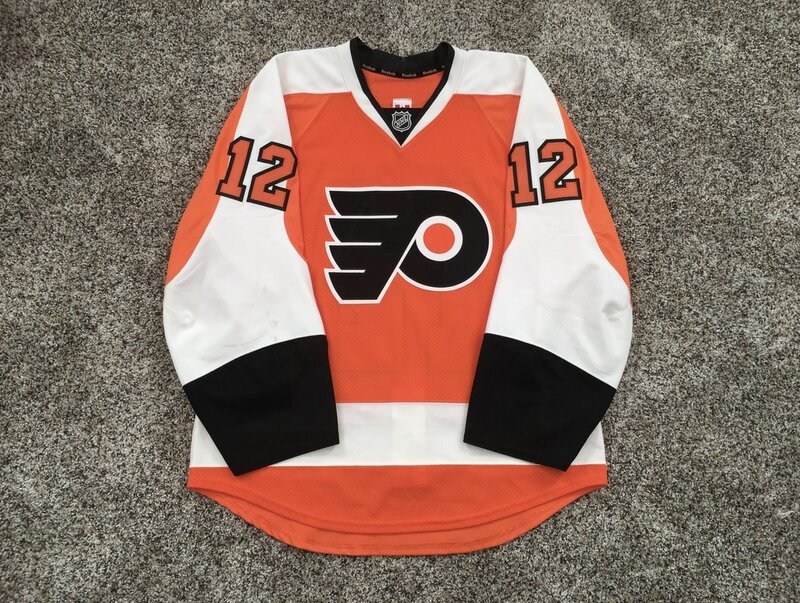 This set 2 road jersey was worn by Simmonds from 1/8/12 - 4/7/12. It was worn for 20 games in which Wayne netted 8 goals and added 6 assists for a total of 14 points. 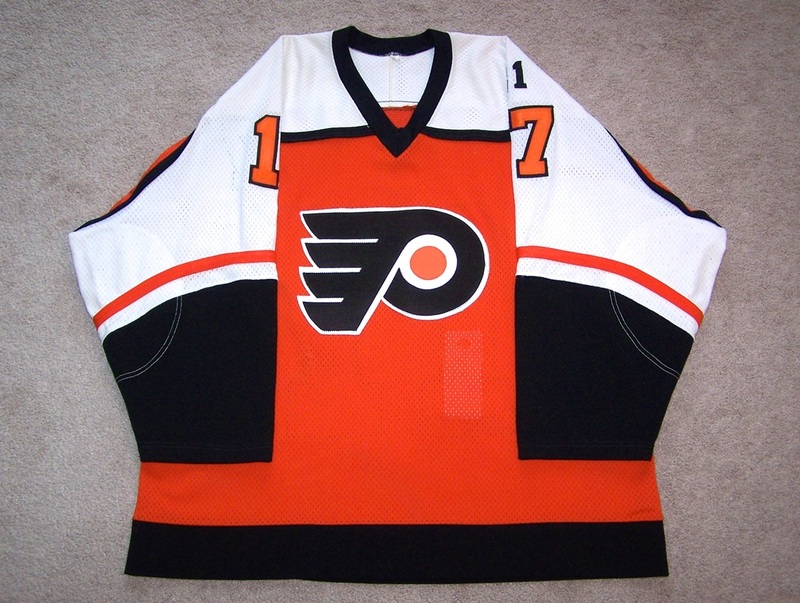 The jersey features good wear with about 8 black markings on the front of the jersey. The left arm has about 4 black markings and fraying arm numbers. The right arm consists of 3 black markings, a 1/4" board burn, 2 unrepaired holes, and 2 black slash marks on the back of the sleeve. The rear of the jersey features nice even wear with some loose threads on the nameplate and numbers. The inside of this jersey has a good amount of pilling behind the crest and the reinforced neck stitching is popped from fight abuse. 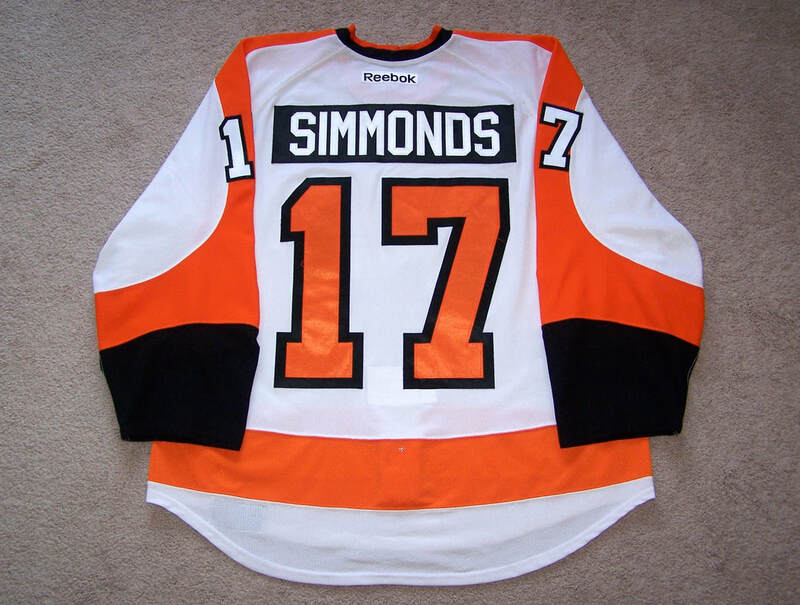 Simmonds fought three times while wearing this jersey. He battled Joey Crabb in Toronto on 3/10/12, Matt Martin in NY on 3/15/12, and Deryk Engelland in Pittsburgh on 4/1/12, which was a wild game, which featured Peter Laviolette and Dan Bylsma standing on the boards yelling at each other. Not to mention the infamous Hulkamania (Malkinmania) guy in Pittsburgh garb behind the Flyers bench being taunted by Scott Hartnell. 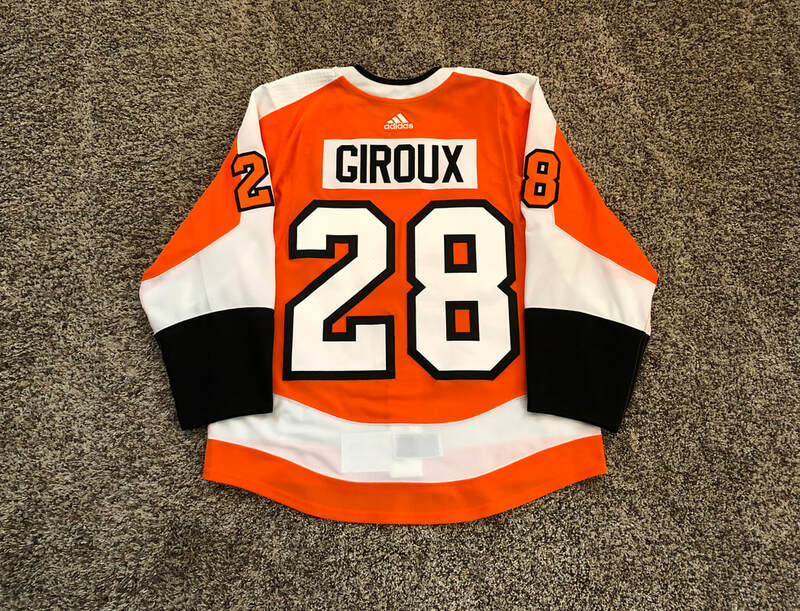 Claude Giroux 2017-2018 "Eric Lindros Night" Home Jersey w / "C"
​ This jersey was worn on 1/18/18 throughout the Flyers 3-2 overtime win vs the Toronto Maple Leafs. On that night, the Flyers honored legendary Hall of Fame forward Eric Lindros by retiring his #88 and sending it to the rafters. The jersey features light game wear with a small black mark on the front. The right arm features some black markings under the arm numbers and has the "88" patch sewn on the right shoulder area. The rear of the jersey has some markings on and next to the rear #8. The rear #2 has a few marks as well. 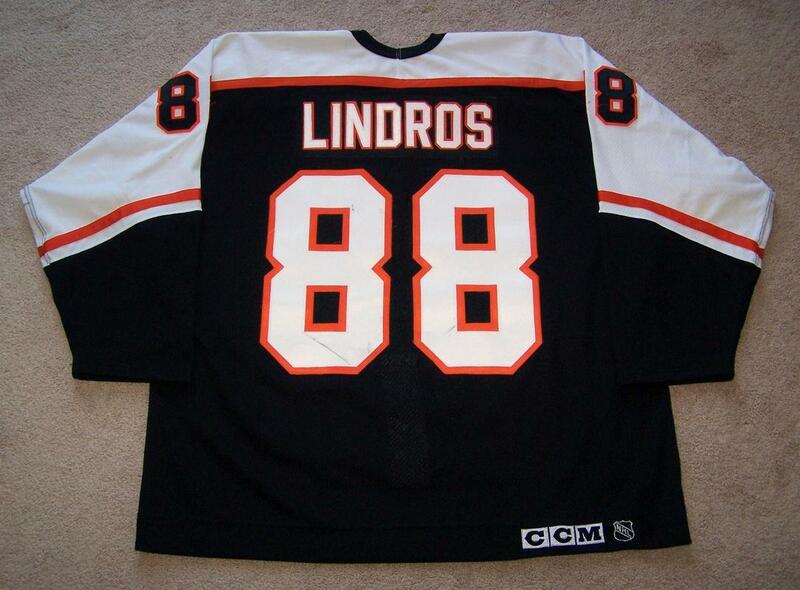 Inside the jersey has the "Eric Lindros" set tag and MGG tagging. Size 52 label is present on the inner neck piping. Matt wore this jersey during his rookie season in 2011-12 for 18 road games spanning from 1/8/2012 - 4/7/2012. 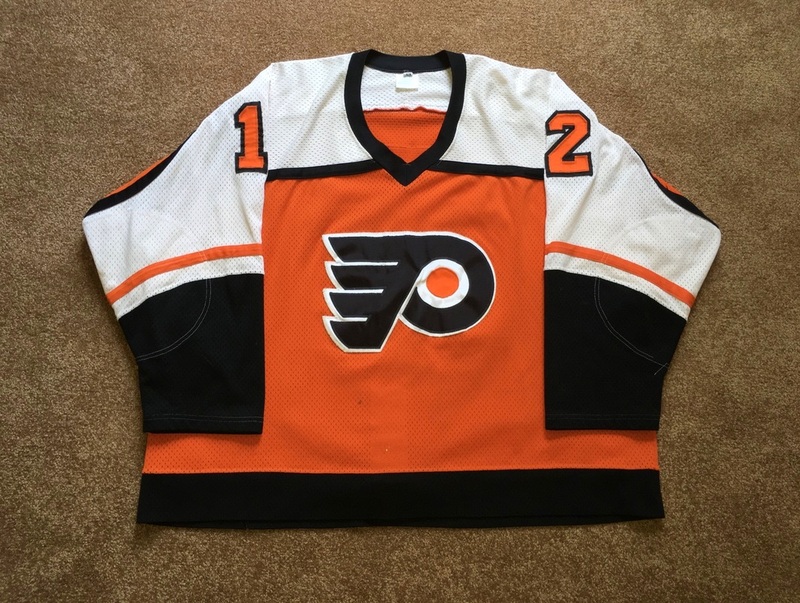 The jersey exibits decent wear with numerous stick/puck marks on the front, 1'' unrepaired hole and another small tear on the left sleeve, 1/2" unrepaired hole and a few stick marks on the right sleeve, stick mark on the right shoulder area, and small stick mark below the rear #2. The inside of the jersey shows pilling in both elbow areas. The collar stitching is popped in a few places from what I believe was Read's first NHL fight vs. Jim Slater in Winnipeg on 2/21/12. Read recorded 4 goals and 6 assists for 10 points in this shirt. He was +8 in these games and scored the game winning shootout goal vs. Calgary on 2/25/12 while wearing this 2nd set gamer. 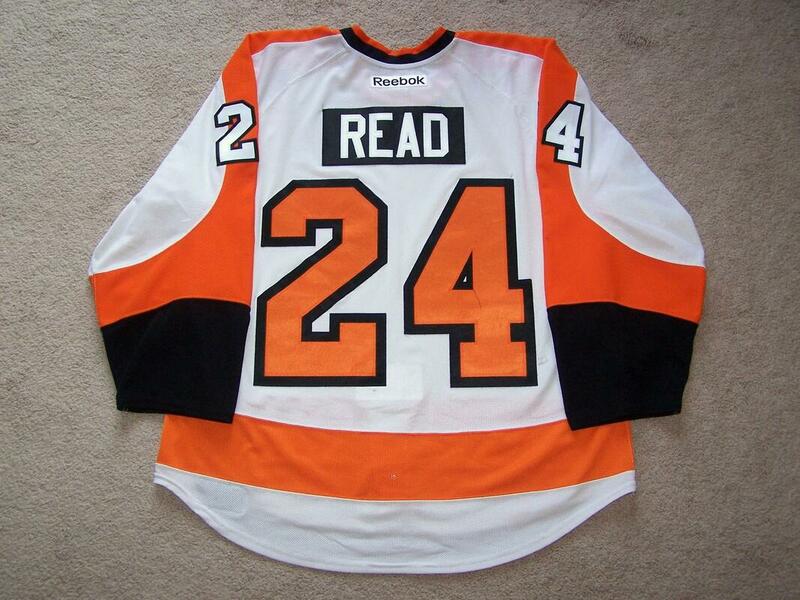 ​This jersey was worn by Matt Read on February 12, 2012, vs. the Detroit Red Wings in Detroit. 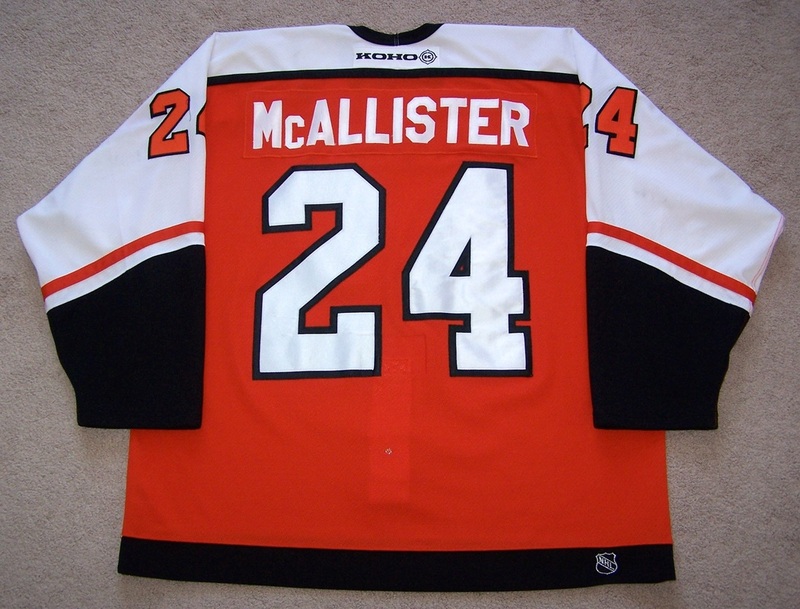 The Flyers wore their home orange jerseys on the road that Sunday in honor of the late Brad McCrimmon. McCrimmon played defense for the Flyers during the 1980's mostly pairing up with Mark Howe. He was tragically killed in a plane crash of the Continental Hockey League's Locomotive in Yaroslavl, Russia along with the entire team. 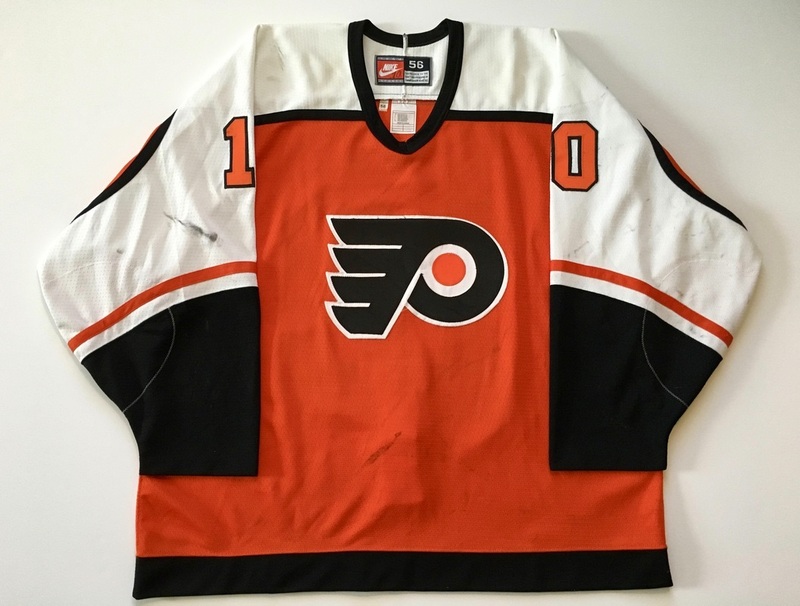 This orange set of jerseys was auctioned off a few days after that game by the Flyers Wives Charities to raise money for the Brad McCrimmon Family Fund. The Flyers would go on to lose the game 4-3 in Detroit that evening. 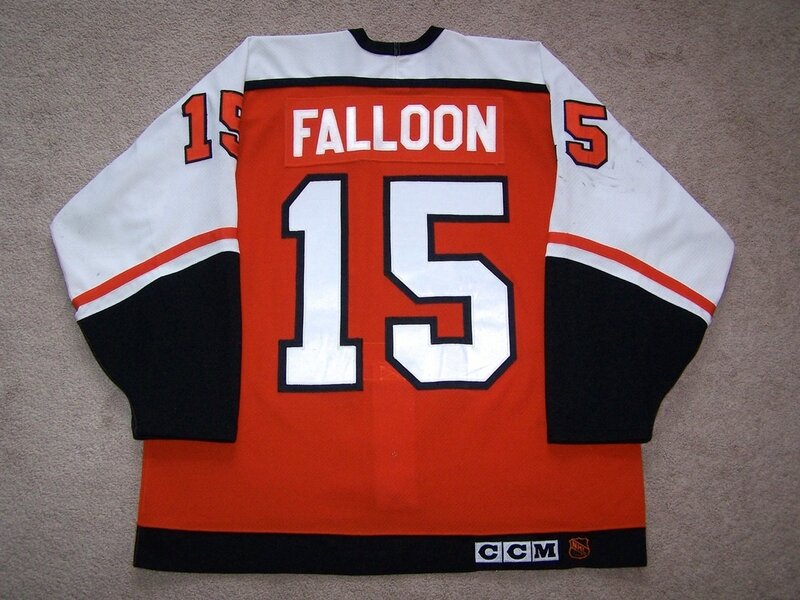 Read assisted on Max Talbot's goal in the second period and registered 15:41 ice time while wearing this jersey. The wear is very light with no noticeable marks or interior pilling. 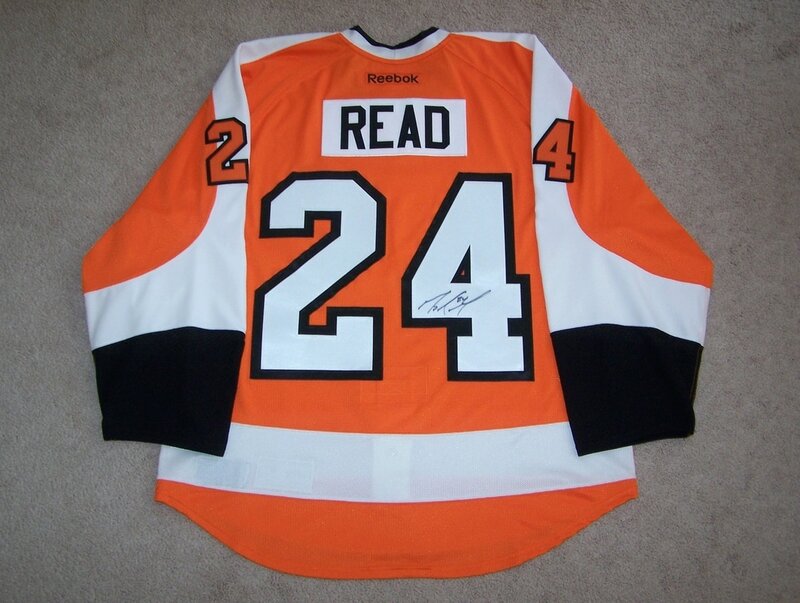 The rear #4 was autographed by Read prior to the auction. 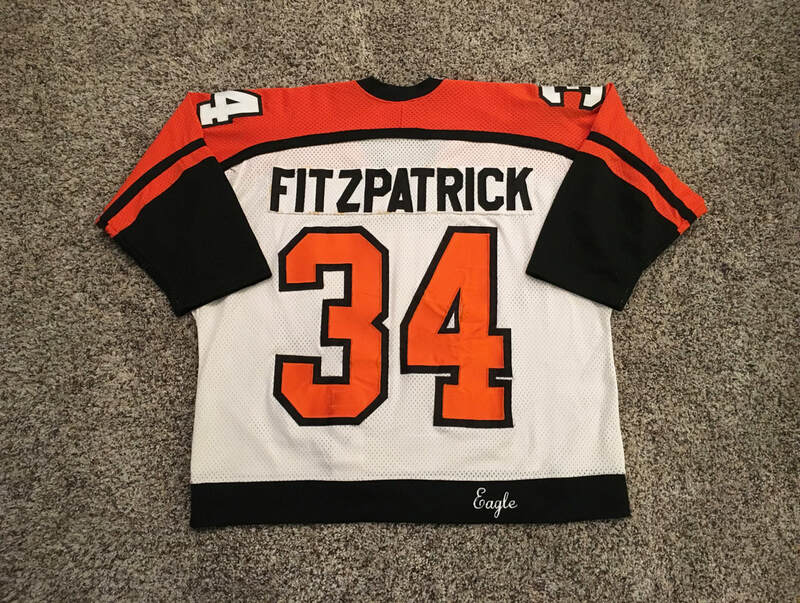 ​ This jersey was worn by Fitzpatrick for a few games during the 84-85 season. This Eagle brand mesh gamer features light wear with the front exhibiting a slash mark through the crest and two black markings. The right sleeve shows a few board burns in the cuff area and red paint on the sleeve #3. The left sleeve has a black stick or puck mark and a small burn on the cuff. The rear of the jersey features a hand sewn and glued matching mesh nameplate, puckering to the rear numbers, and a black mark on the rear #3. 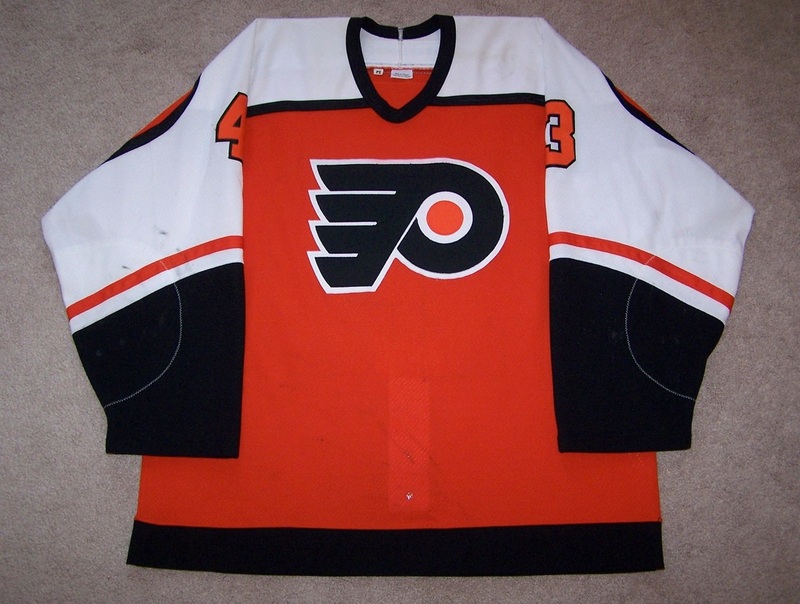 The fight strap is attached through the rear #3 a feature found on Flyers game worn jerseys of this era. The inside of the jersey has the Eagle Sportswear and smaller size 50 size tag. A nice vintage piece from the Spectrum days! ​ White home jersey given to the players through MeiGray during the 2002-2003 season. Jersey exibits light wear with a 3/4" board burn on the black piping on the right elbow area. There is a puck/stick mark on the left shoulder near the collar. The front of the jersey shows stick rubbing on the lower left side and there are a few faint black marks on the lower center portion of the jersey right above the black hem. Each sleeve number has a few loose threads. The crest shows some puckering. The back of the jersey has some black marks on the lower right side. Promo written on the fight strap and MeiGray tag in black sharpie. Jersey is logged in the 2002-2003 MeiGray population report. ​ Jersey exhibits light wear with a large light stick mark on the lower front and extensive pilling of each sleeve cuff which is common on Galley's Philly gamers. The left elbow has some red board paint and a black mark. Each sleeve cuff has light burns as well. 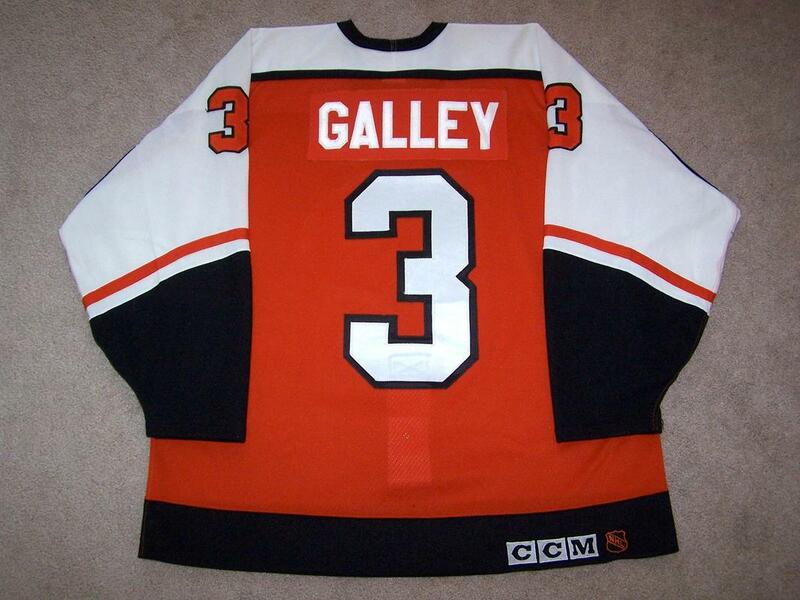 Galley would go on to score 70 points in 1993-94 which currently ranks second all time for Flyers D-men. 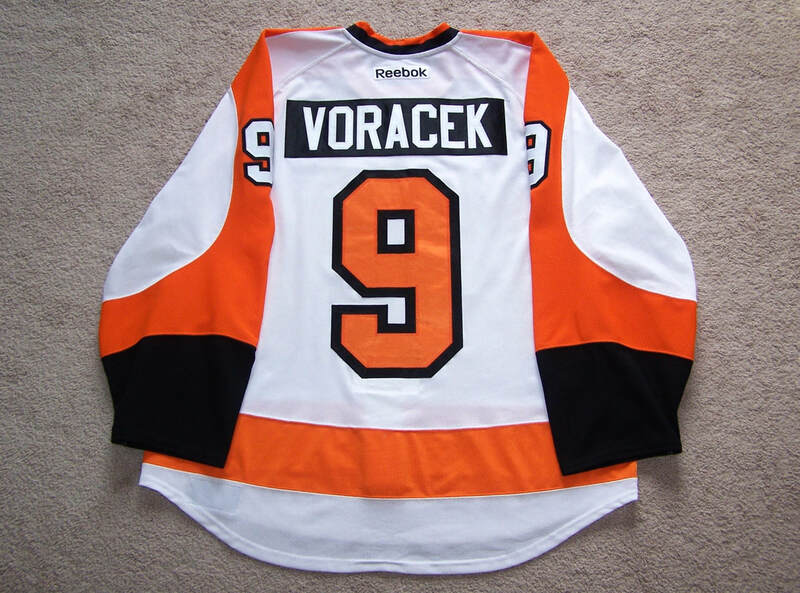 ​ Voracek wore this jersey in his Flyers debut (pre-season) on 9/20/2011 vs. the Toronto Maple Leafs. He recorded an assist during the second period in that game while wearing this jersey. When the pre-season concluded, he switched back to his usual #93 for the start or the regular season. The jersey shows light wear with some faint black marks on the left sleeve and a 1" burn on the left cuff. The rear of the jersey shows even wear with a black mark to below the #9. 9-1 penned on the inside of the jersey below the tagging. On November 23, 2015, the Philadelphia Flyers honored Rod Brind'Amour by inducting him into the Flyers Hall of Fame. 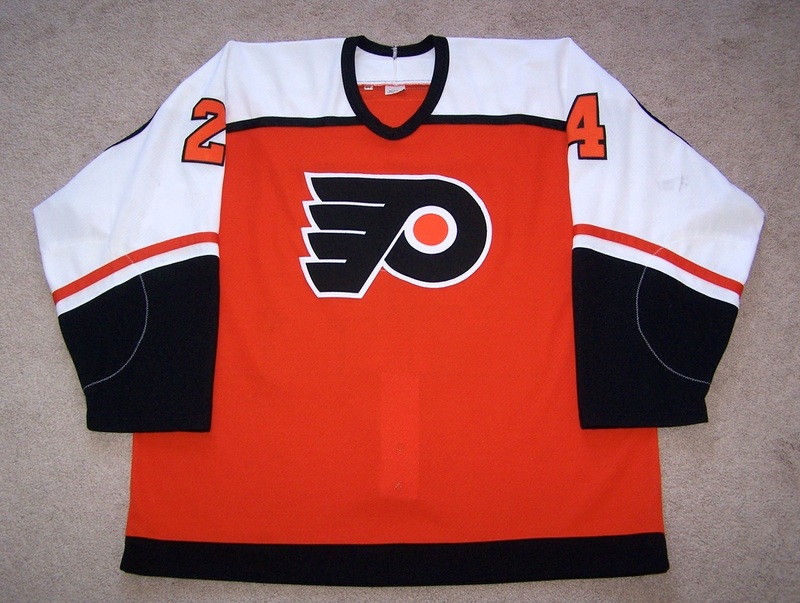 The Flyers wore a unique set of jerseys that night with a special patch honoring Brind'Amour. 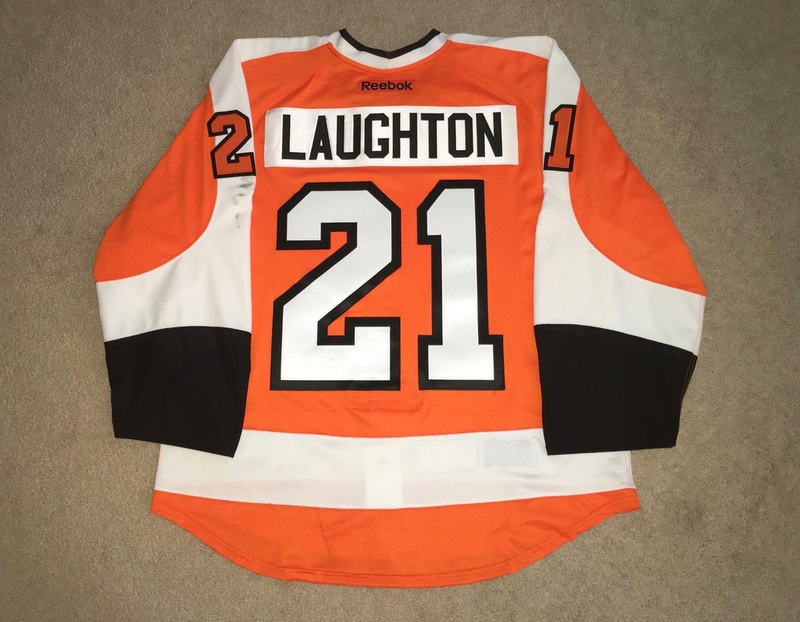 This jersey was worn by Scott Laughton throughout the Flyers 2-3 overtime win over Carolina. 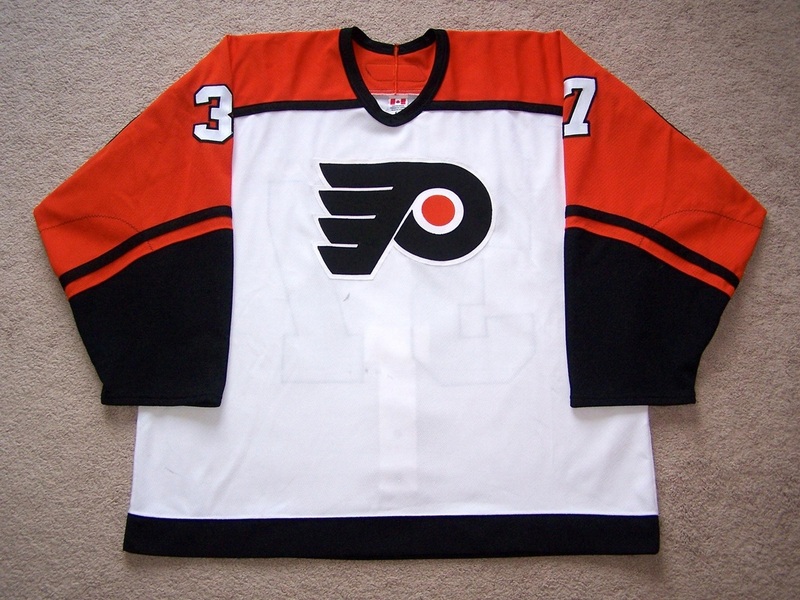 Laughton would see 8:07 in ice time that night, and as expected, the wear on this jersey is fairly light. 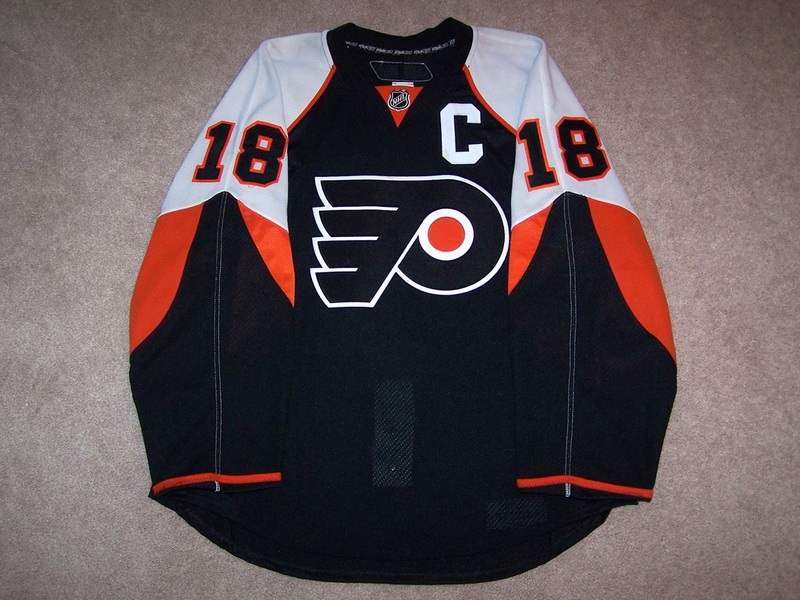 The front of jersey shows a couple of light white stick marks on the crest. The right arm has a few light discolorations in the elbow area. The left arm features a series of black markings under the sleeve numbers and two other markings in the elbow area. The rear of the jersey has a 3" stick mark on the lower rear hem. ​ Nice gamer from the 1996-1997 Regular season. Jersey has moderate to heavy wear. The front features loose stitching in the collar, numerous black markings throughout, and dried blood stains toward the top above the crest. There are 5 slash marks on the crest and a 2'' repair on the bottom left side. Heavy blood staining over the 2'' repair and splattered blood throughout the lower left side. The left sleeve has various stick marks and a 1'' burn over the #9. There are 6 burns in the elbow area along with a 1'' team repair. The left cuff has two unrepaired holes as well. The right sleeve features burns over the #19 has a 1'' repair. There is another 1'' repair in the elbow area and another large board burn. In addition, the cuff area has four burns. The rear of the jersey has numerous black markings at the bottom and some blood splatters. Obtained from a collector in February 2012. 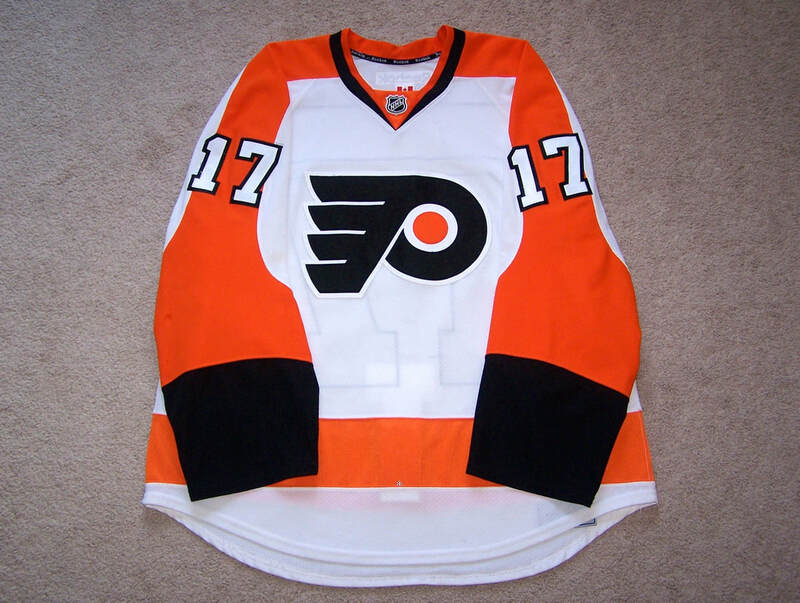 ​ This jersey was worn by Talbot on 3-6-12 when Mark Howe's #2 was retired and sent to the rafters at the Wells Fargo Center. 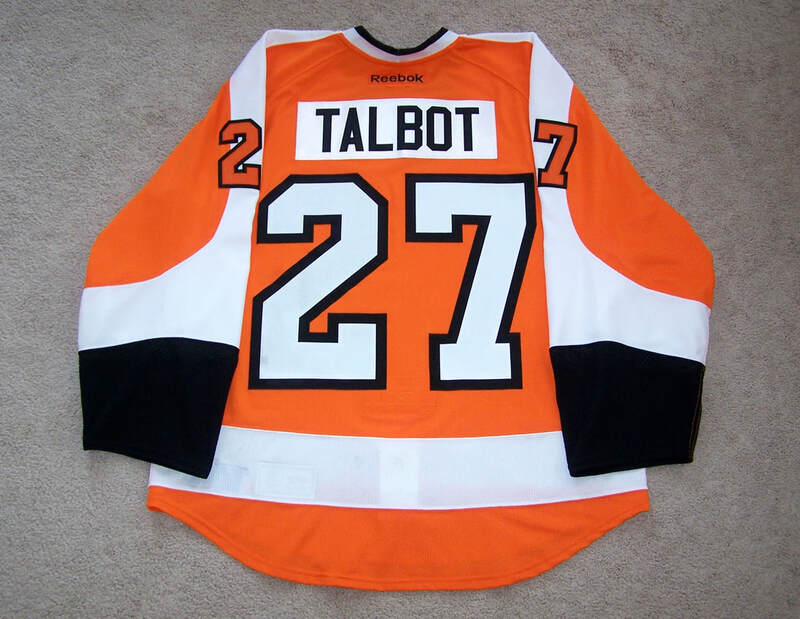 Talbot scored a short-handed goal in the second period while wearing this jersey. The Flyers would go on to beat the Red Wings that night 3-2. The game wear is light as expected on this two period gamer. The front of the jersey has a loose thread under the crest. The left elbow area shows three light markings. The rear of the jersey has a few light stick marks on the lower left side. There are also some markings on the rear #2. MeiGray and Philly Express tagging on lower inside rear of the jersey. 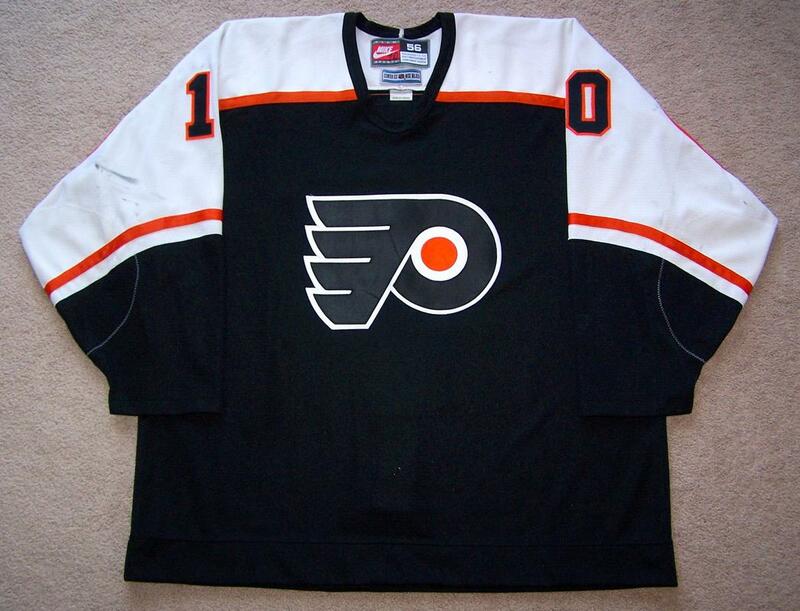 ​ This orange road set 1 jersey was worn by Zubrus in the first half of the 98-99 campaign. It shows moderate wear with the front having nice even wear with a few slash marks to the crest, and a dark 1 1/2" black mark under the crest on the left side. 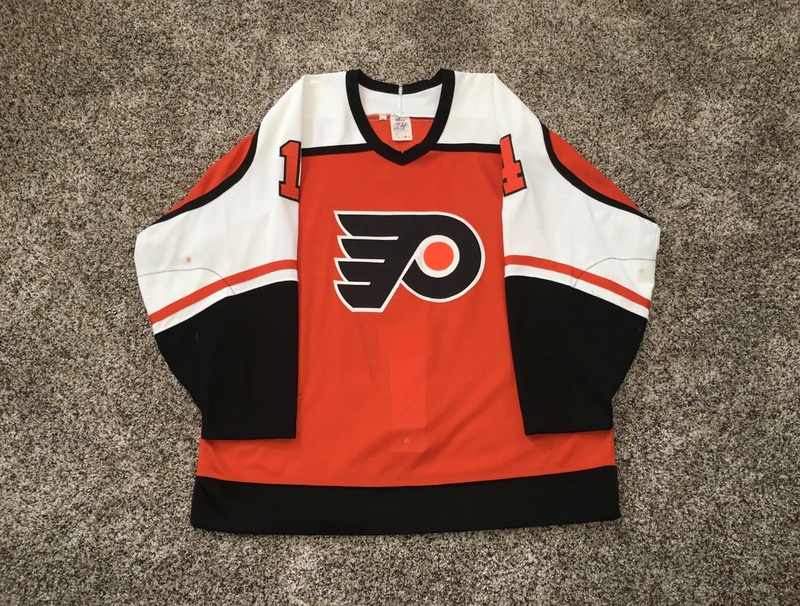 The left sleeve has black markings throughout, numerous small board burns in the cuff area, 1 1/2" team repair in the elbow area, and a small un-repaired hole in the orange sleeve piping. The right arm shows less wear with a few black markings, and a smattering of small board burns in the cuff area. 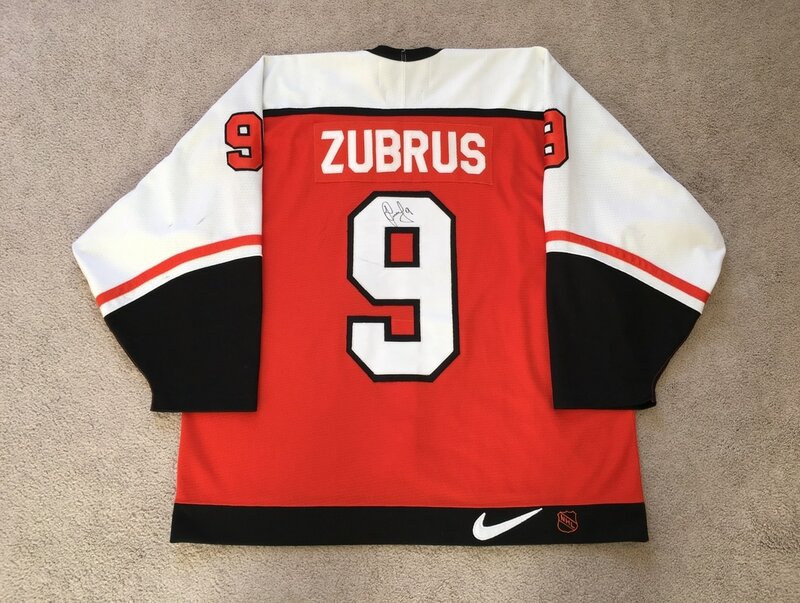 The rear of the jersey has a few light stick marks with the #9 signed by Zubrus. The black stitching at the bottom of the #9 has come loose due to being sewn to the fight strap. The inside of the jersey features pilling on each arm, sweat stains on each shoulder area, and a Byrons Hockeyland inventory tag still attached to the fight strap that reads 98/99/1. Jersey is photo matched to black marks over left elbow area. ​ This jersey was originally prepared for Swedish left winger Magnus Roupe for his debut during the 1986-87 Stanley Cup Playoffs. 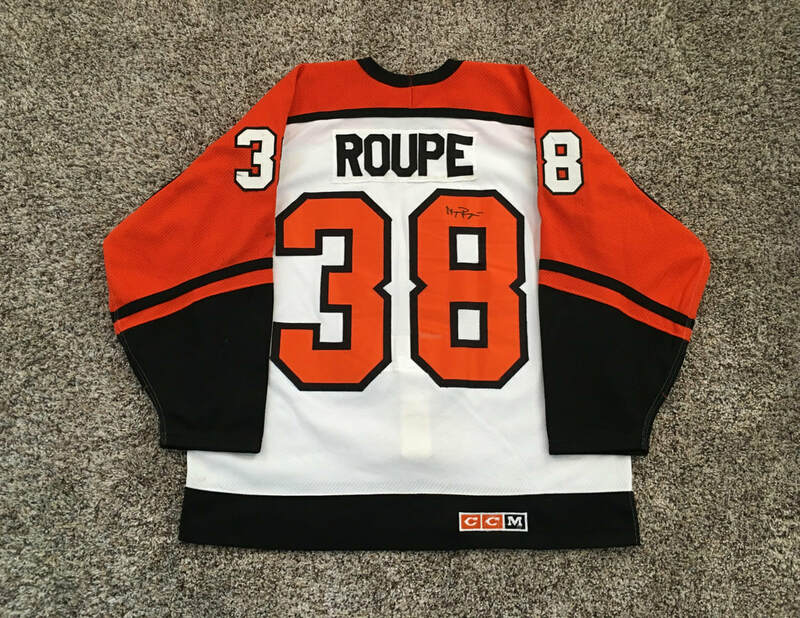 Through research an article was found dated 5/8/87 which indicated that Roupe would be joining the team for Game 3 of the Montreal series and would begin practicing with the team immediately due to the number of injuries to the forwards on the team. Sadly, Roupe did not see action in that series or in any of the playoff or finals games that year. Therefore, it is my assumption that the jersey was recycled for the 87-88 pre-season only, as Roupe would switch to #10 for the regular season games he saw action in during 87-88. The front of the jersey shows four fabric pulls and some staining to the bottom of the crest. The right arm has a mark on the sleeve #8 and about seven board burns. The left arm has three board burns, red dasher or post paint on the #8, and blue and red markings on the #3. The rear exhibits mostly brownish staining and a white stick mark to the #8 which has been signed by Magnus. "Roupe" is sew in black twill letters to a matching air-knit nameplate. 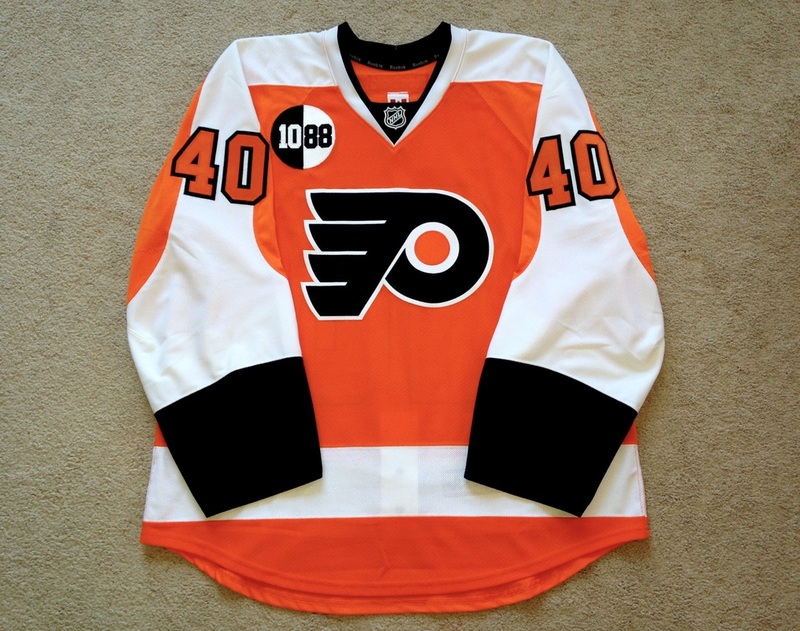 The inside of the jersey has "50" written in faded black pen on the Maska neck tag and has the twill reinforced fight strap which is a common trait with this first set of Flyers air-knits. 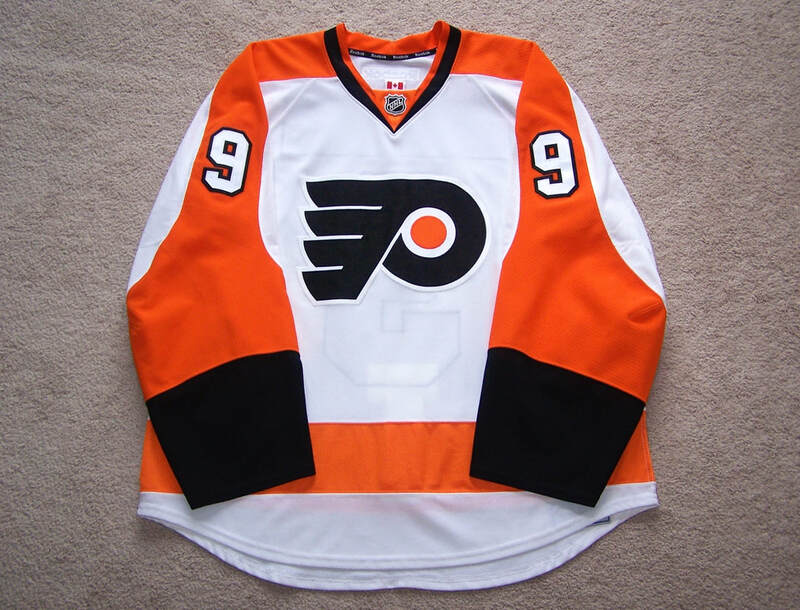 ​ This orange set 2 home jersey was worn by Gagne during his last season as a Flyer. 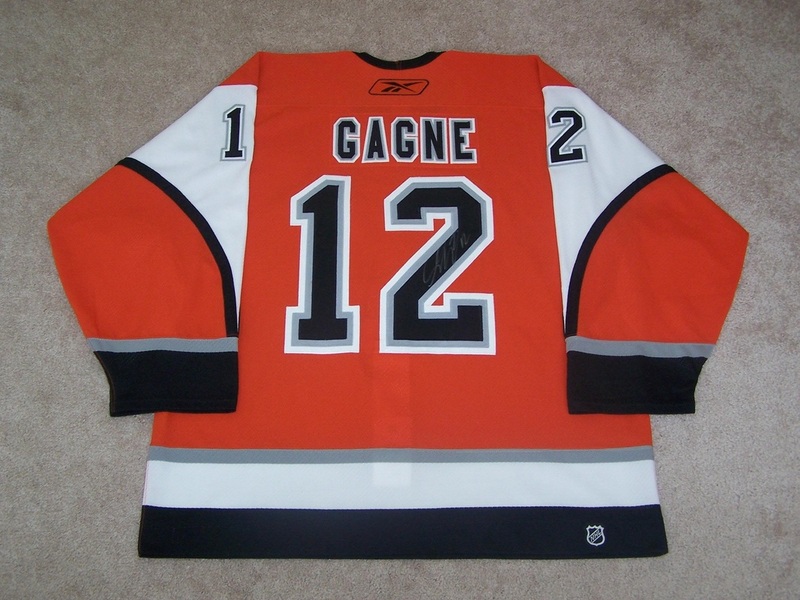 Worn for 8 games, Gagne would score one goal and add three assists for four points in this jersey. If shows light wear with the front of the jersey being clean with a loose thread on the crest. The right sleeve has about five black markings. The left arm has three black markings and a 1" mark on the elbow area. The rear is clean as well but has light puckering to the numbers and nameplate. The fight strap remains inside the jersey and there is a size 52 tag in the neck area. 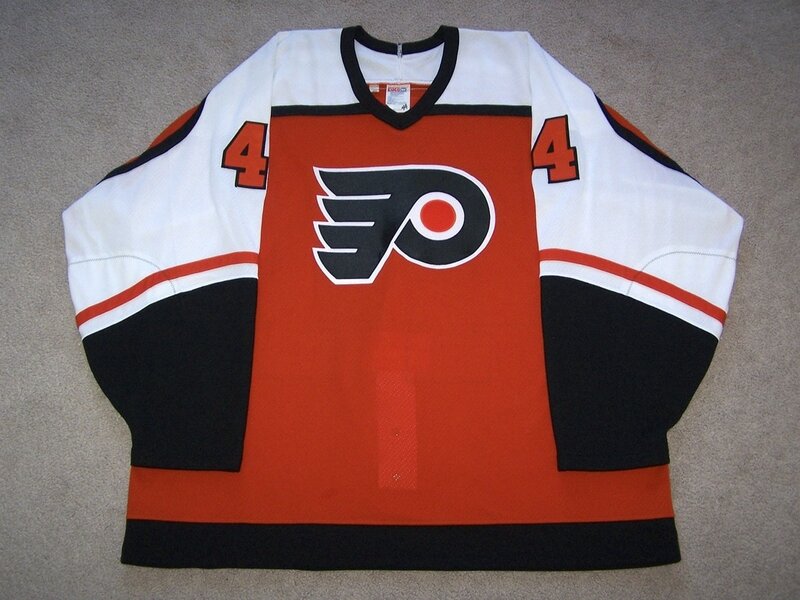 ​ This road gamer has nice wear and was worn by Pat during his first year as a Flyer in 95-96. 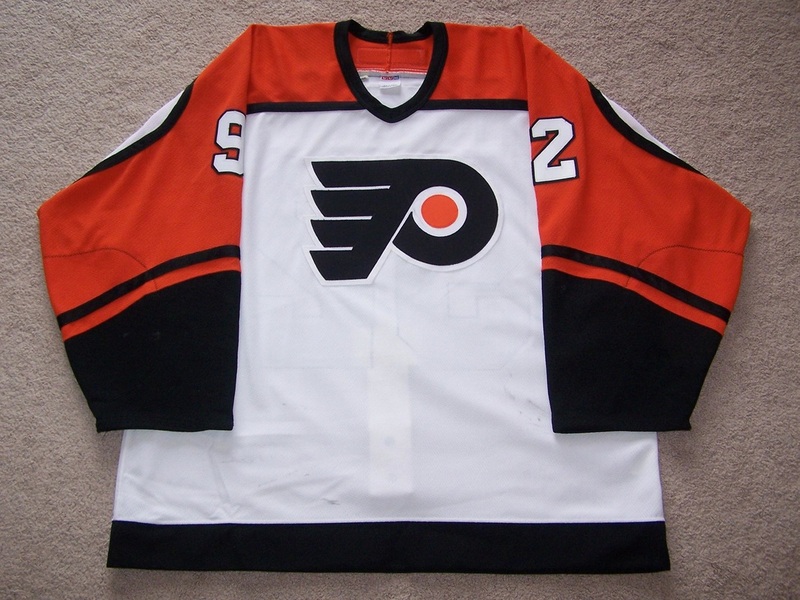 The front of this jersey has approximately 15 black markings, 2 slash marks through the crest, and popped stitching around the neck. The right arm features 8 board burns, 2 clusters of repairs, two 1 inch repairs above the elbow area, and numerous black markings throughout the sleeve. The left sleeve has 12 board burns, 1 un-repaired hole, 1 cluster of repairs, and a number of black markings all over the sleeve. The rear of the jersey shows even wear with a black mark through the bottom of the number 1. The inside of the jersey has some pilling, a salted fight strap, and 15 penned on the Maska neck tag in black sharpie ink. Pat had his best season as a Flyer in 95-96 racking up 22 goals and 26 assists for a total of 48 points in 62 contests. 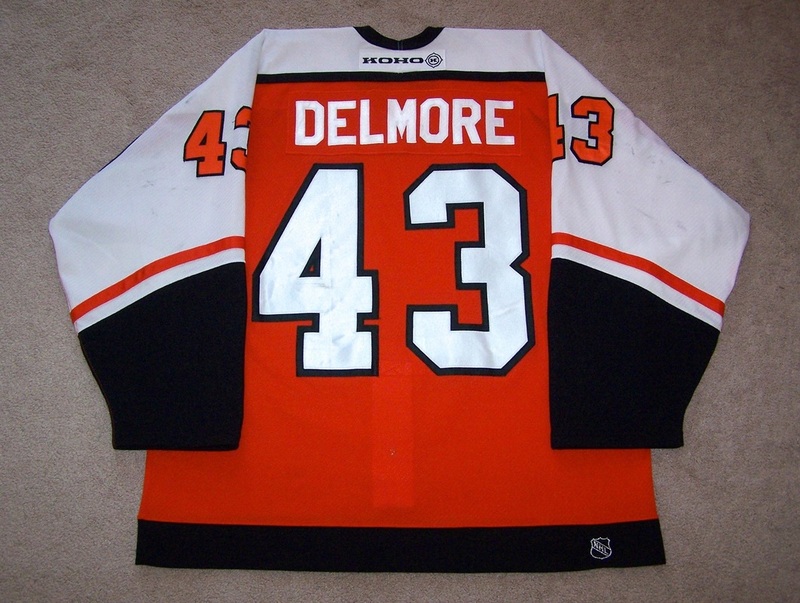 This jersey was worn by Delmore in his second season on the Flyers blue line. 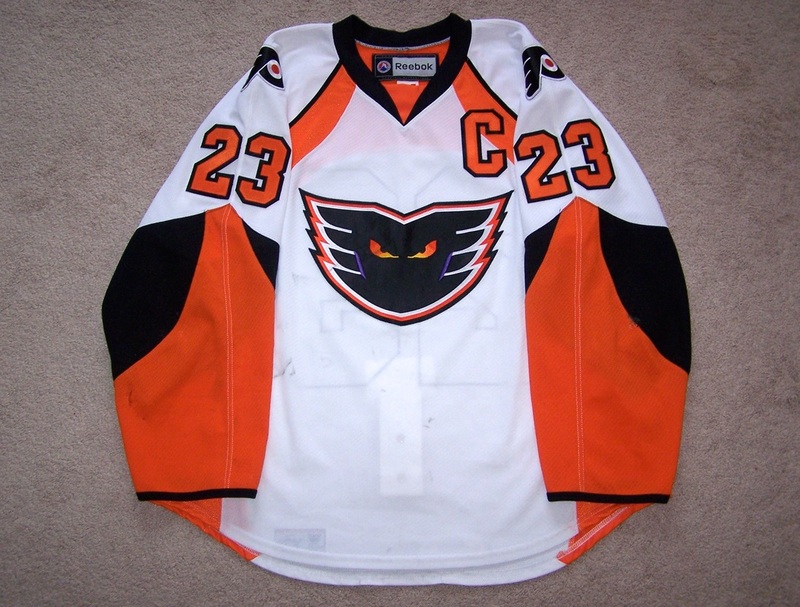 These orange road jerseys would be retired after the 2000-2001 season. It features a 1" unrepaired hole and burn mark on the upper right chest and numerous black stick/puck markings on the lower front. The right arm has a number of black markings on the white sleeve portion and 8 scattered board burns on the right cuff and elbow areas. The left arm features a few black marks on the white sleeve portion and about 10 different board burns on the left cuff and elbow areas. 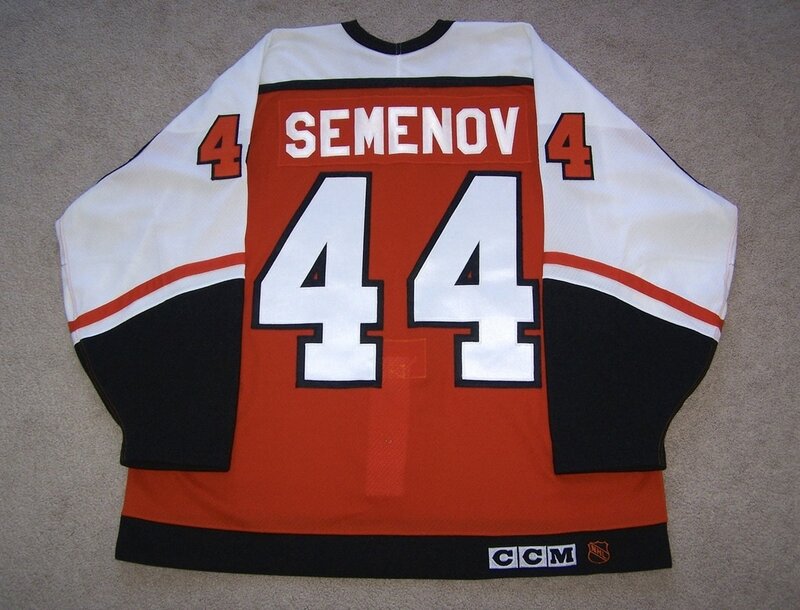 The rear of the jersey shows even wear with a light stick mark on the upper right back next to the nameplate, light stick mark through the nameplate, black mark on the rear #4 and substantial puckering of the rear numbers. The inside of the jersey has a few white marks on the inside of the black cuff areas and light salting on the fight strap buttons. 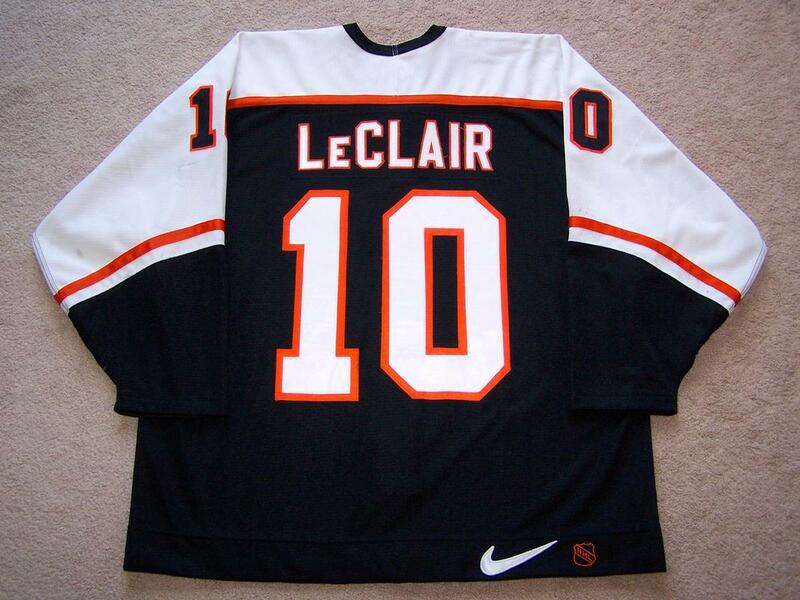 ​ This jersey was worn by LeClair during the late 90's and shows good game use. The front of the jersey has a couple of slash marks on the crest and numerous black markings throughout via stick and puck marks. The right arm shows about ten board burns in the cuff and elbow area, a large 3" stick slash mark under the sleeve numbers, and a few black markings in the shoulder area. The left arm exhibits a few light board burns, a 2" repair on the cuff, twenty-plus black markings, a 1" slice over the sleeve 0, and some blue dasher paint over the sleeve numbers. 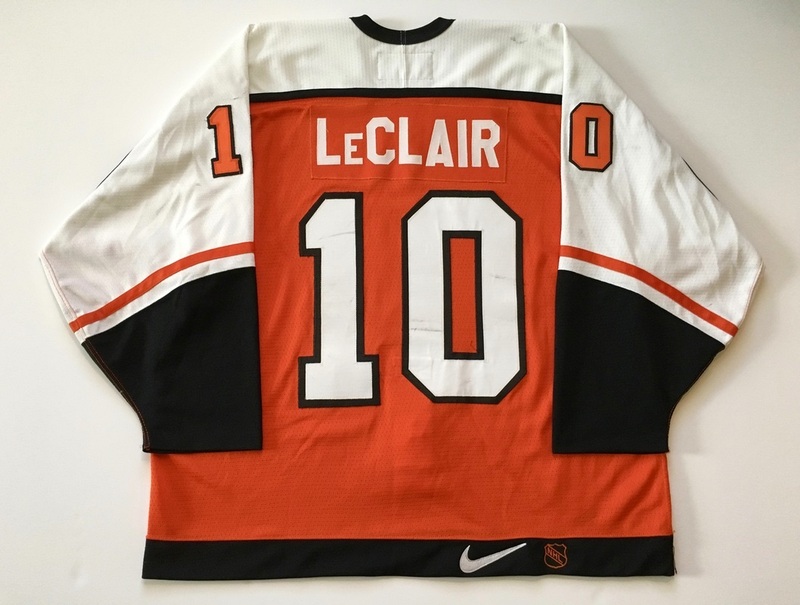 The rear of the jersey shows wear consistent with the rest of the jersey with black stick marks to both rear numbers and a matching Flo-knit nameplate with LeClair in white twill letters. Inside this jersey you will find Milt Byron's original tagging with the 97-98 designation, #10 penned on the Nike neck tag in black sharpie, and pilling around both under arm areas. 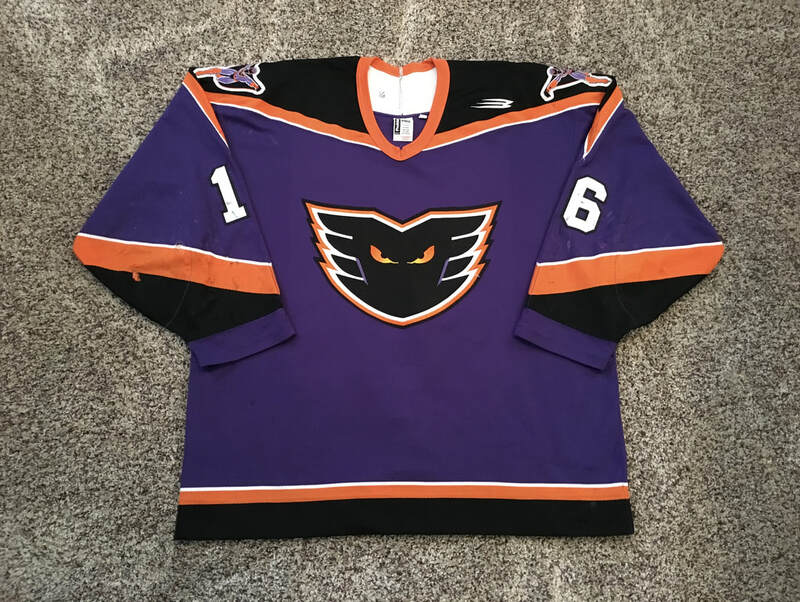 ​ LeClair gamer from the 1997-1998 season. Shows nice wear with numerous puck and stick marks. Also about three slash marks through the crest. Registered by MeiGray. ​Measures to a size 54. #10 on reverse of tag. 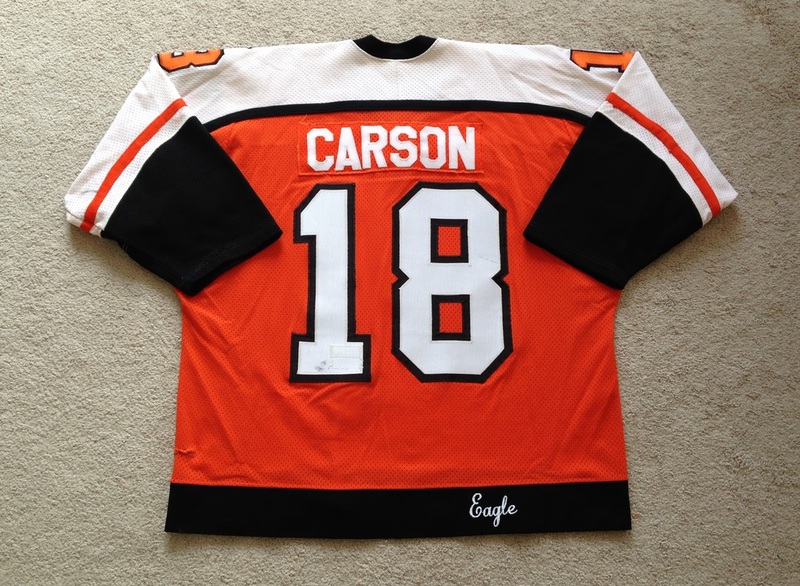 ​ This jersey was worn during the 85-86 season by Lindsay Carson. It shows moderate wear throughout. The front of the jersey shows even wear with a few crest slashes, black markings, and a 2" loop style repair on the lower left side. The right arm has two 1" loop repairs, fraying of the arm numbers, repairs to the orange piping, and numerous burns and markings in the elbow and cuff area. 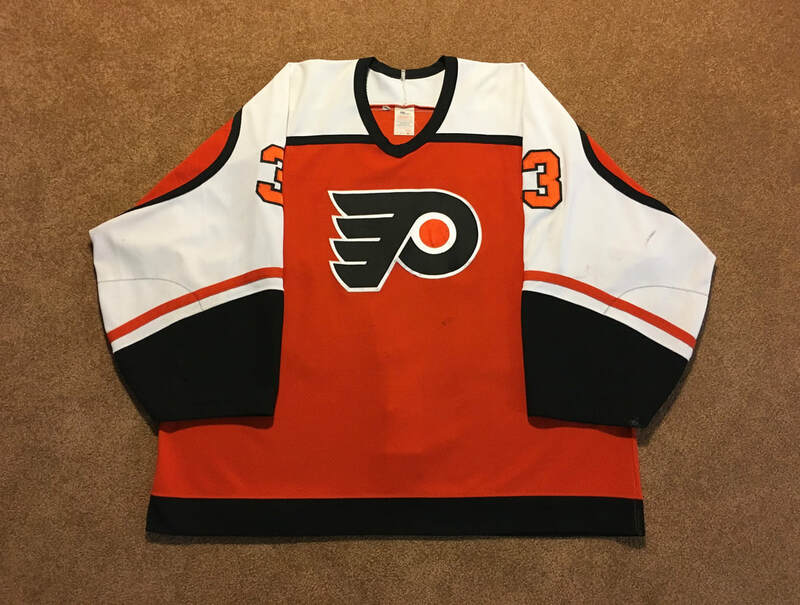 The left arm has a few black markings, repairs to the orange piping, a 1" loop repair on the cuff, and numerous burns and markings in the cuff area, and "31" patch to commemorate the passing of Pelle Lindbergh. The rear of the jersey has even wear from top to bottom. There is a black mark on the bottom of the number 1, a black mark on the top right side of the number 8, and some markings on the rear black hem. The fight strap has been sewn through the rear number 1 but shortened with a custom skate lace sewn to it with heavy thread. Most of the bottom half where the strap was sewn is loose threads from fight abuse. Light inside pilling is present. 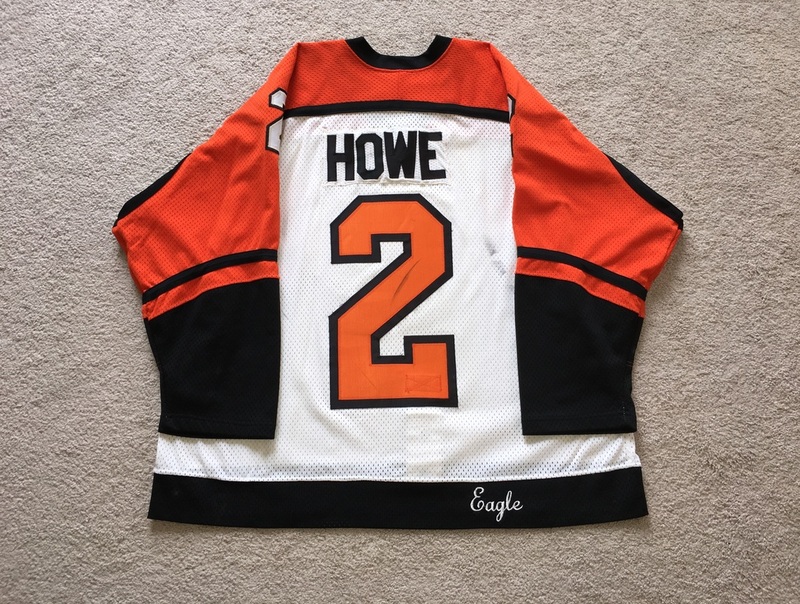 ​ This home jersey was worn by Mark Howe during the 84-85 season and consists of moderate wear. 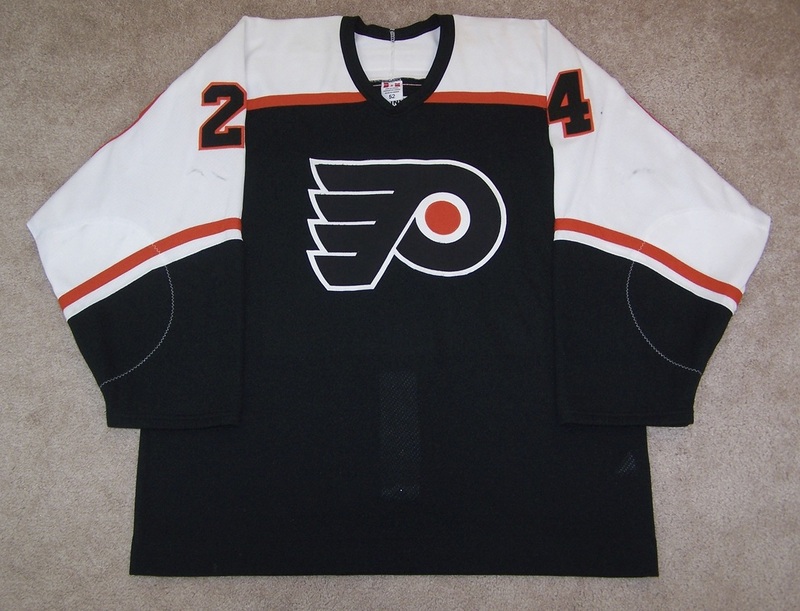 The front of the jersey has numerous black markings throughout and a few slash marks through the crest. The left sleeve has an old school Flyers 1" repair in the cuff area and a black mark at the top of the sleeve #2. The right sleeve has a small burn in the cuff area and a 1'' un-repaired hole in the elbow area. The right sleeve #2 also has two black markings. The rear of the jersey has three decent slash marks and an additional one on the rear #2. The fight strap is attached through the rear number and shows light salting. There is some light pilling on the inside of the jersey as well. Tags intact, "2" penned onto CCM tag. NHL 2000 patch on right shoulder. Large repair on left elbow w/ board burns also visible. Stick marks around number on left arm w/ solid mark under number. Light stick marks around number on right arm. Nice stick mark on right shoulder just to the right of collar. Long stick mark and a hole on right front hem. Board burn on back left hem. Light salting in fight strap. Silver NHL & CCM logo embroidered on back hem. Formerly of the Ken Mace "Hammered Hockey" collection. This jersey features very light wear. The number 44 is penned on the maska tag in black sharpie pen. Jersey shows evidence of washings. 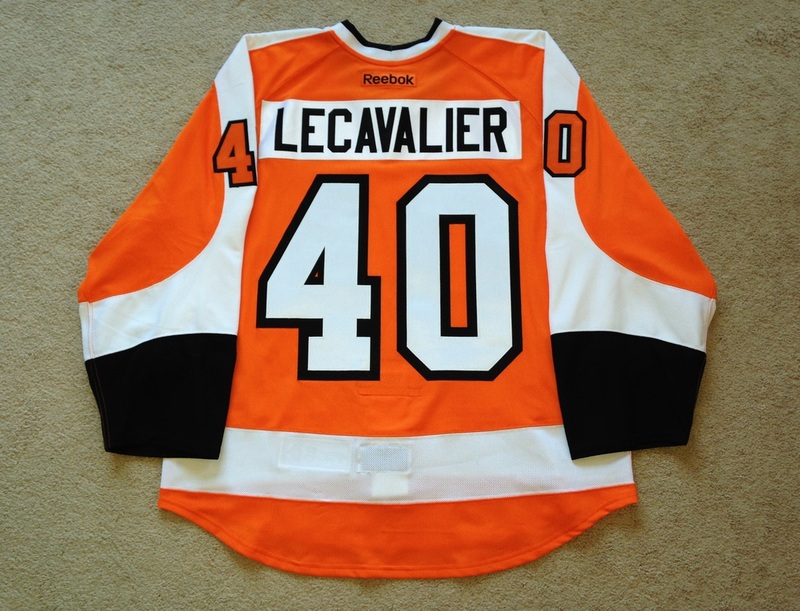 ​ This jersey was worn by Lecavalier on 11/20/2014 during a 3-2 loss to the Minnesota Wild. The Flyers wore a special 10/88 patch to honor Eric Lindros and John LeClair for their induction into the Flyers Hall of Fame. Vinny had one assist that night on Mark Streit's second period goal. He logged 10:42 in ice time on that night. The wear, as expected, is light with some light black marks on the lower right arm and a small board burn on the right cuff area. 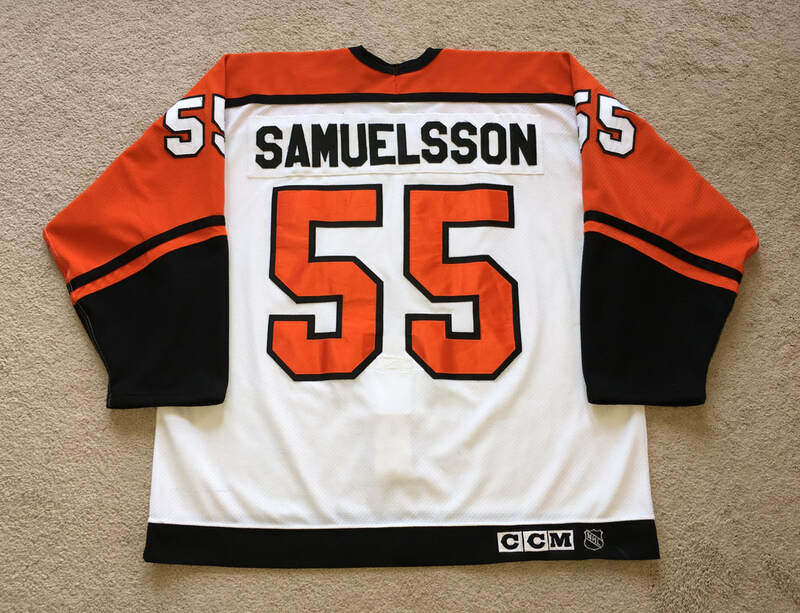 ​ This jersey was worn by Flyers defenseman Thomas Eriksson during the 84-85 campaign. It exhibits light wear with a stick mark under the right arm and a few black markings on the rear #7. The fight strap shows good salting and the jersey is a bit discolored in the white areas due to age. Eriksson played in 72 contests that year posting 10 goals and 29 assists for 39 points. He played in an additional 9 playoff games that year on the way to the Stanley Cup Finals. Promotional Set worn 12/18/03 vs. Tampa Bay. MeiGray tagged on inside lower rear hem. 2nd Set Tag in the inside upper back area. ​ This jersey was worn on 12/18/2003 vs. Tampa Bay. The Flyers would lose in OT that day 5-4. 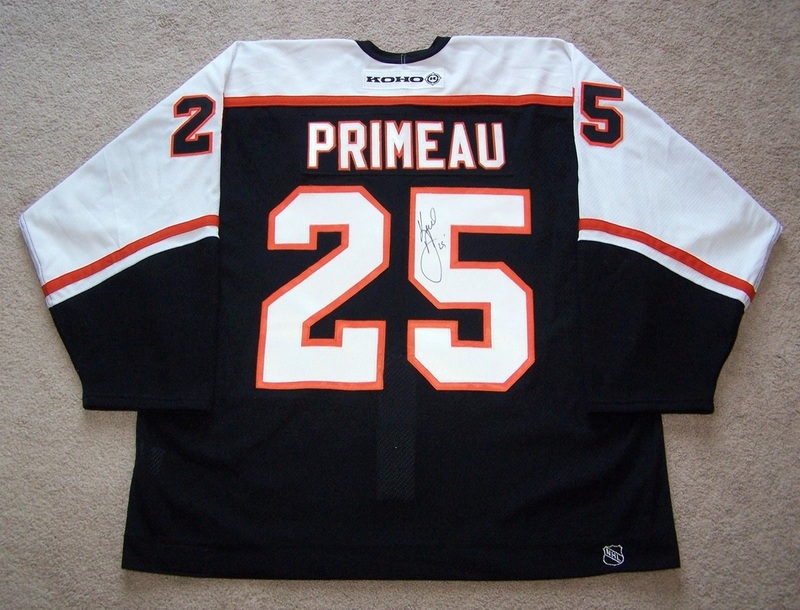 Primeau logged 17:00 on ice that day but was not able to register any points. The jersey exibits light wear with a few light burns on the right cuff area and blue board paint near the right elbow area. 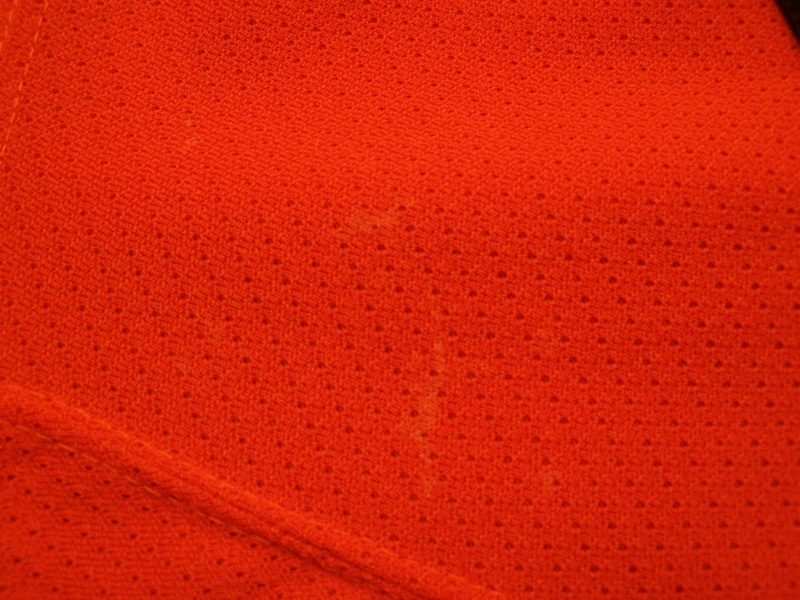 White areas of the jersey show some sweat stains and light discoloration. Surprisingly, there is a fair amount of pilling inside the jersey under each arm. Jersey is signed on the rear #5 as were all of the jerseys auctioned off that day. 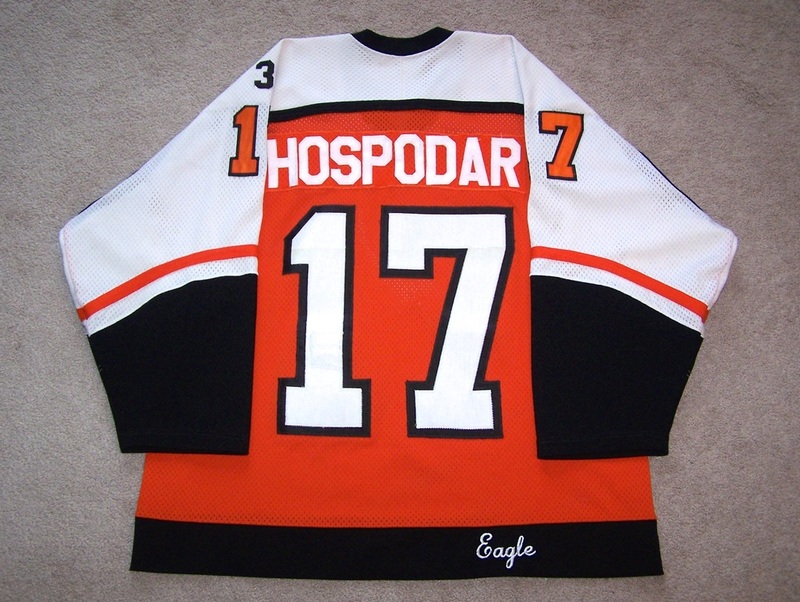 ​ Ed Hospodar wore this jersey for about 8 road games before he was traded early in the season. He scored 2 goals against the NY Islanders and added a few penalty minutes while wearing this shirt. On November 11th 1985 the life of the Flyers All Star goalie Pelle Lindbergh came to an end a day after he drove his Porsche into a wall in front of a South Jersey Elementary School, just miles from the Flyers practice facility. 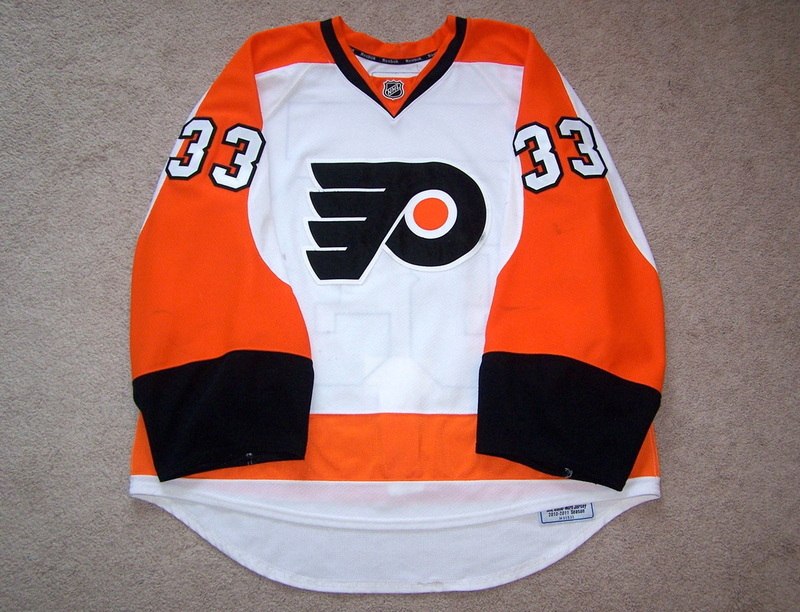 The Flyers organization honored Pelle’s memory by wearing his number “31” on their left shoulder for the remainder of the 1985-86 season. 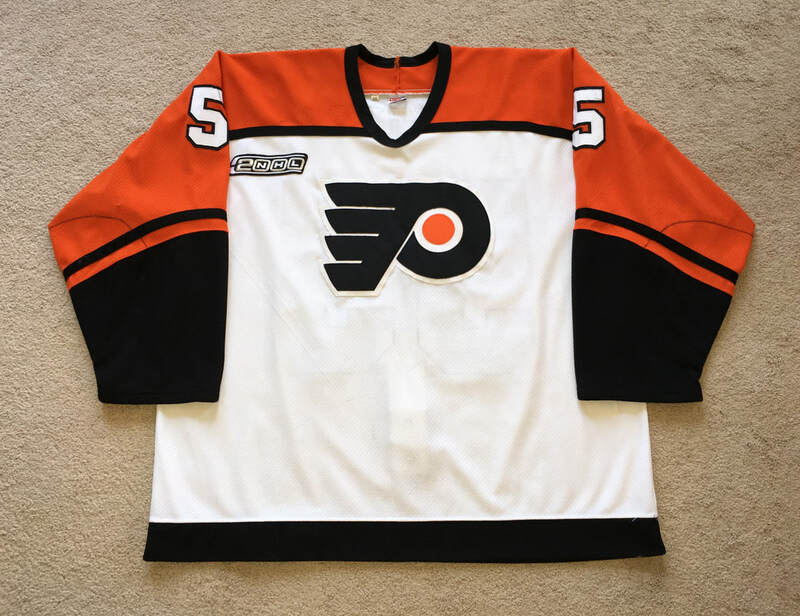 Hospodar was traded from Philadelphia to Minnesota in late November, a mere couple of weeks after Pelle’s death, thereby making this very lightly worn offering which features a double sewn and well salted fight strap a truly rare piece of Philadelphia Flyers history. 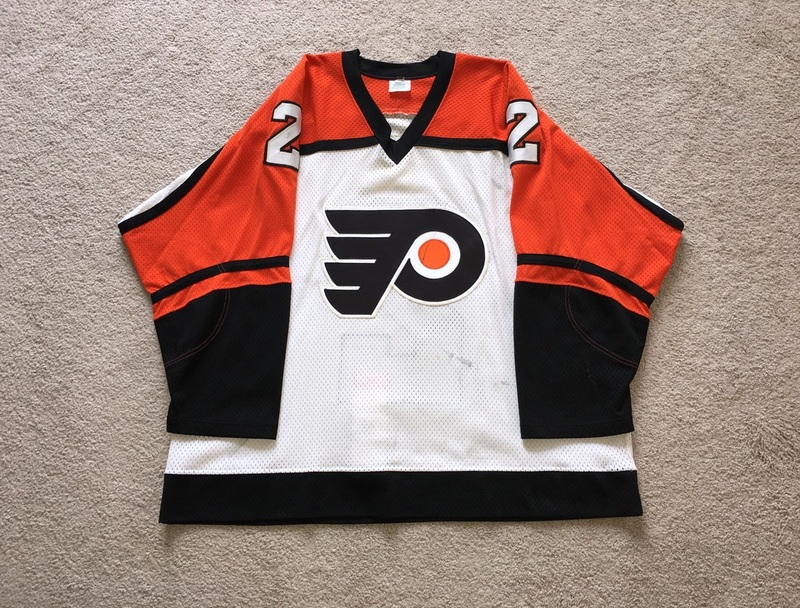 Originally obtained a quarter century ago at the Flyers Wives Fight For Lives Charity Event, this jersey has sat in a private collection since that day. 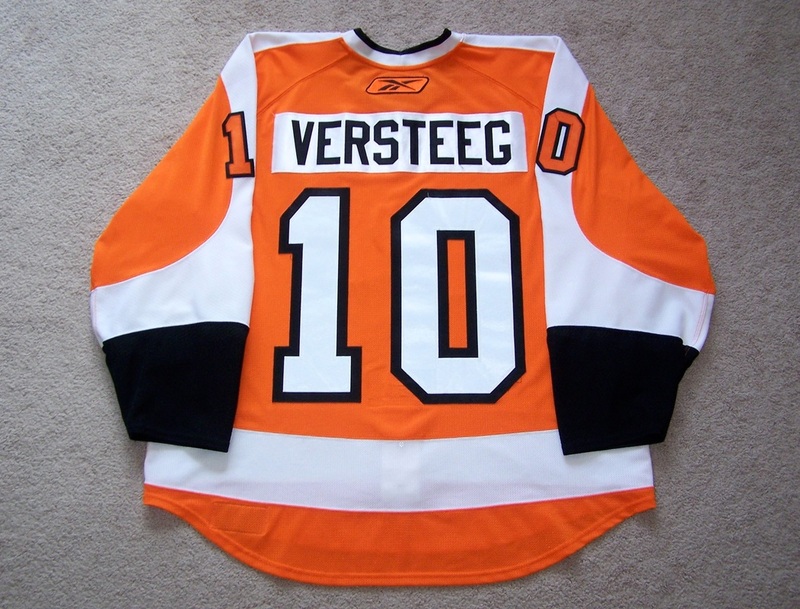 This jersey was worn by Versteeg for a total of 11 games including his home Flyers debut on 2/22/2011 vs. Phoenix. 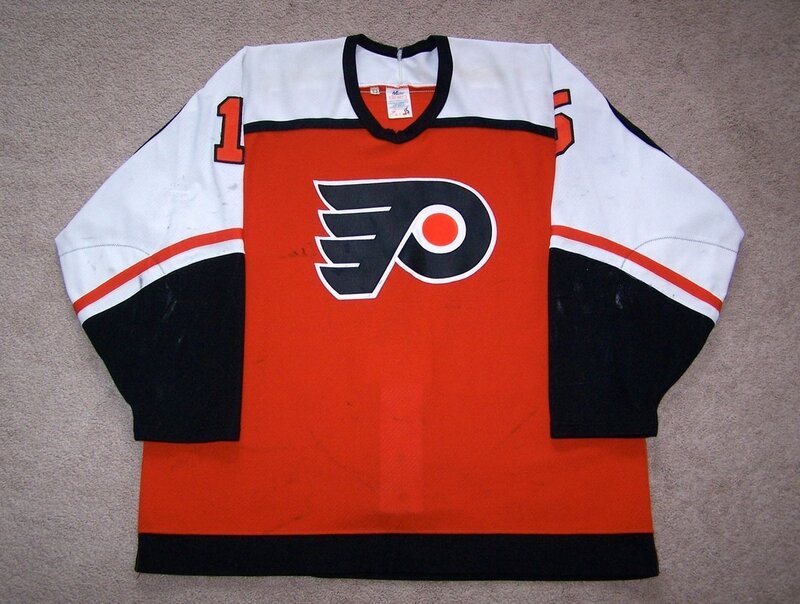 It exhibits light wear with a few small black markings on each elbow area and a small light black 3" stick mark on the lower front of the jersey. The crest and nameplate both show puckering from numerous washings and each sleeve has been customized by tapering the sleeve openings. Kris would score 5 goals and add 2 assists for 7 points while wearing this jersey. MeiGray LOA 2011. 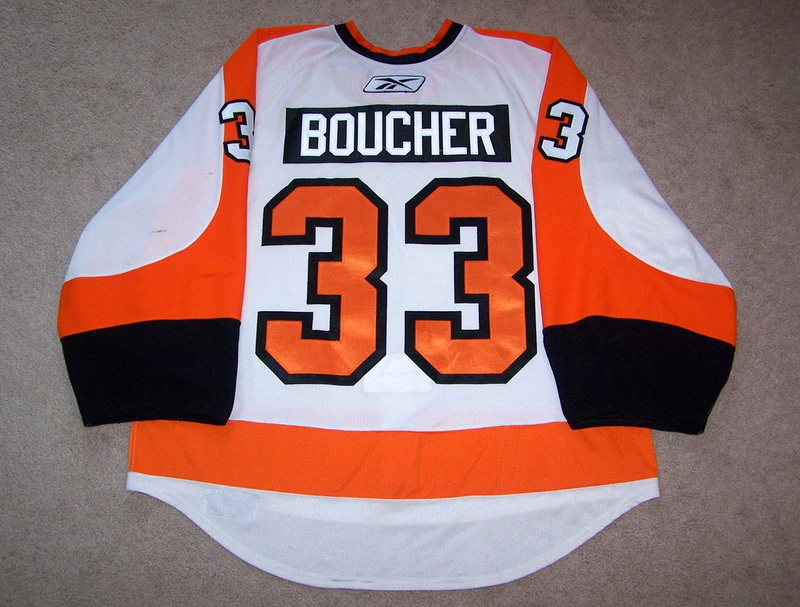 This white set 2 jersey was worn by Boucher for a total of 14 games from 12/28/2010 through 4/8/2011. He posted a 7-6 record while wearing this jersey. The jersey is littered in black puck markings and shows some scattered red goal post paint on the arms and rear. 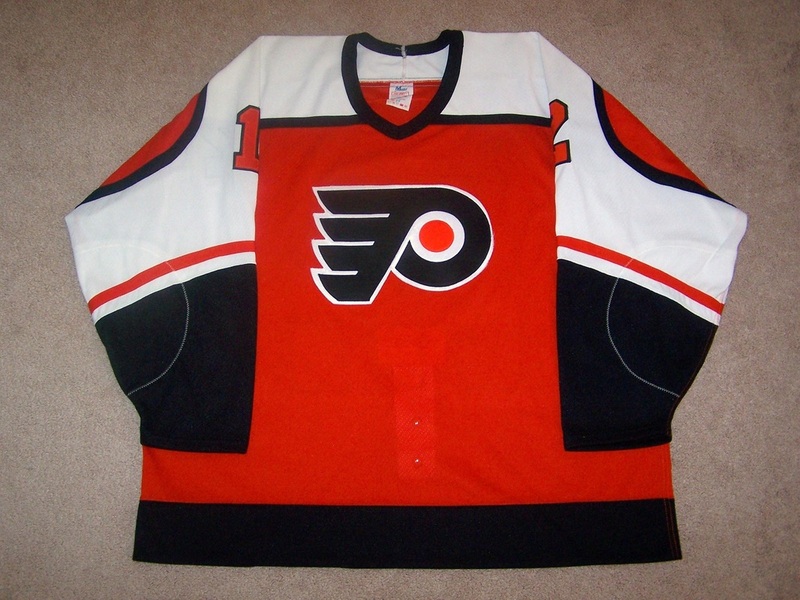 The front bottom portion of the jersey has numerous fabric pulls and pilling. The inside of the jersey shows some minor pilling as well. Photo-matched. 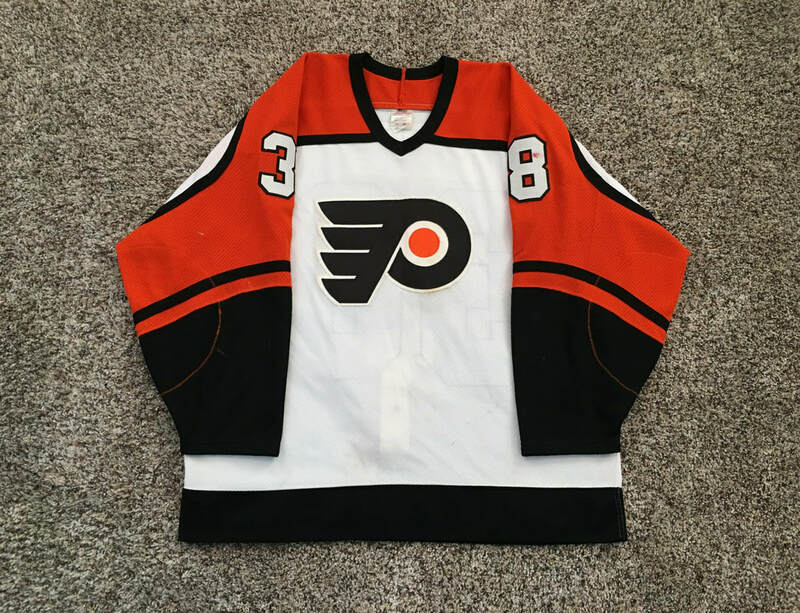 This jersey was worn by Lindros on 3/24/93 vs the New York Rangers at Madison Square Garden in a 5-4 Flyers victory in which Lindros scored his third career hat trick. The wear is light as expected from a one game wonder. There are some markings under the left arm and a small marking on the black piping on the upper left arm. 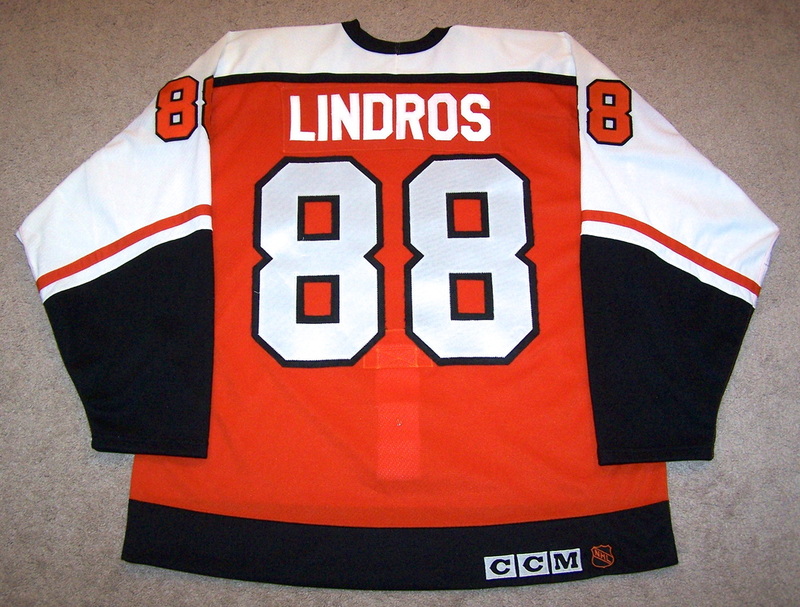 Jersey was signed behind the crest by Lindros and Flyers trainer Jim Evers as were all Lindros game worn jerseys. "March 24/93" can be found in black sharpie next to the signatures. 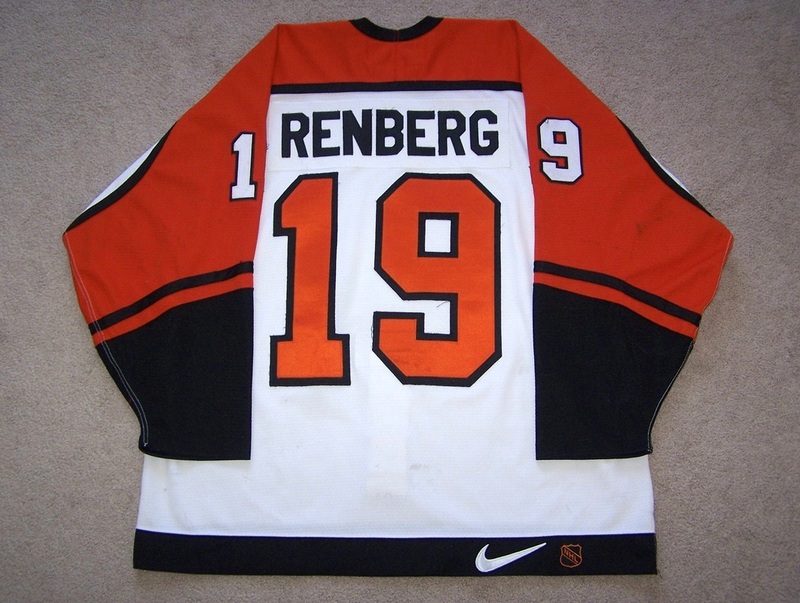 There is a Lindros LOA on Flyers letterhead dated 3/26/1993 specifying that this jersey was worn by Lindros and was sent to San Diego, CA for an American Cancer Society auction that was held on 3/29/1993. The LOA is signed in Eric's own hand. Very nice wear starting with some great burns on the left sleeve and sleeve numbers, a few scattered stickmarks and unrepaired hole. You can't see in the pictures, but one of the #8's on the right sleeve is actually burned and the twill is melted. This is the only gamer I have with that sort of wear. The right sleeve has some nice lighter burns and shows some red board paint just below sleeve numbers. There is a nice size burn just above the "C" in orange piping about two inches long. Back of jersey shows very nice stickmarks on numbers with nice even wear. 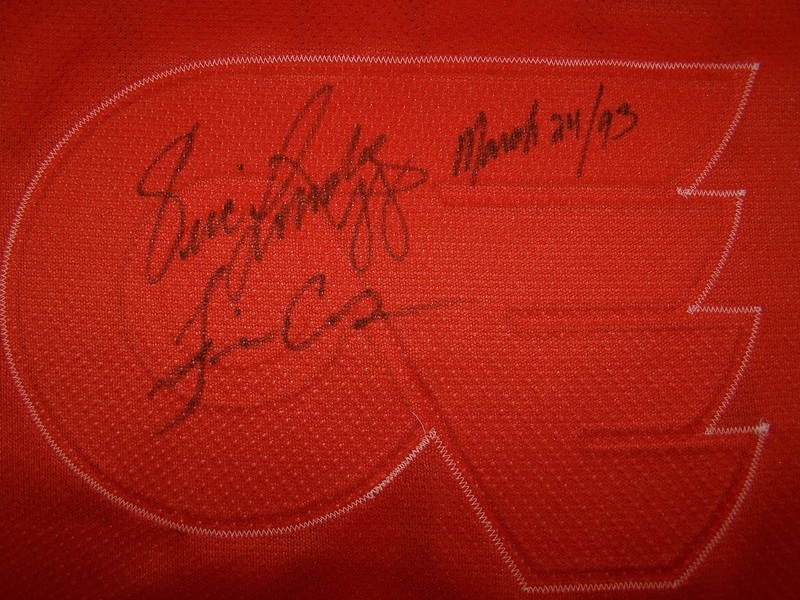 Jersey is signed by Eric and the Flyers equipment manager Jim Evers behind the crest in silver sharpie. Fabric pull on the lower front left side. Light stick/puck mark above left elbow. Stick/puck mark above right elbow and light markings over right sleeve #2. Fight strap shows light salting and fabric pulls on the rear portion of the strap. Possibly a Pre-Season or one game wonder jersey taking into account the light wear. 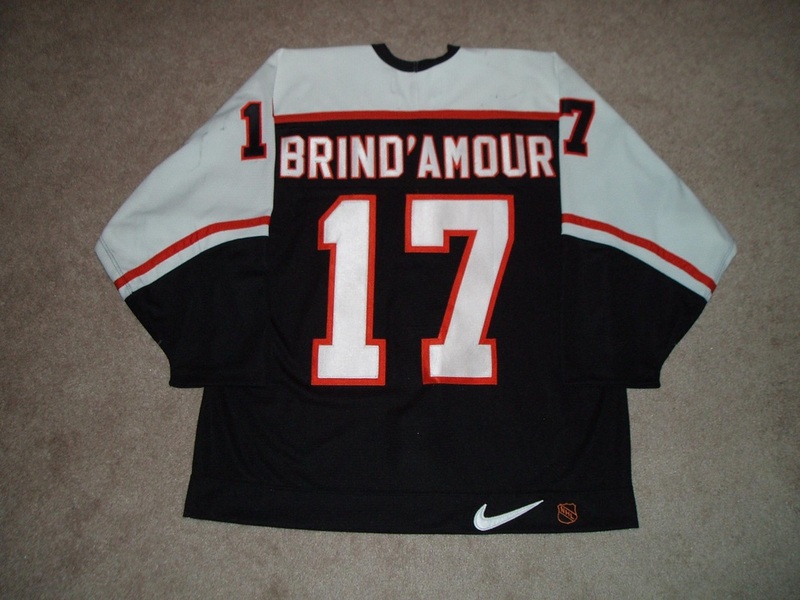 Rod Brind'Amour 1998-1999 Alternate Jersey w/ "A"
This 1998-99 Brind'Amour game worn jersey exibits some stick and puck marks with numerous board burns on the sleeves. MeiGray LOA. 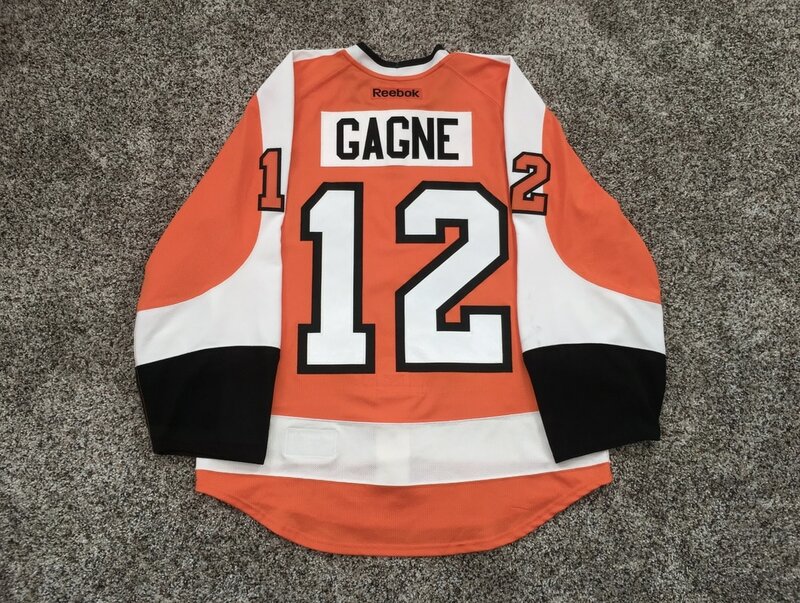 Simon Gagne 2005-2006 Alternate Jersey w/ "A"
Promo jersey worn on 3/25/2006 vs. Ottawa and auctioned off after the game. Signed on rear #2. ​ This jersey was worn by Kerr during the 84-85 regular season on the road. It shows lighter wear throughout with the front of the jersey showing puckering to the crest, a light stick mark under the crest, and a stick/puck mark on the lower front. The right arm shows a few black smudges, a few small burns in the cuff area, a slash mark though the arm numbers, and wear to the sleeve #2 where it's pulling away from the stitching. The left arm exhibits a couple of small black marks, two decent board burns in the cuff area, and a white marking in the sleeve #1. 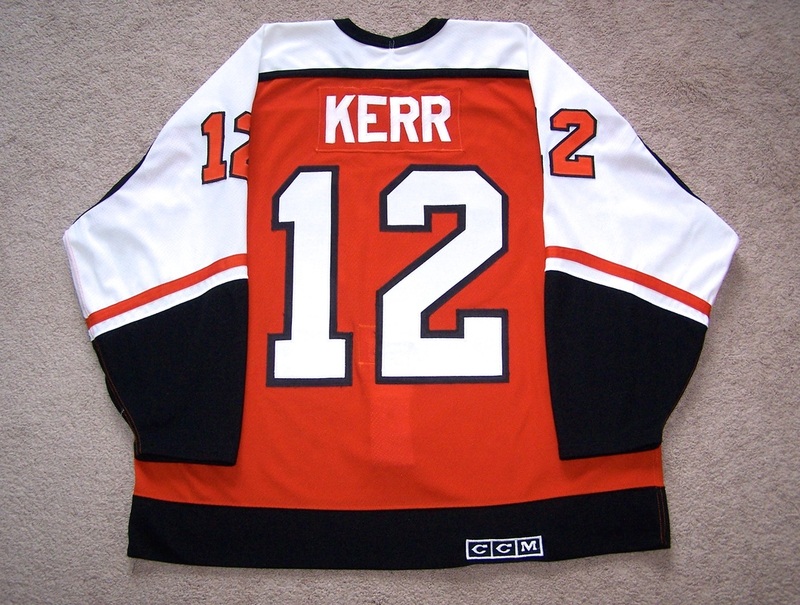 The rear has "Kerr" sewn on a matching mesh nameplate and lighter wear. There is a 1" slice in the rear hem near the Eagle logo. Inside is the original fight strap, XS and Eagle tagging, and some pilling on the right chest area. Great shirt from one of Kerr's four 50 + goal seasons. 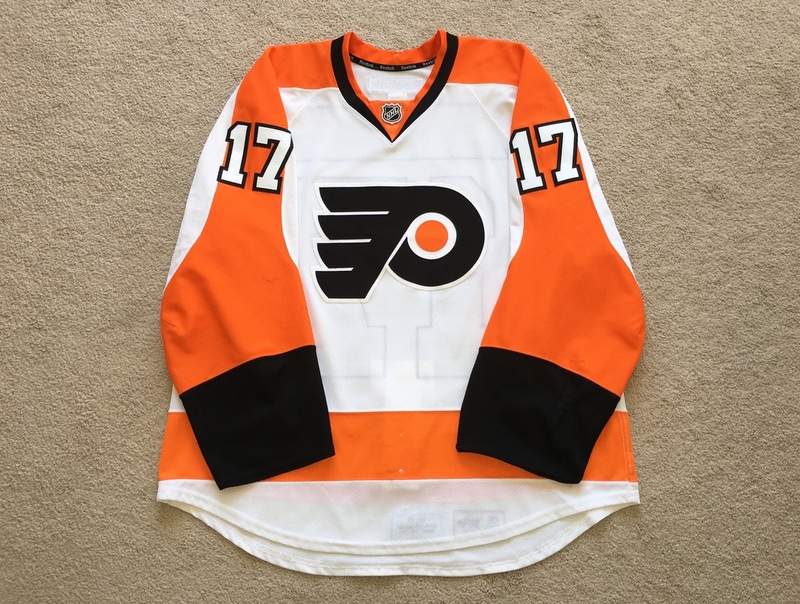 Pretty unique jersey as this is the only set of orange jerseys the Flyers have worn with identical number fonts that were used on the black home and white road jerseys in 2008-2009. Set 1 had the numbers in the retro font. Set 2 had these numbers. And when set 3 was made for the team they switched to the new number font with the thick black outline around the numbers like they wear today. Notice the thin black outline around the numbers on this one. It has the same letter font and the nameplate is made of white twill. 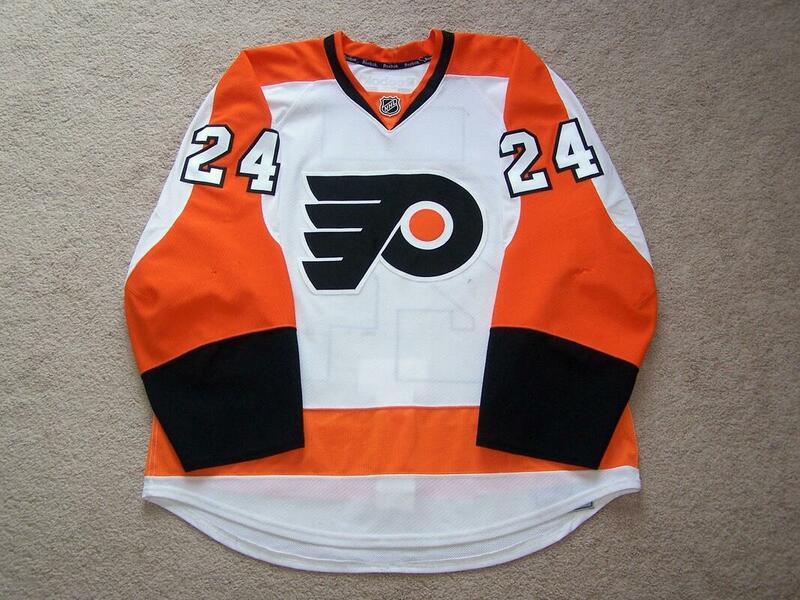 This jersey has substancial wear with team repairs, stick marks, puck marks, and board burns. It has seen a lot of washes and was worn for ten games. 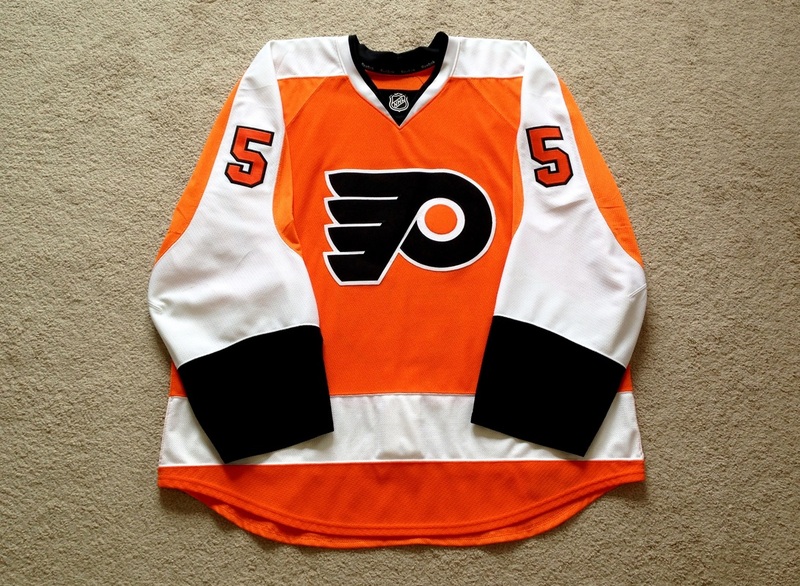 The Flyers went 6 and 4 while wearing this set. 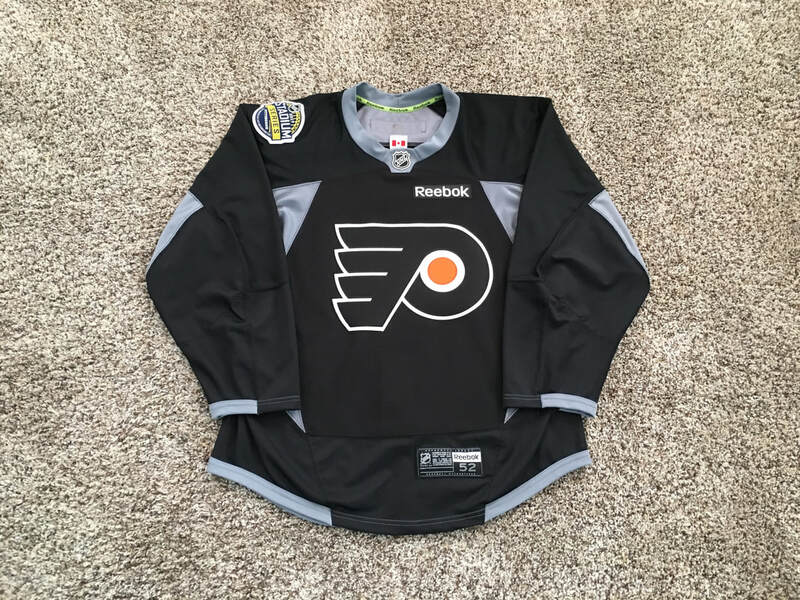 ​ This black size 52 Stadium Series Reebok practice jersey was worn by the Flyers defenseman Shayne Gostisbehere on February 24, 2017, during a team practice at Heinz Field to experience the newly constructed outdoor rink. The jersey features light wear with some faint markings on the crest. The 2017 Stadium Series patch is sewn to the right shoulder. 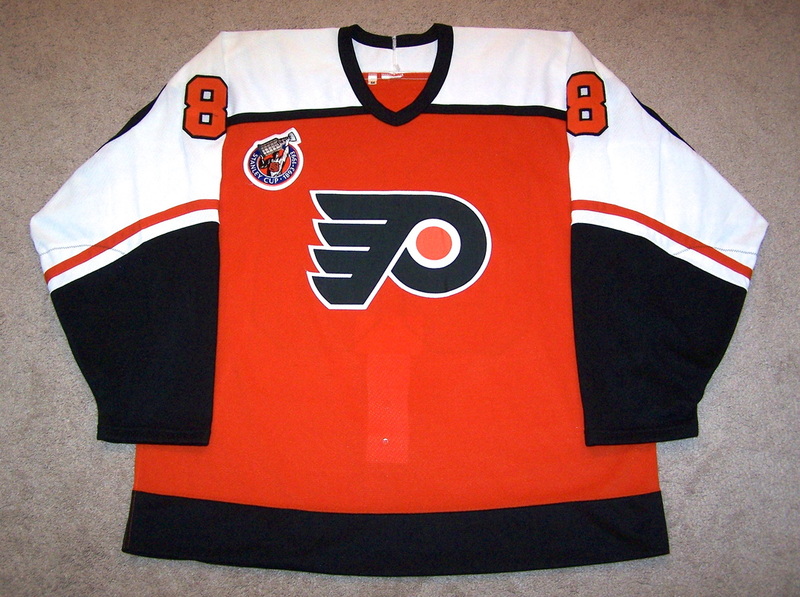 A Reebok patch is sewn to the upper left chest area. Inside, a faded “53” is penned on the neck area above the size 52 tagging. MeiGray tagging resides in the back left hem. 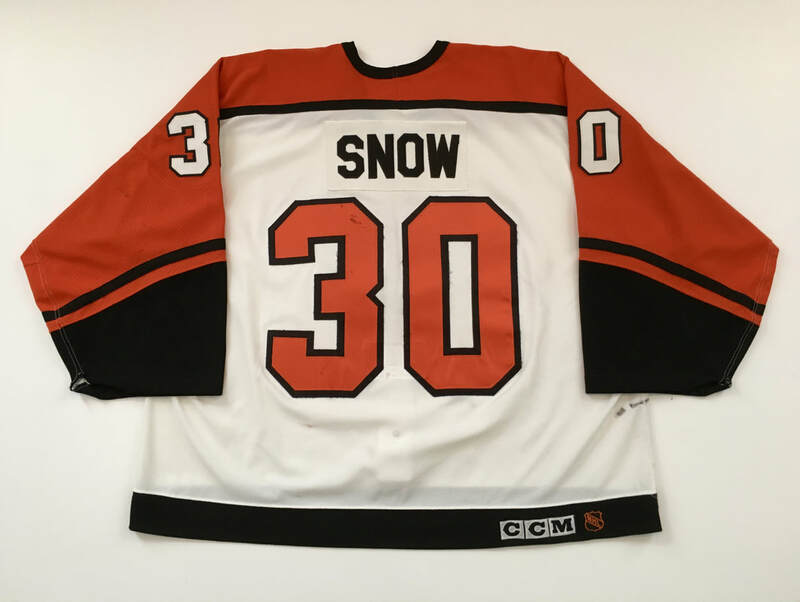 This jersey was worn by Snow during the 95-96 season while backing up Ron Hextall. It has lighter wear which would be expected for a goalie shirt. The front of the jersey has a few stick/puck mark on the lower front. The arms show light wear with a few markings. Each sleeve has been custom hemmed at the cuff. The rear of the jersey shows some red post paint and normal wear of the aging numbers. A real cool shirt that was worn during the Flyers last season at the Spectrum. 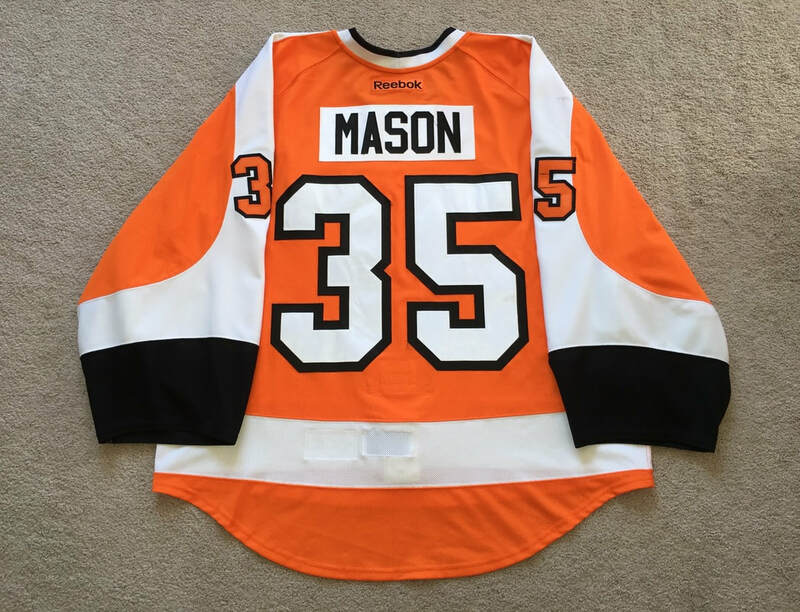 This jersey was worn by Flyers goalie Steve Mason during the 2013-14 season from 12-17-13 through 3-15-14. Mason wore three orange set 2 jerseys switching every period for 15 home games. 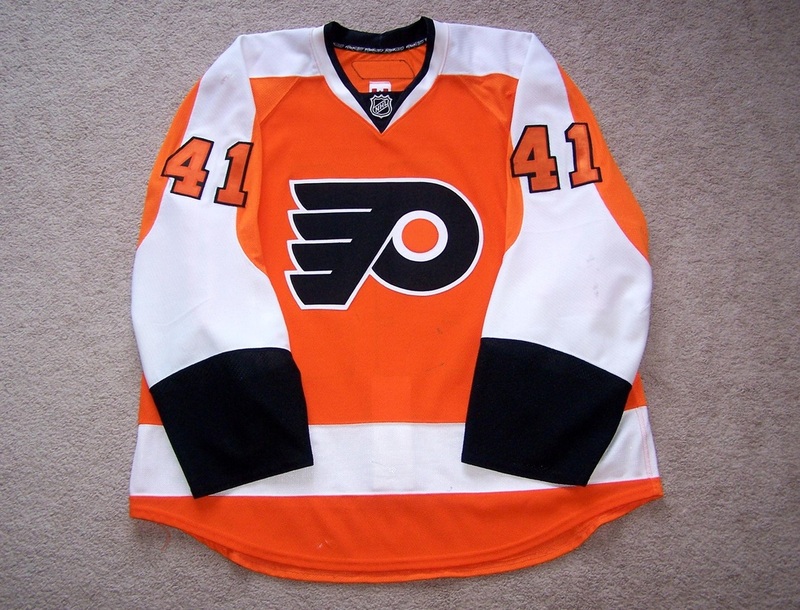 It features typical goalie shirt wear with the front of the jersey showing a photo matched puck mark on the top right front and fraying of the Flyers crest. The right sleeve shows three black markings on the shoulder area, photo matched marks to the sleeve #5, and some light red post paint on the white sleeve portion near the elbow. The left sleeve has a couple of black marks, some red post paint in a few areas, and a nice puck mark under the sleeve #5. The rear of the jersey exhibits even wear with some puckering to the rear numbers and some loose threads on the nameplate letters. 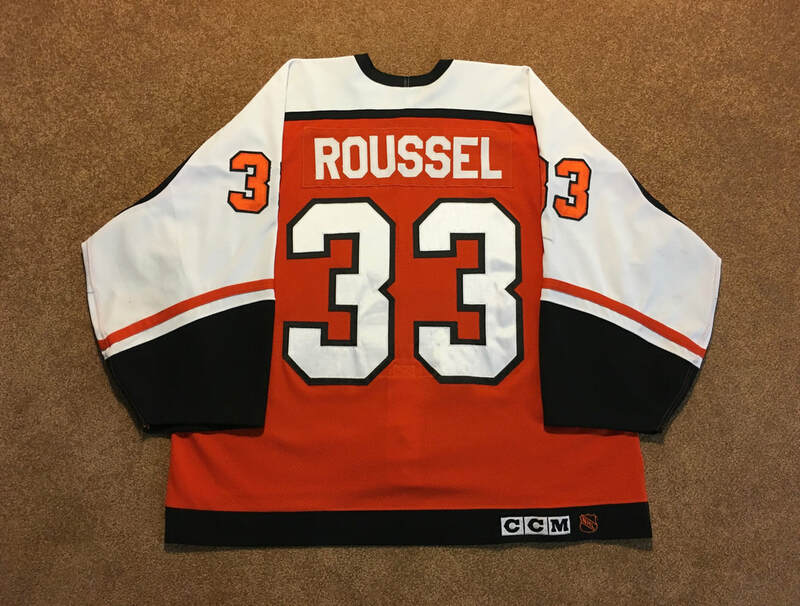 ​ This jersey was worn by Dominic Roussel during either the 94-95 or 95-96 seasons. It features typical goalie shirt wear and is a size 58G. The front of the jersey exhibits black marks, three small un-repaired holes, and a couple of slash marks to the crest. The neck shows pilling from the mask. The right sleeve has been shortened at the cuff and features some red paint and black markings. The left sleeve has been shortened at the cuff as well and has some black markings, a burn mark on the back of the sleeve near the underarm, and a good amount of red paint. The cuff also has a burn at hem and pilling from equipment. The rear of the jersey has even wear with some red paint at the bottom of the left #3. The inside has some black markings and the fight strap is in tact. 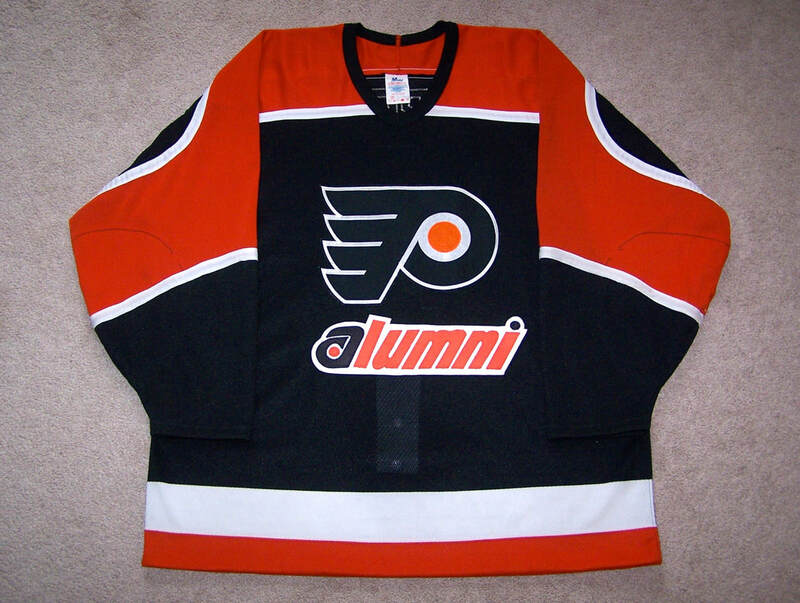 This Parent Alumni jersey features light use with some dirt/staining on the white piping on each elbow, popped stitching on each elbow area, and some fabric pulls on the rear orange portion of the jersey on the upper rear shoulder area (refer to the second picture below). 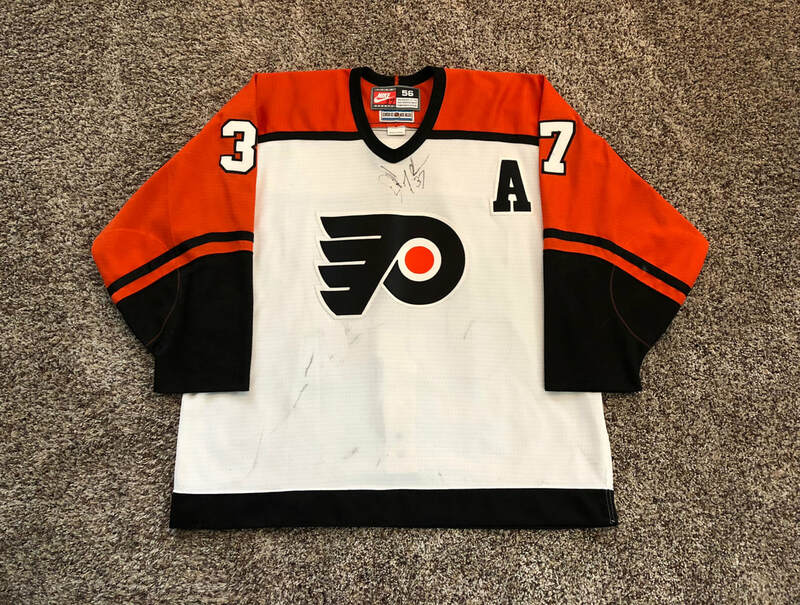 "Bernie Parent autographed Philadelphia Flyers Alumni game jersey (issued for one of only two in which he participated) (Overall EX) Black jersey with Flyers team logo on front has "Alumni" noted below as issued for use in their Annual event. 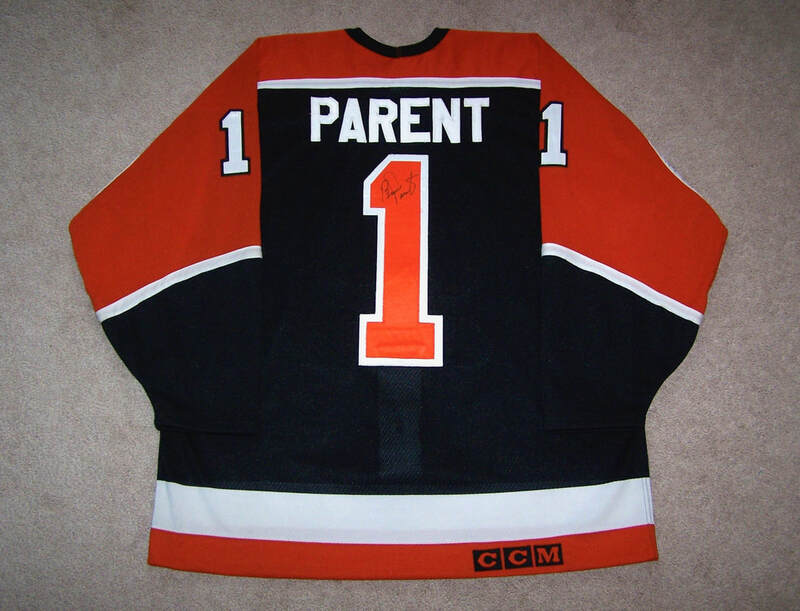 On the back is the name "Parent" with "1" below signed in black marker rating 8 out of 10. "Maska Air-Knit" tag in collar has size "52" handwritten on along with the word "Goal." Fight strap remains on interior. Jersey displays light usage wear and it noteworthy in being issued for his use in one of only two such events in which he participated." 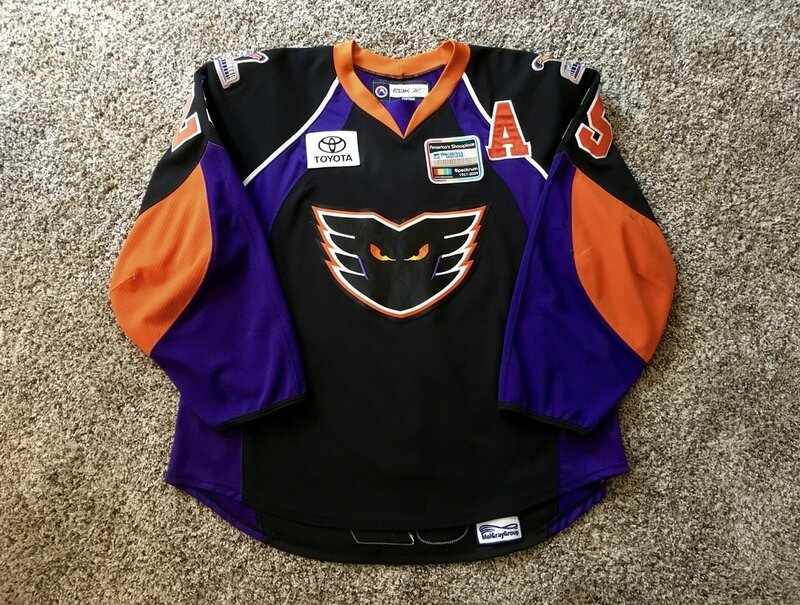 Ben Holmstrom 2012-2013 Road Jersey w/ "C"
​ This jersey was worn by Adirondack Phantoms Captain Ben Holmstrom during the 2012-2013 AHL regular season. It shows a few black markings on the lower front of the jersey, a few burns and markings on each arm, and nice even wear on the back. Inside shows some pilling on the rear tail of the jersey. He suited up for 22 games that year for the Phantoms scoring 2 goals and adding 6 assists for 8 points before sustaining a right knee injury during the Phantoms' 4-3 shootout victory over the Syracuse Crunch on 12/8/2012. The injury would keep him out of the lineup for the remainder of the 2012-13 season. Philly Express tagging on lower inside rear of the jersey. 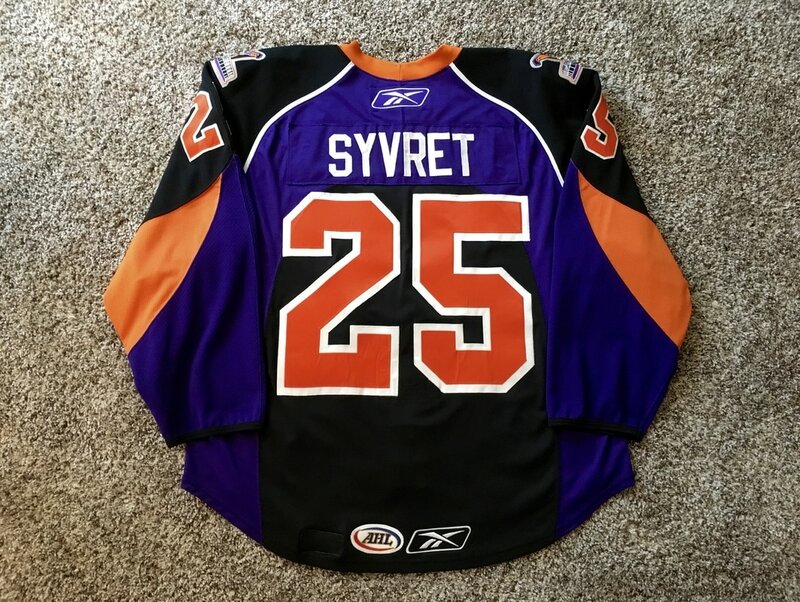 ​ This jersey was worn by Danny Syvret during the first half of the 08-09 Phantoms season. 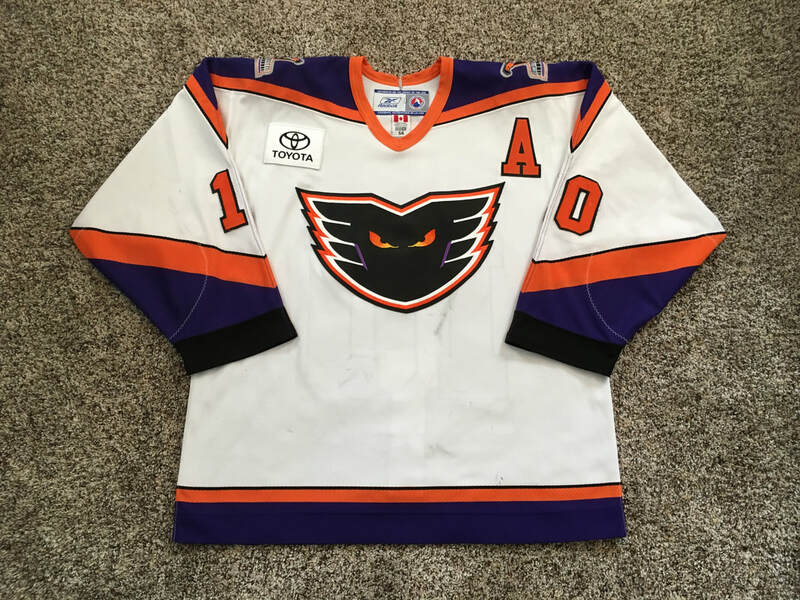 The front of the jersey has nice even wear with some puckering to the Phantoms crest from washings, Toyota sponsor patch on upper right chest, America's Showplace Spectrum 1967-2009 patch on the upper left chest, and Alternate Captains "A" sewn next to the Spectrum patch on the left side. The right arm has two light board burns in the purple portion of the sleeve. The left arm features a 1" black mark in the elbow area, three board burns in the elbow area, and an un-repaired hole next to the elbow area. 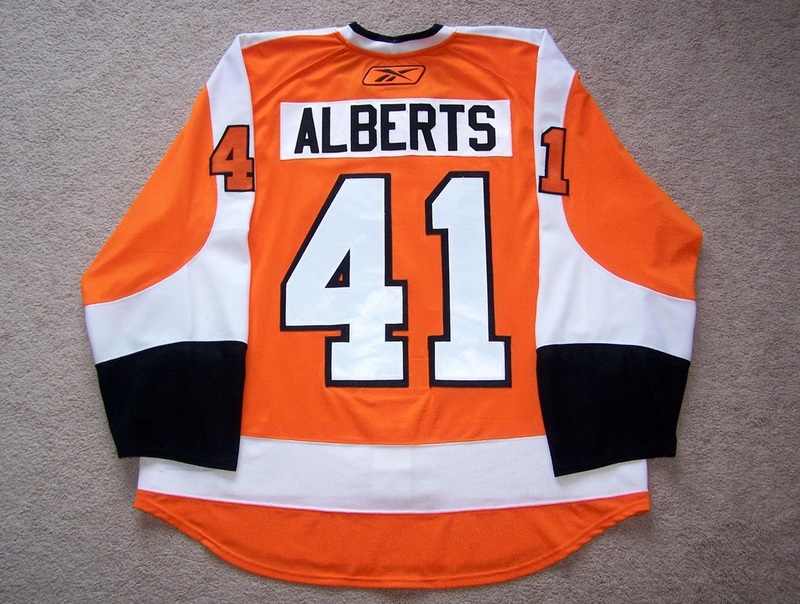 The rear of the jersey has slight puckering to the rear numbers and AHL patch on the lower tail of the jersey. The inside of the jersey has a size 56 neck tag, MeiGray Group patch, and pilling to the right and left sides in the midsection area. 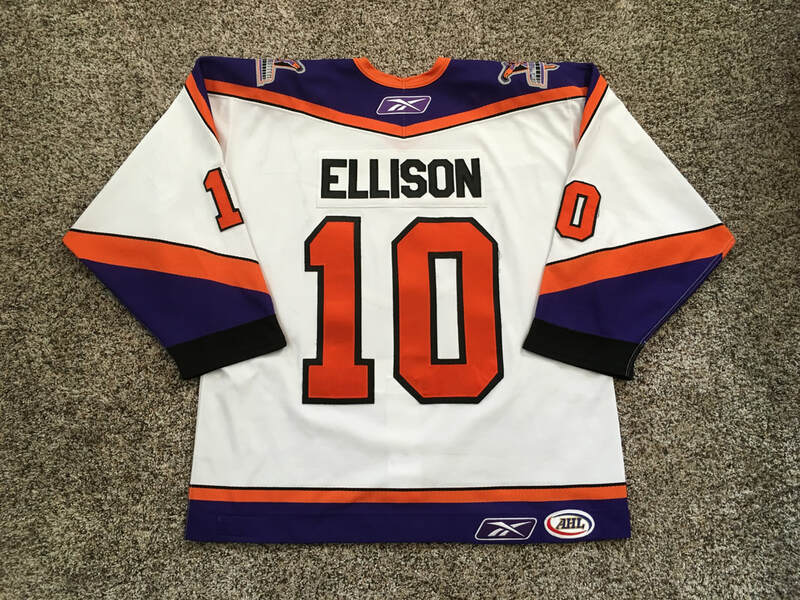 Matt Ellison 2006-2007 Home Jersey w/ "A"
​ This jersey was worn by Matt Ellison during the first half of the 2006-07 Phantoms season. It features lighter wear with the front showing black markings throughout. 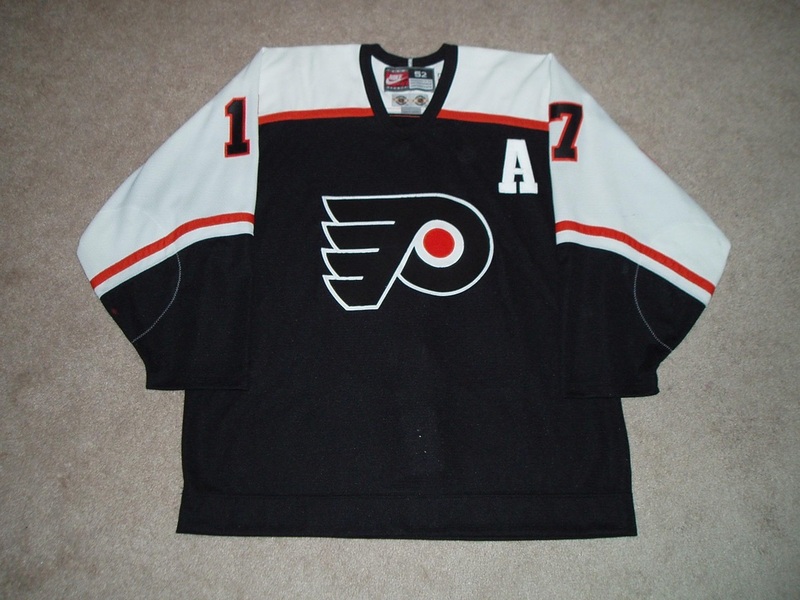 The Alternate Captains "A" sits on the left chest area and the Toyota sponsor patch is sewn to the right side. The right arm features black markings, board burns, and fraying to the sleeve numbers. The left arm has black markings and small board burns on the sleeve numbers. The rear of the jersey shows even wear and is mostly free of markings. The inside of the jersey has a size 54 neck tag and the original fight strap remains intact. ​ This home sweater was worn by Mark Eaton during the 1998-99 season. 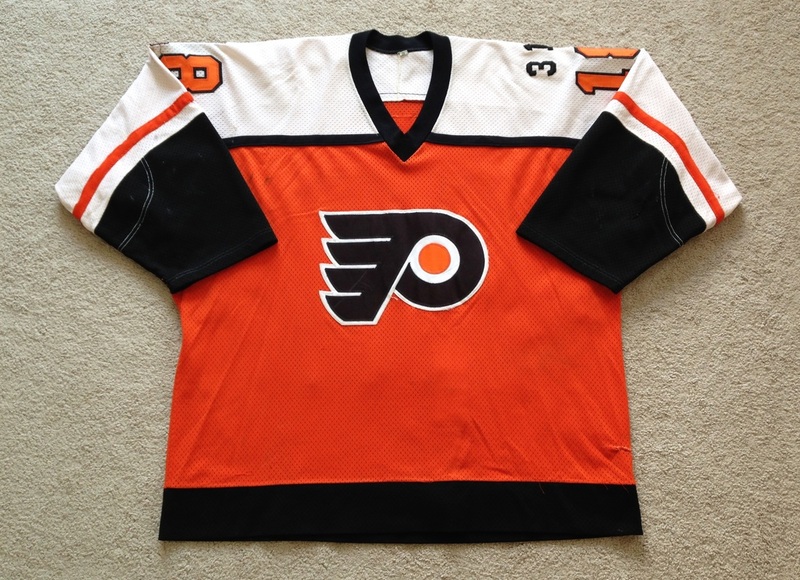 It shows good wear with the front of the jersey exhibiting numerous black markings, a couple of slashes on the crest, and fabric pulls and pilling on the lower right and left sides. The right sleeve shows two board burns in the elbow area, fabric pulls, white and black marks to the sleeve #5, and more black markings throughout. The left sleeve has fabric pulls, a small board burn in the elbow area, and black markings. The rear shows nice even wear with black markings, fabric pulls, and pilling near the lower right and left portions of the jersey. The rear number 5 shows a nice autograph in Eaton's own hand. The inside of the jersey has a size 54 fly tag, fight strap, and heavy pilling from the elbow pads. 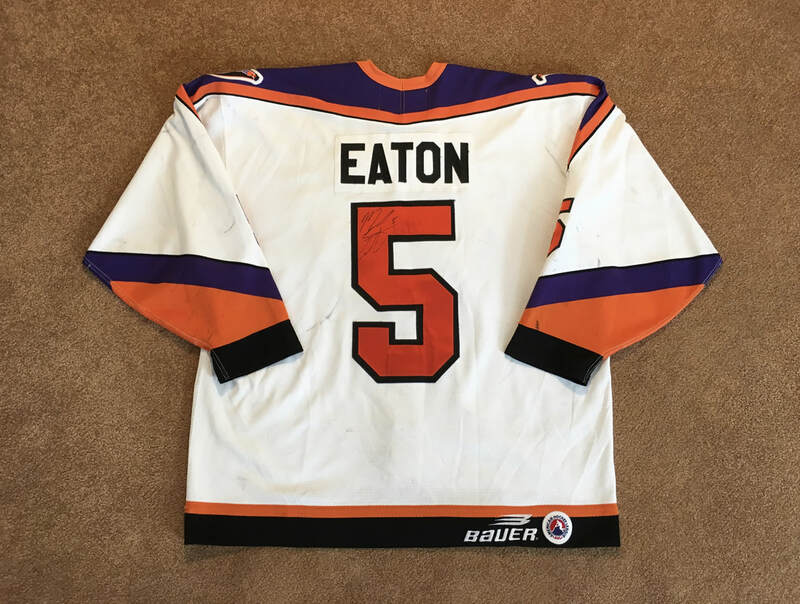 A nice early Phantoms gamer that was worn in front of the Phantoms faithful as Eaton went to battle at the Spectrum! 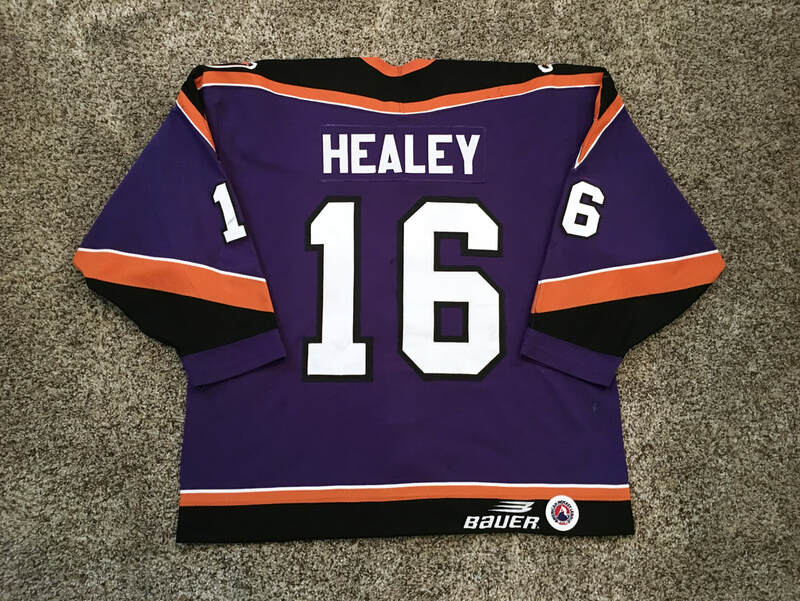 This inaugural year road jersey was worn by Paul Healey throughout the 96-97 season. 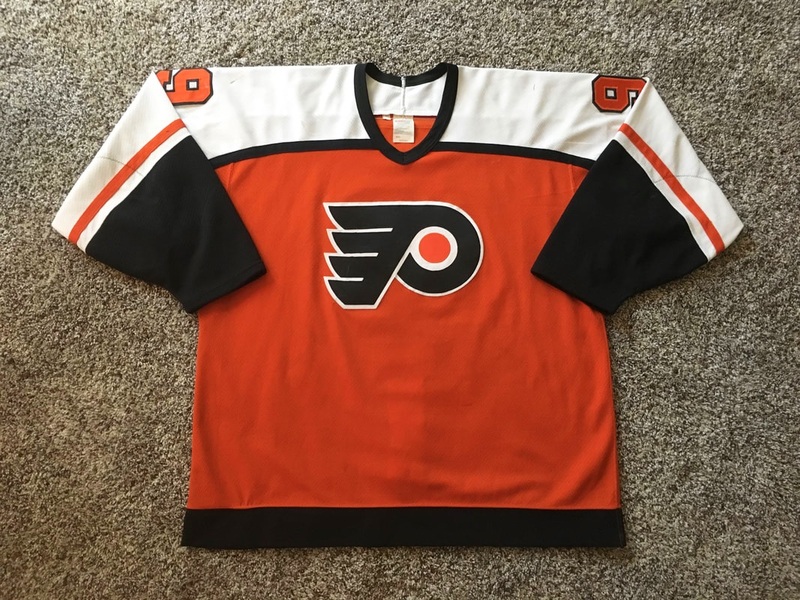 The jersey features really nice wear with the front showing a few slashes through the crest, black marks, a team repair on the left hem, and board burns on the right shoulder. The right arm has seven nice repairs in the elbow area, numerous board burn marks, black markings, and blue dasher paint on the #1. The left arm shows two team repairs, a number of board burns, a nice 1.5" un-repaired slice, and black markings especially to the #6. The abuse continues on the rear side of the jersey with more blue dasher paint, fabric pulls, black markings, and a couple of small board burns. The inside has the fight strap intact, a size 54 fly tag in the neck area, and a good amount of inner pilling. 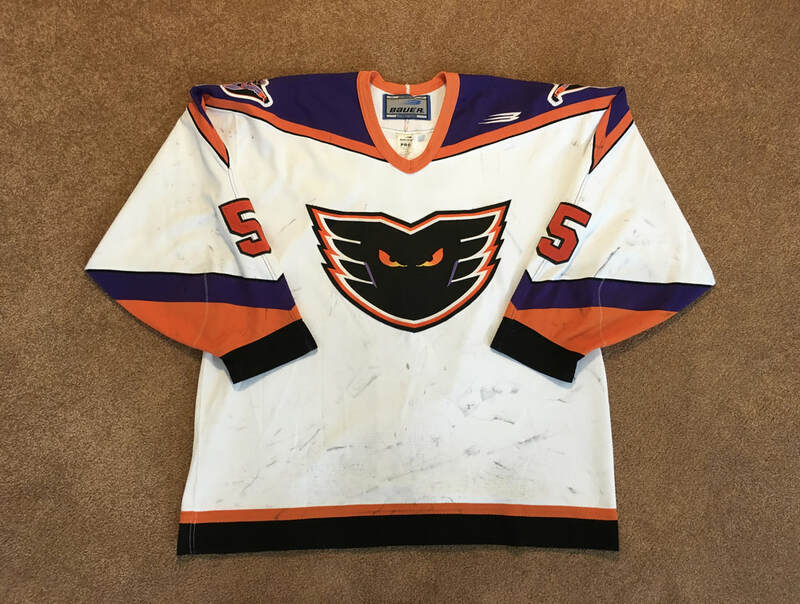 This is a well worn Phantoms first year road sweater!